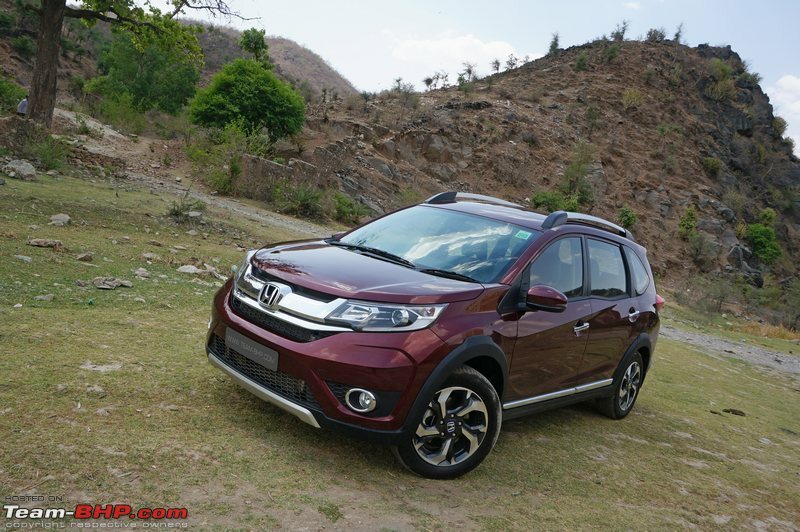 The Honda BR-V has been launched in India at a price of between Rs. 8.75 - 12.90 lakhs (ex-Delhi). •	Compliant ride quality & neutral handling. 210 mm of ground clearance! 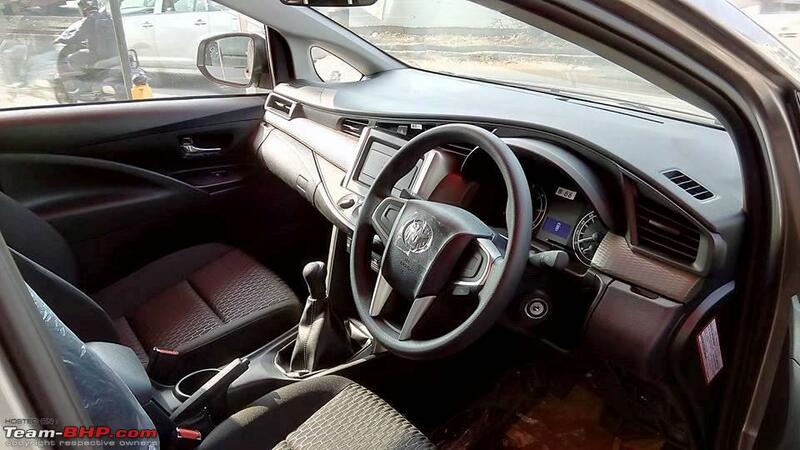 •	Equipment includes projector headlamps + LED pilot lamps, leather upholstery, keyless entry & go, roof-mounted rear air-con, paddle shifters etc. This review has been jointly compiled with Rehaan. Thanks to him for the expert observations & photography! Last edited by GTO : 24th May 2016 at 20:13. 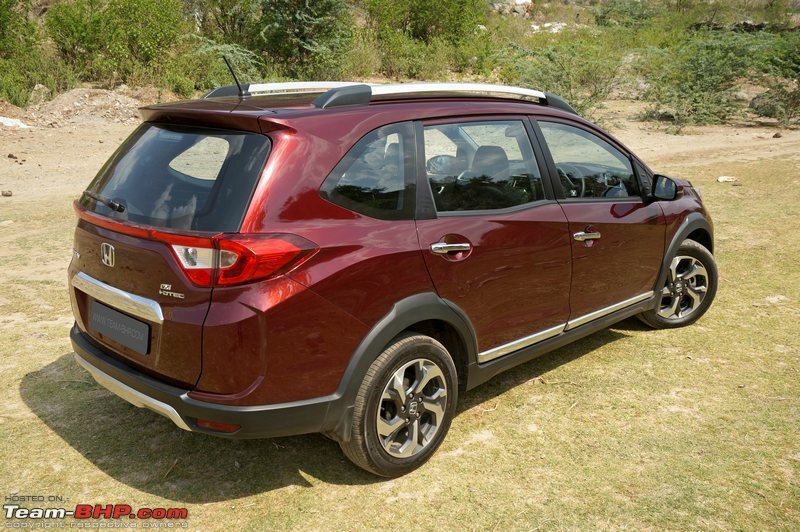 The urban SUV segment is growing at a fast pace in India. 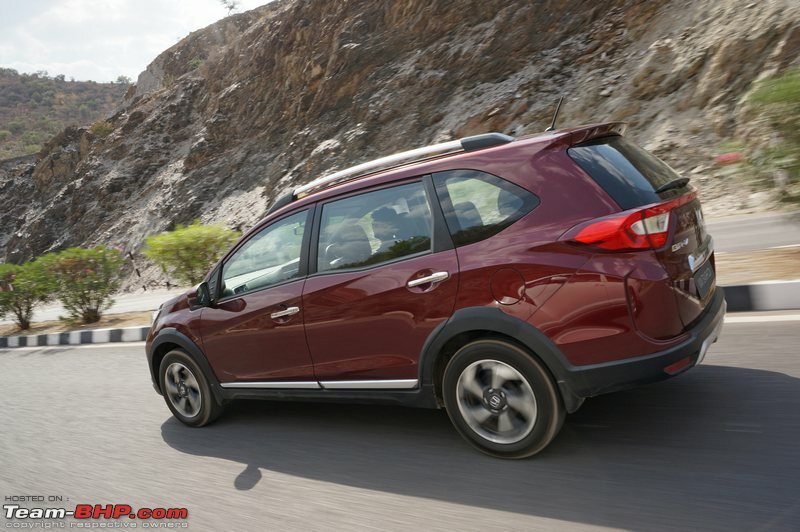 According to Honda, it grew at a rate of 43% in the last fiscal. 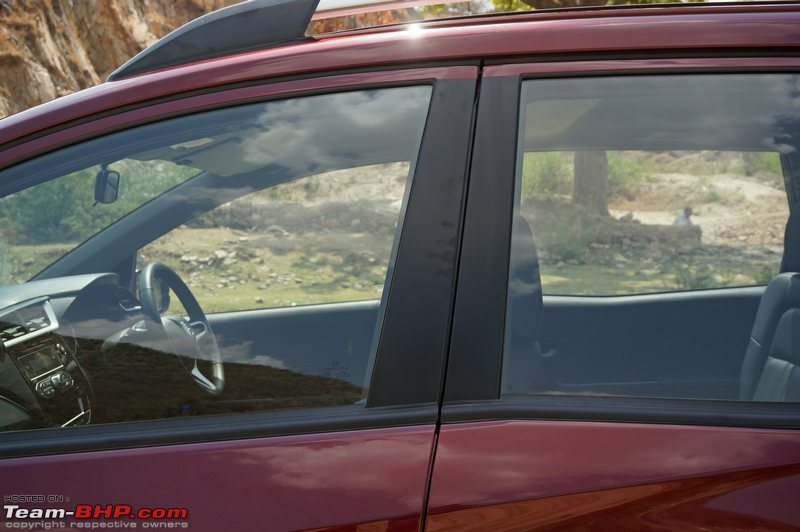 Cars in this category are SUV-like in appearance, but not as large or unwieldy. This makes them easier to drive & park in an urban environment. Renault's Duster was the first entrant and became an instant hit due to the lack of competition. 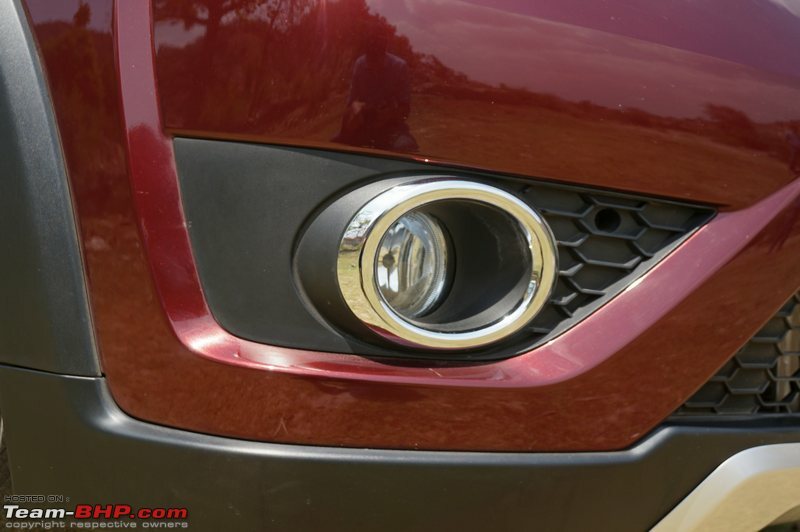 Ford was next with the EcoSport, and later came the Creta & Vitara Brezza. Importantly, each of these products has garnered success, though of course in varying degrees. 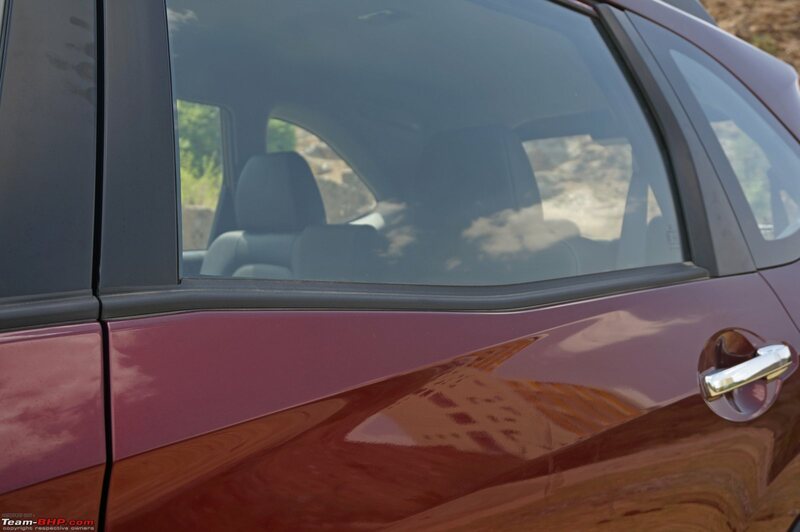 Honda is late to the affordable SUV segment. However, it has arrived with some advantages. 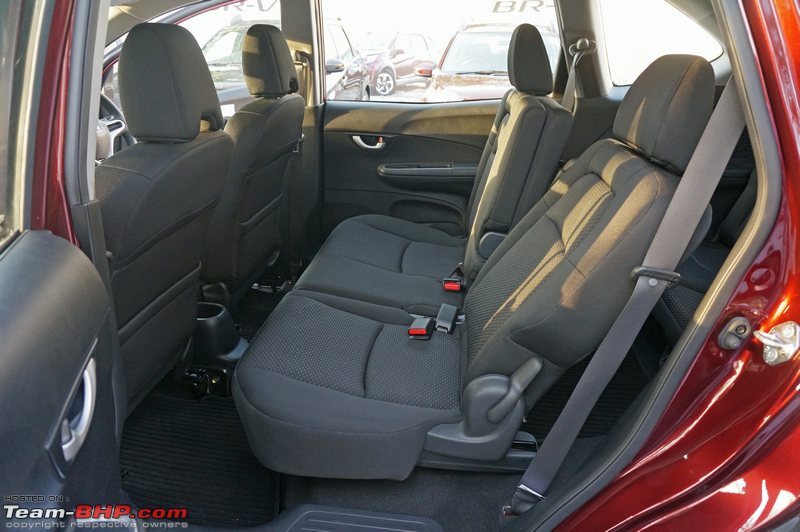 For one, unlike its direct competitors, the BR-V offers 7 seats. This could be a major draw among large Indian families. The BR-V is longer than any of the SUVs mentioned above. In-cabin space is healthy and the engines are competent. BR-V stands for 'Bold Runabout Vehicle' (I can hear you chuckle ). It was developed by Honda's R&D arm at Thailand. The first sketches of this car were released in June 2015 and in August, the BR-V made its public debut at the Gaikindo Indonesian Auto Show. Later in the year, Team-BHP Moderator Samurai got behind its wheel in Japan (link to report). Honda has a lot riding on the BR-V, especially since the Mobilio flopped. The BR-V uses the same platform as the Brio, Amaze & Mobilio. Of the 3, it's most similar to the Mobilio. Measuring 4,453 / 4,456 mm in length, 1,735 mm in width and 1,666 mm in height, it is the largest car based on this platform too. 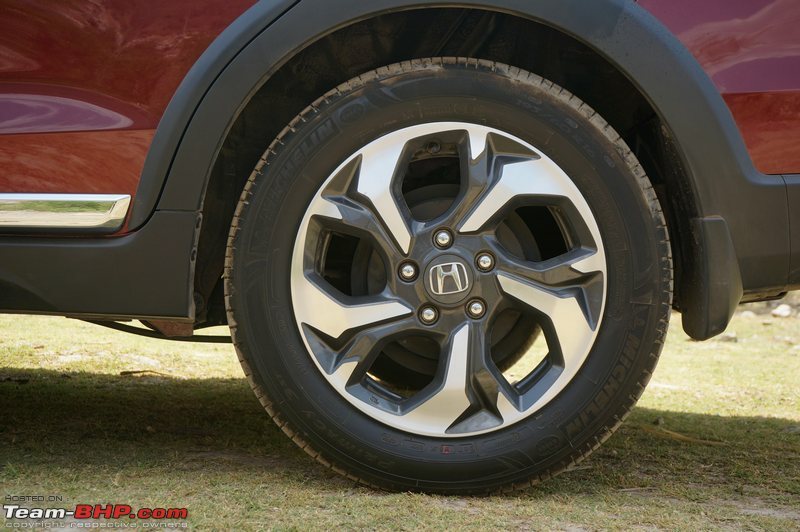 Interestingly, the BR-V's wheelbase is 10 mm longer than that of the Mobilio! Localisation levels are over 90% already (unsurprisingly due to part commonality with other Hondas). 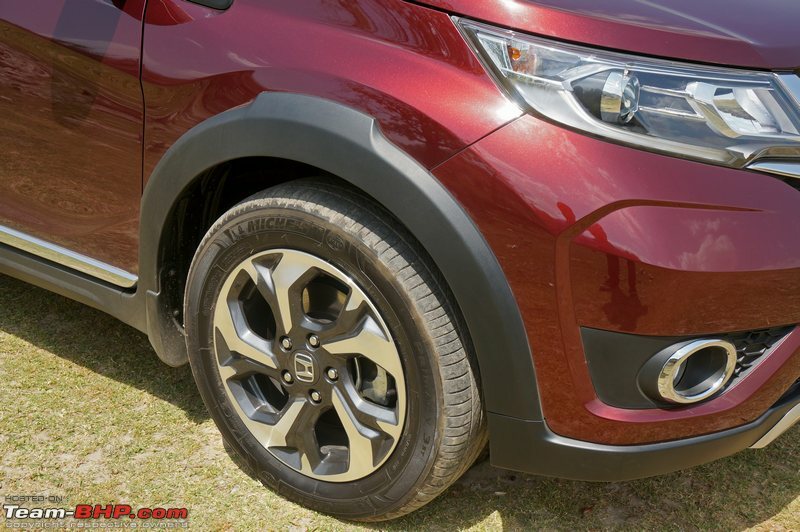 The Creta & Vitara Brezza adopt clean styling, while the EcoSport is funky. 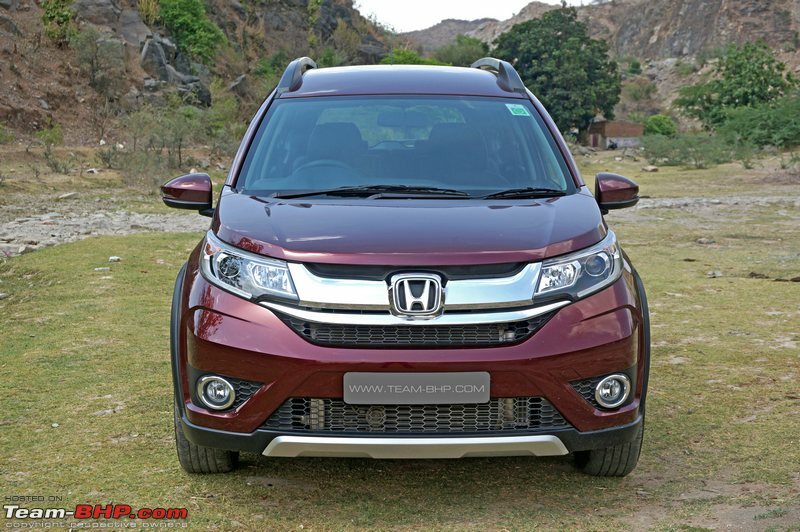 The BR-V is neither; its styling won't appeal to purists (especially from the side), although Honda has put in all of the usual 'urban SUV' elements into the package. 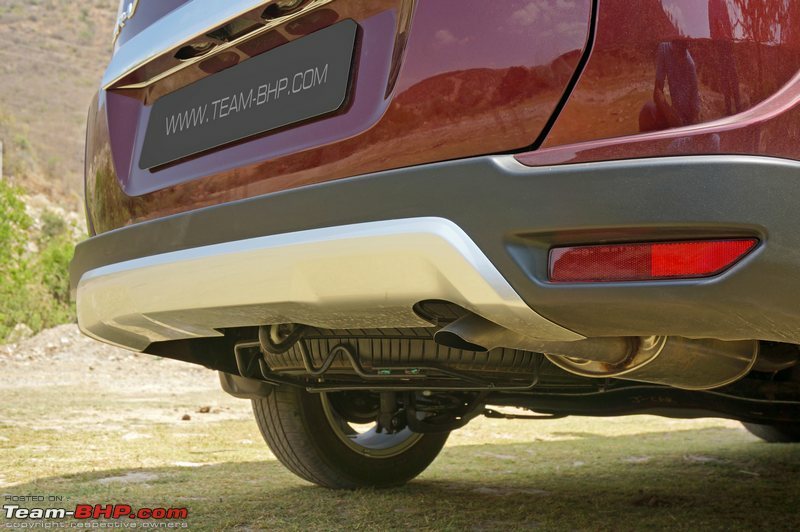 The BR-V has ground clearance of 210 mm, roof rails, black plastic cladding (along the bumpers, sides & wheel arches) and faux skid plates at the front + rear. 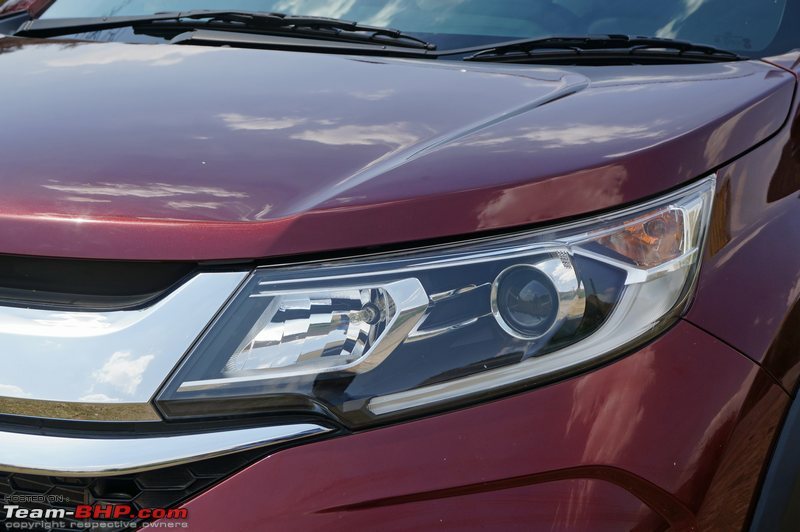 Viewed from the front, the BR-V does look good. Honda has done a fair job of distinguishing it from its siblings (unlike the Mobilio's face which is identical to that of the Brio & Amaze). 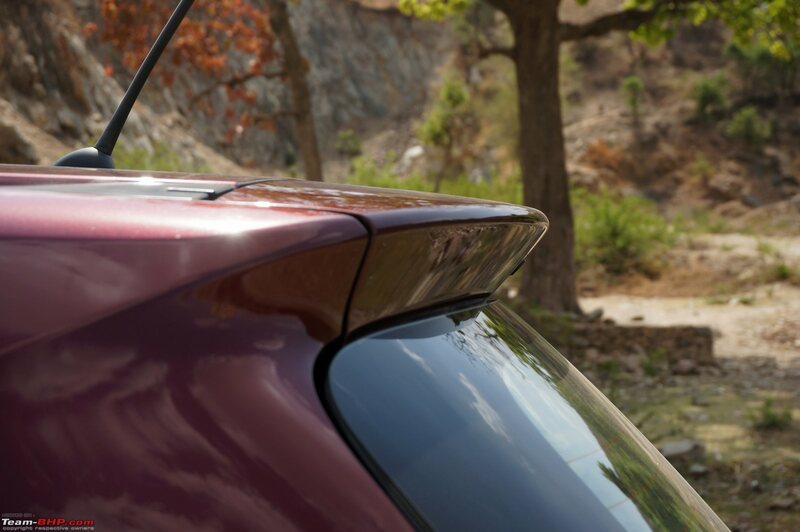 There is a sculpted bonnet which doesn't slope downwards as sharply as the Mobilio's. The wraparound headlamps are equipped with projectors and daytime running lights. 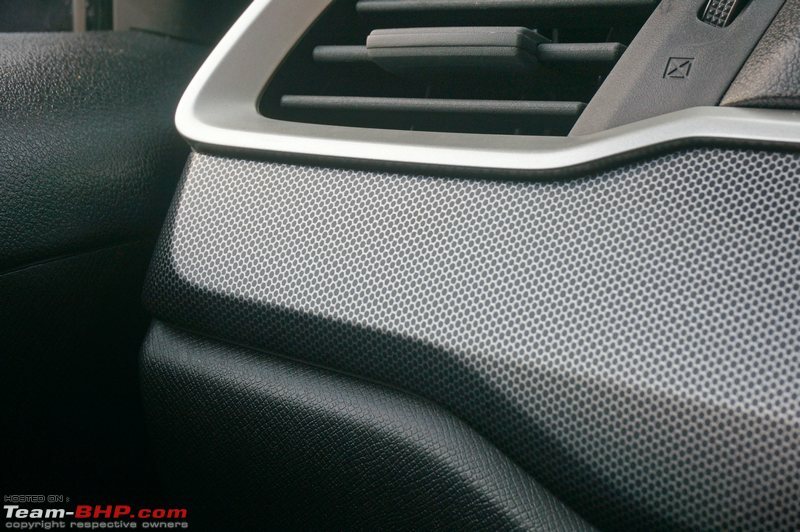 In between is a honeycomb mesh grille. 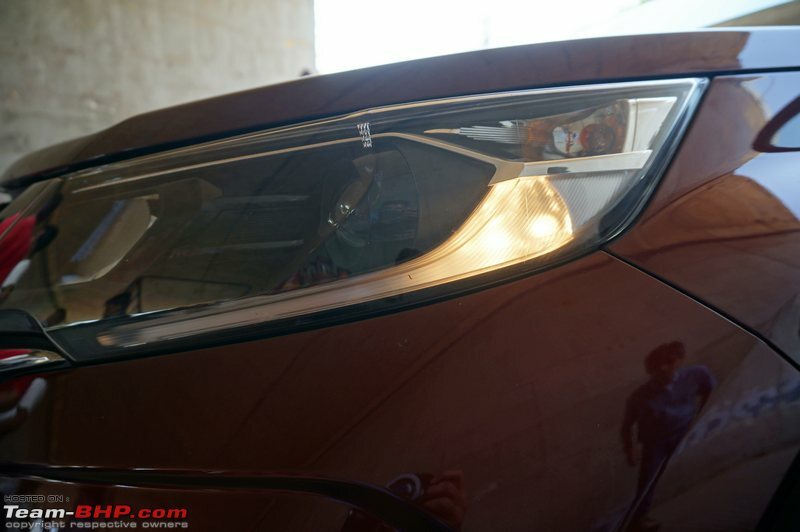 A thick chrome strip, similar to the one seen on the City, runs between the two headlamps. Additionally, a thinner chrome strip runs under it and appears to merge into the lights. 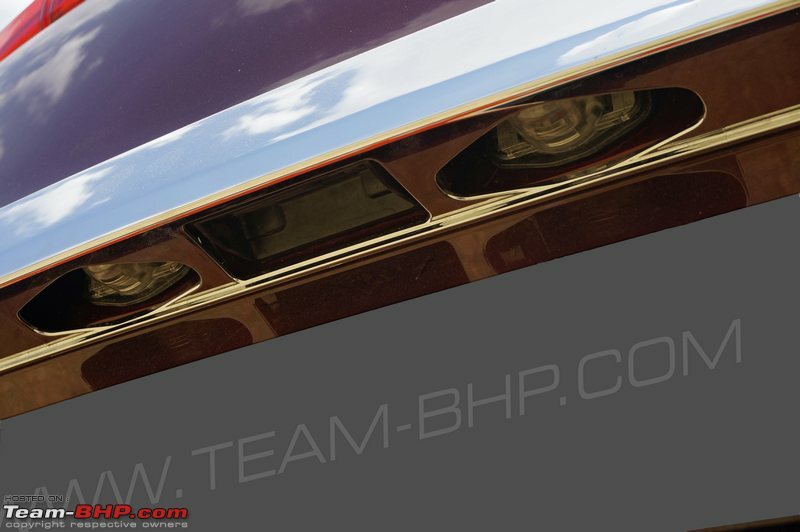 The bumper has a wide air-dam and houses a pair of foglamps with chrome bezels. The car gets flared wheel arches for some muscle. 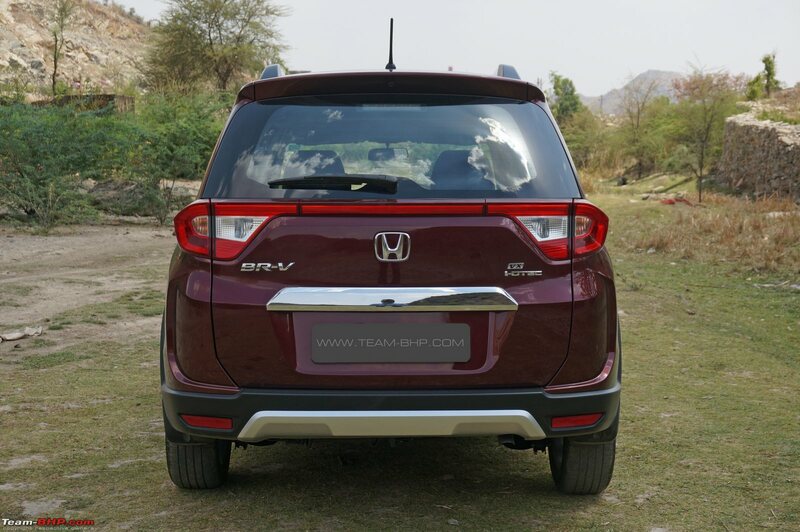 Viewed from the side, the length of the BR-V and not-so-high stance make it look more like an MPV than an SUV. 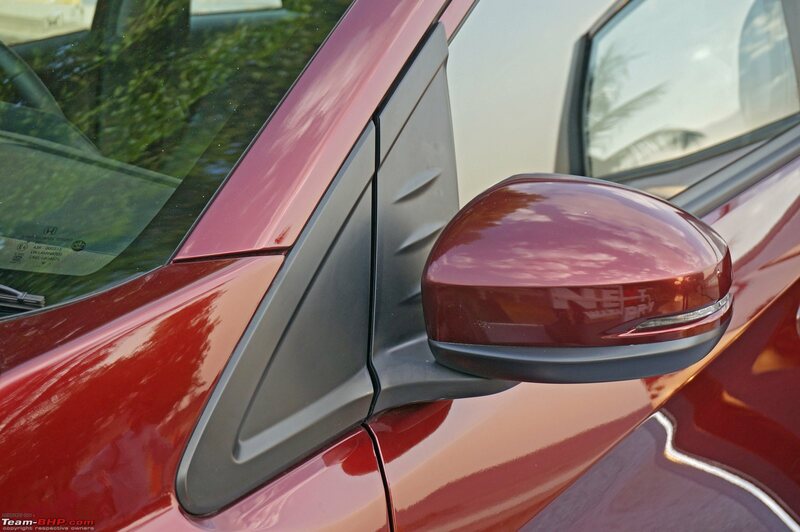 A casual observer will easily mistake it for the Mobilio. 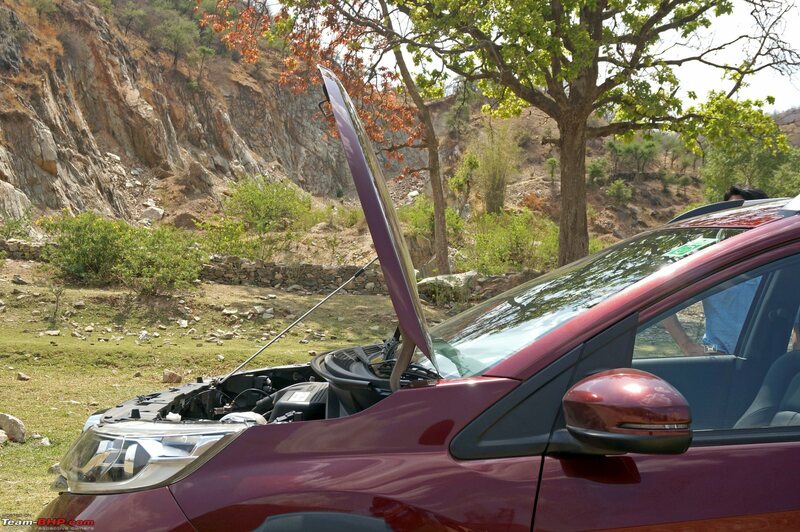 We also feel that there are too many cuts & creases here, making the BR-V look unnecessarily busy. 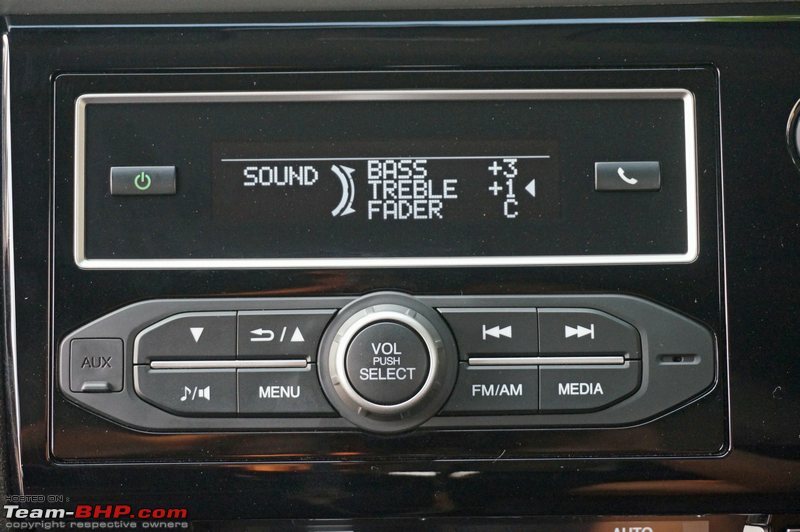 The ORVMs with integrated turn indicators are shared with the City and Amaze facelift. However, the Mobilio's floating D-pillar hasn't been carried over to the BR-V (rear quarter glass doesn't merge with the windshield). 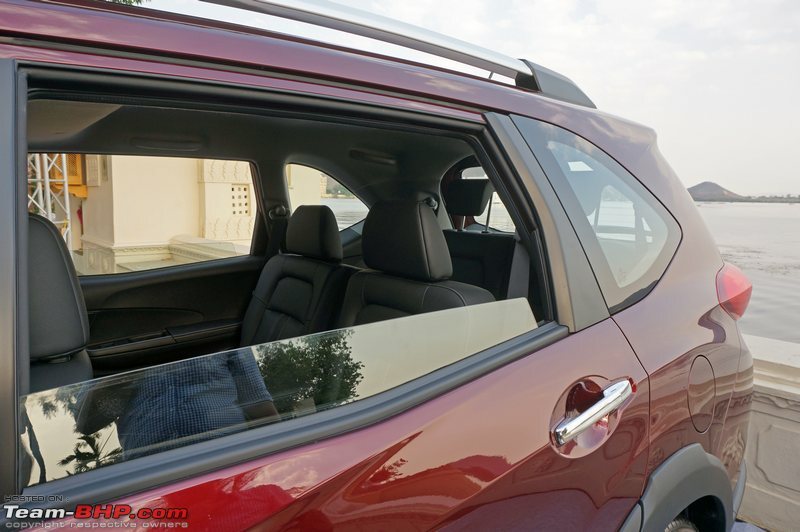 The rear section does appear longer than say, a Creta, and this is because of the additional row of seats. The BR-V runs on smart looking 16-inch alloy wheels which have a silver & black finish. While the wheels appear proportionate to the height of the car, those 195 mm tyres should have been wider. 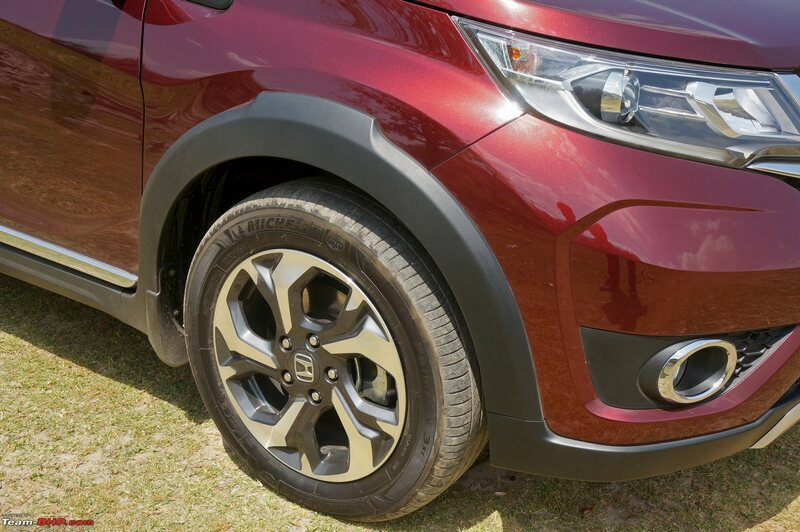 Even the smaller Vitara Brezza gets fatter 215 mm rubber. 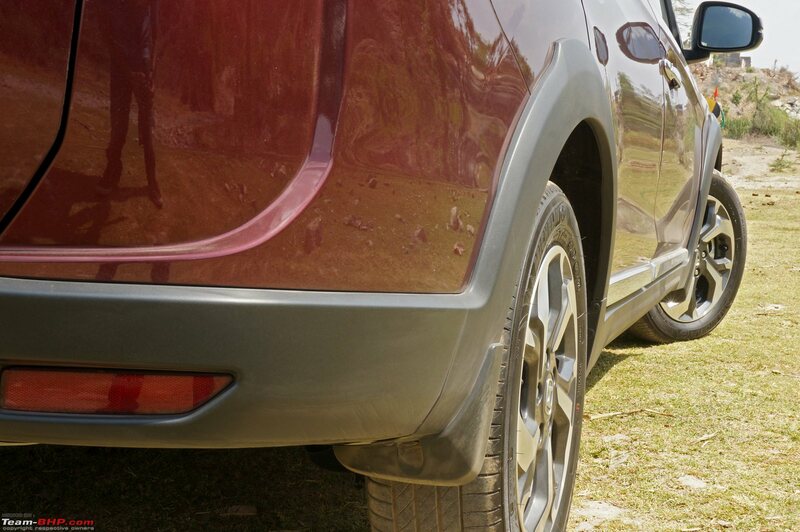 Stance is very important to an SUV. The rear of the car is funky; Rehaan liked it, but I didn't. Will definitely divide opinions. 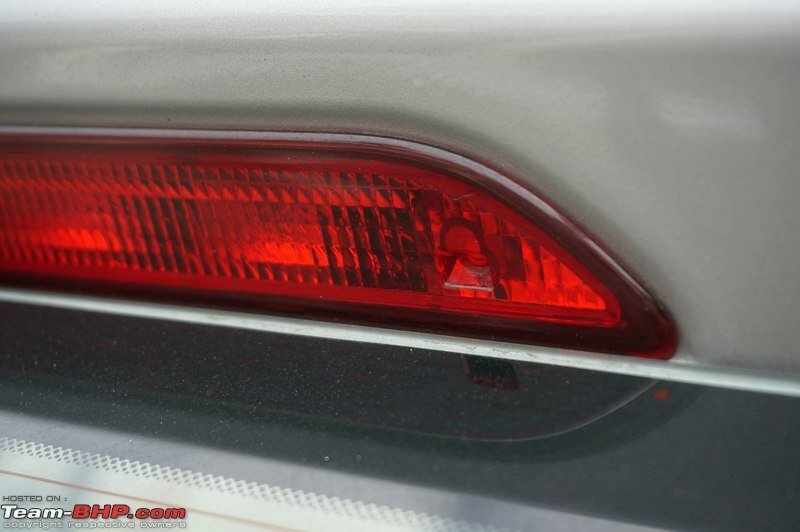 It features a pair of big wraparound tail-lamps with a thin red plastic strip connecting them. The number plate is housed low on the tail-gate and has a thick chrome garnish above it. Paint quality is top-notch and there are no rough areas to be seen anywhere on the car. The build, however, is light. The doors shut with a tinny clunk that is similar to the Mobilio, while the bonnet feels damn light. There is a good deal of flex on the metal if you push any panel with your hand. 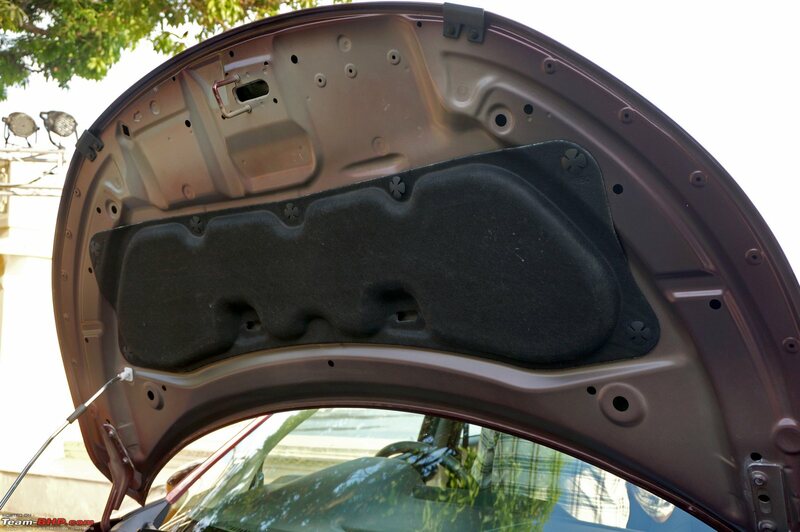 No EcoSport level of sturdiness here - the sheet metal feels awfully thin. 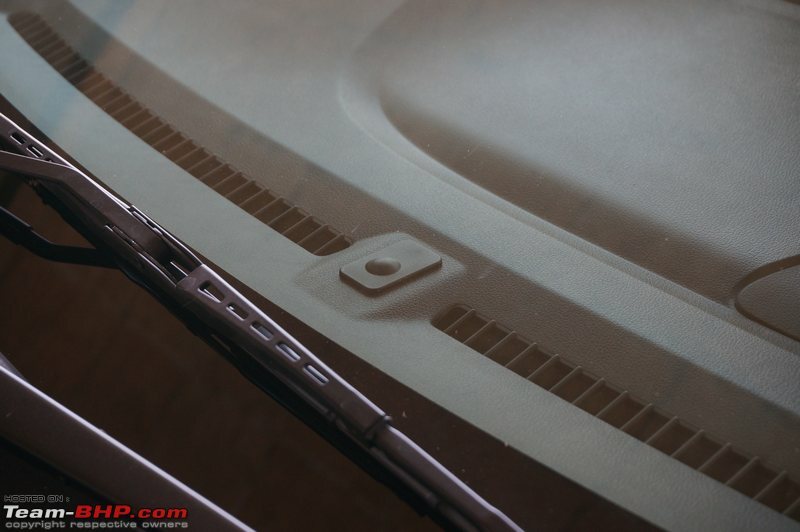 Apart from this, there are the wide panel gaps around the bonnet & tail-gate areas which look out of place on a Honda (or, for that matter, on any car costing a million bucks). In certain areas, the finishing could have been better. As an example, the rear quarter glass doesn't fit flush with the plastic on the rear door, where the two meet. 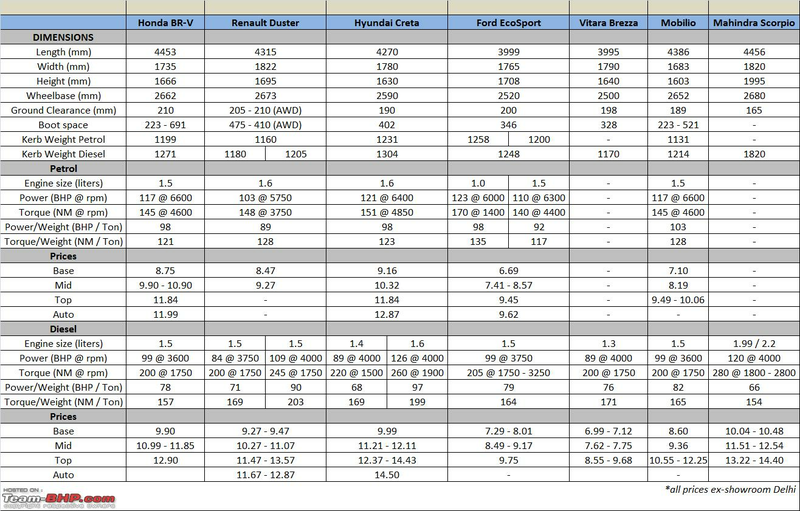 It's disappointing that Honda is moving towards Maruti rather than Hyundai in terms of build quality. Big shoutout to a4anurag for this features comparison! 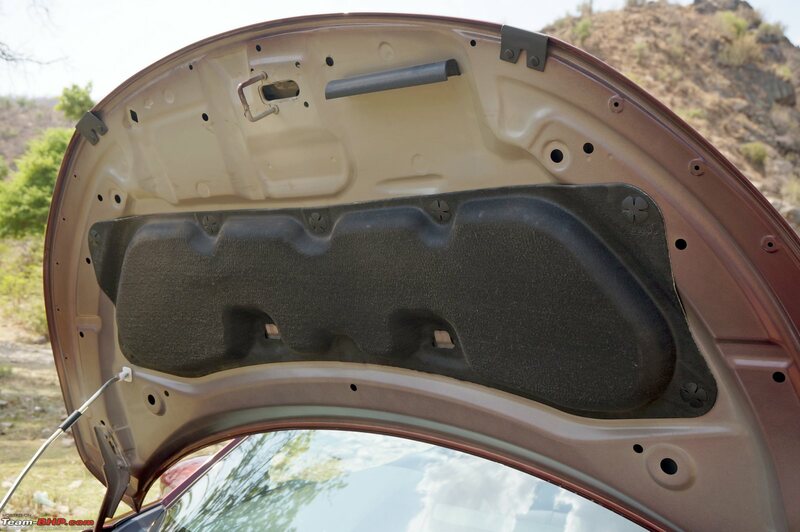 Front wheel arches get minimal cladding on the inside. There's none at the rear. Both present an ugly sight, what with the wires, creases & holes! 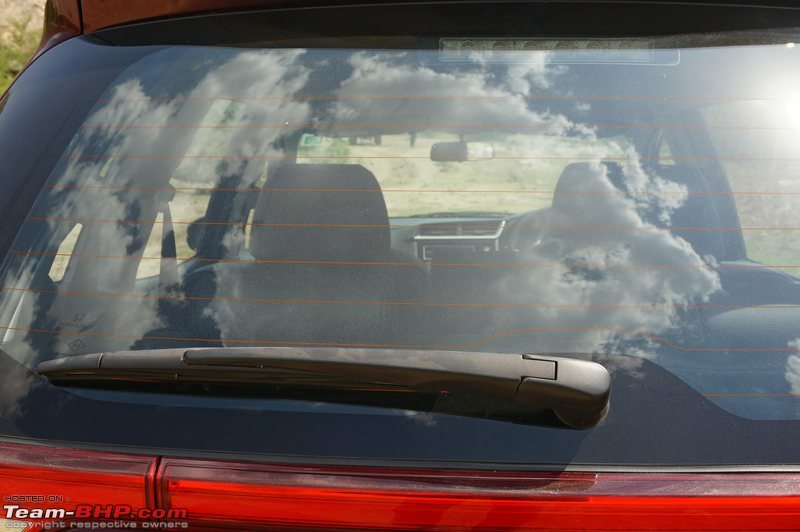 Mobilio-like kink along the rear window line. Glass area for the second row is massive! Last edited by Aditya : 6th June 2016 at 06:33. The Honda BR-V is equipped with a smartkey-based keyless entry & go system. 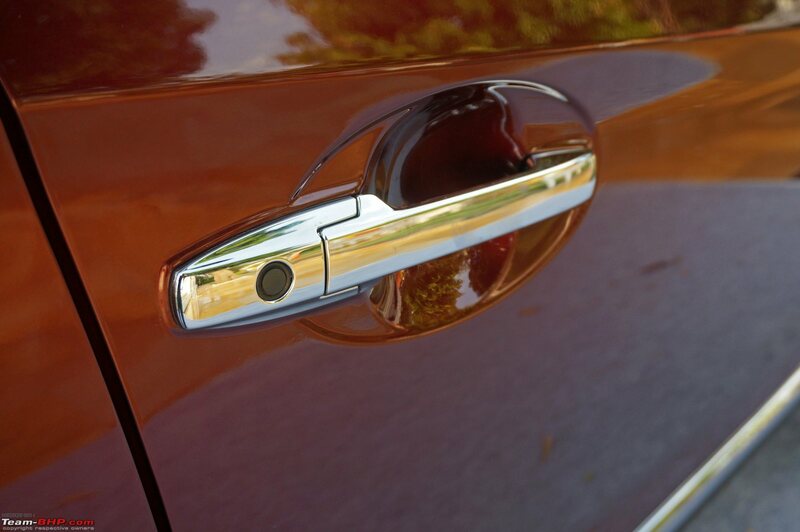 Simply press the request sensor on the chrome door handle (with the smartkey in range) and enter the car. 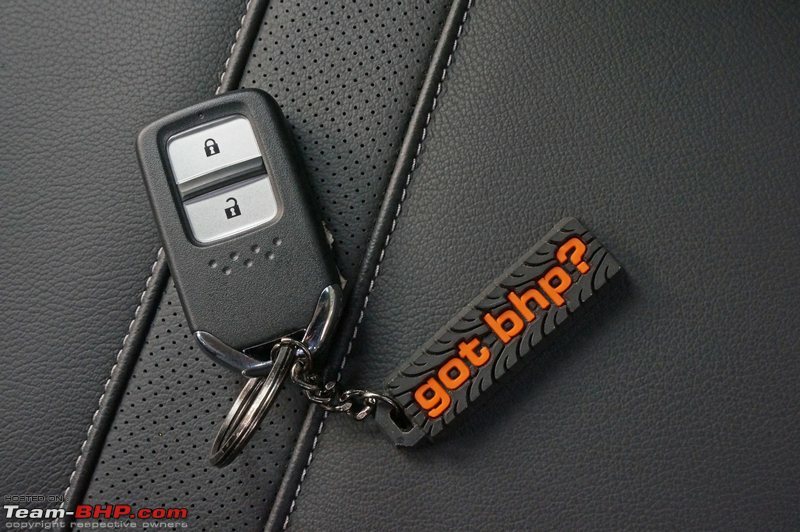 The BR-V can also be unlocked by pressing a button on the key fob. The locking / unlocking action is quite silent (not clunky as in some other cars). 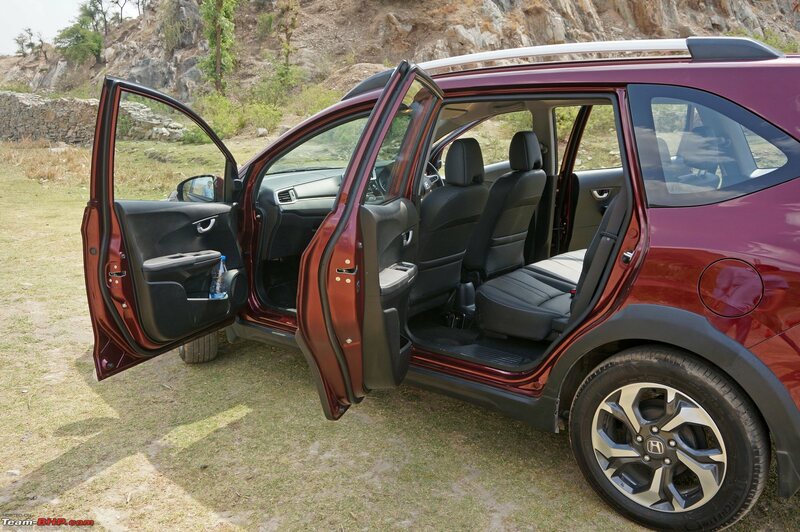 The front doors open in a triple-stage action and the car's height makes ingress / egress super easy. Thankfully, we don't have to bear the Brio's dashboard here. 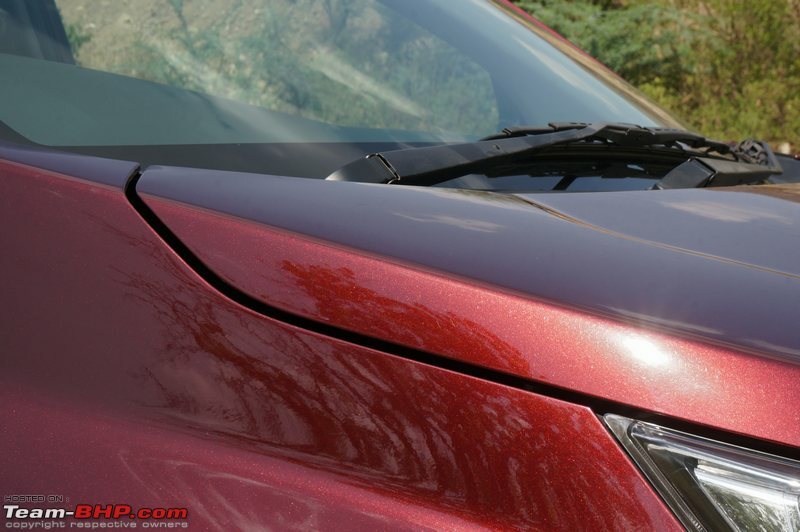 The BR-V uses the updated fascia first seen in the 2016 Amaze Facelift. However, instead of using the black & beige combo of the Amaze, Honda has adopted an all-black theme here, with silver inserts at various places. While the all-black interiors are welcome, there is a considerable size of the market that still prefers black & beige. 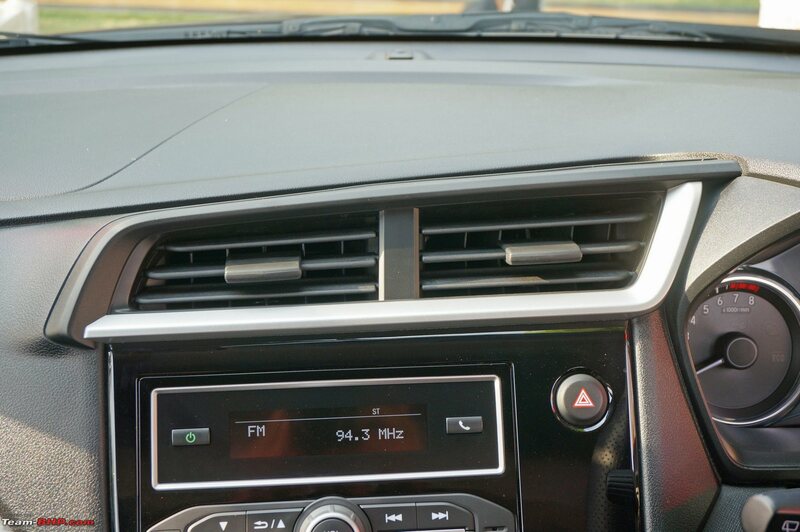 This new dash is far better & much more contemporary than the el-cheapo one of the Brio. The silver inserts are tastefully applied too. A grey panel on the left (in front of the passenger) attempts to break the all-black monotony. This portion looks like it is perforated, but actually isn't. It's smooth to the touch. The quality of plastic parts is mediocre - they are all hard & scratchy. 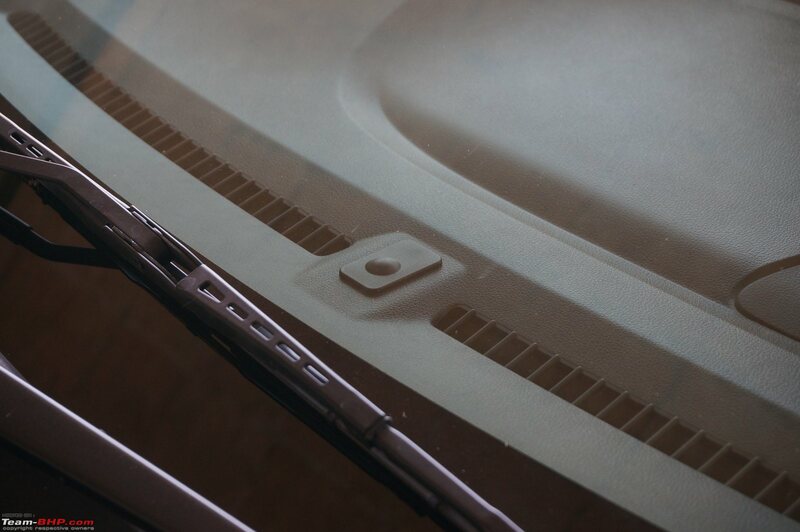 While this quality might be acceptable on an entry-level sedan like the Amaze, it's not on an SUV with variants costing well over a million rupees. 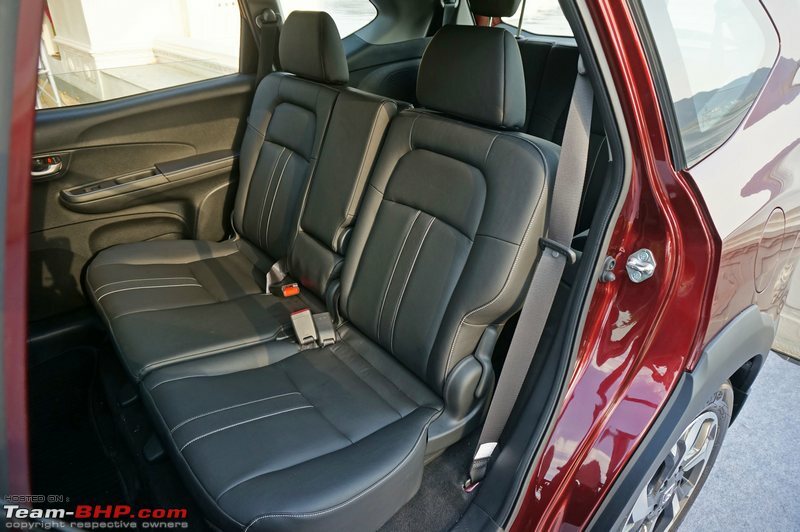 There is no way the BR-V's interior can stand up to the level of quality offered by equivalently-priced Hyundais & VWs. That said, despite the ordinary quality, nothing stands out as poorly made, rough edged or unfinished. 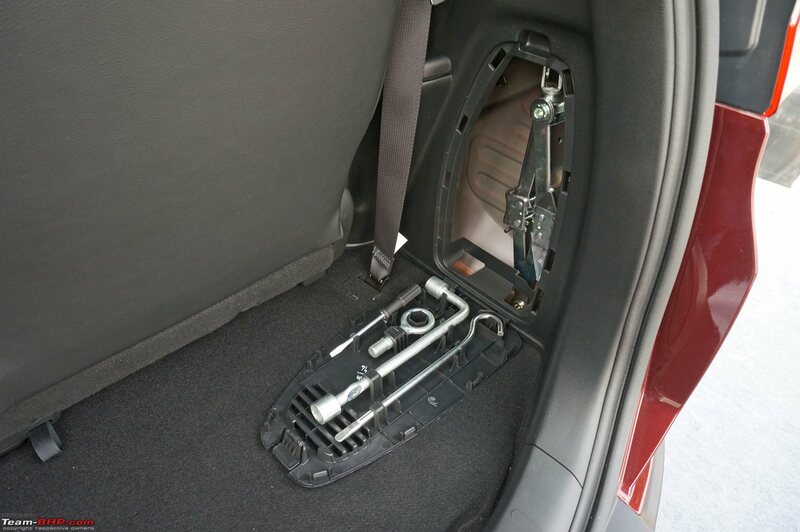 The interior is screwed together properly. Legroom & headroom at the front are good. However, cabin width is limited as the BR-V is based on what is a small hatchback after all (the Brio). Still, it does feel bright and airy due to the ample glass area. From the driver's seat, frontal visibility is adequate. The A-pillars are thick, albeit they don't pose much of a problem. Lateral visibility is healthy too. 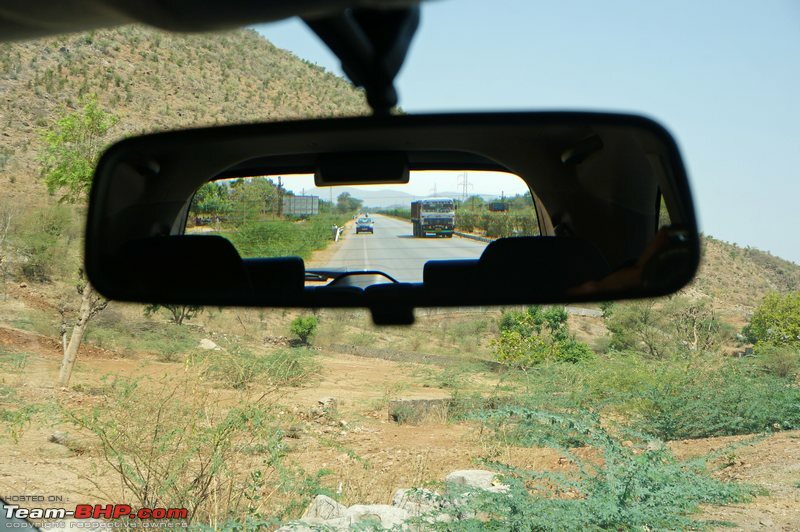 What is poor is the rearward visibility. 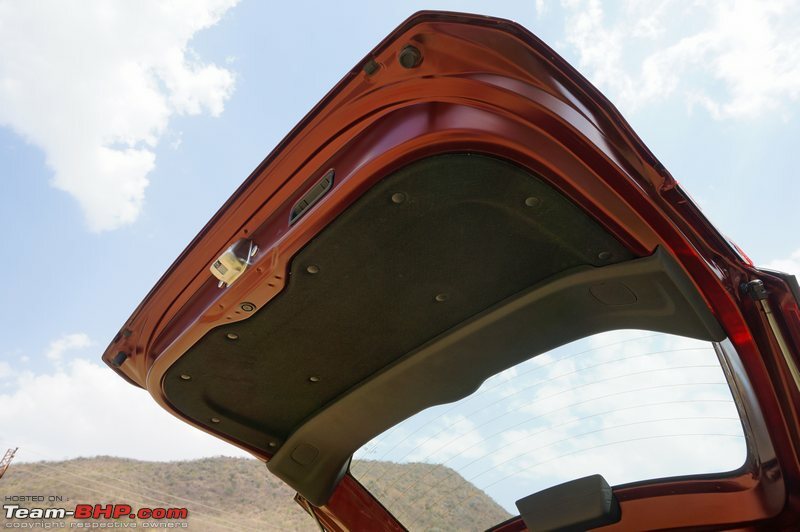 The D-pillars are huge, the rear windshield is set high and the big headrests (of the middle row) severely restrict the view. 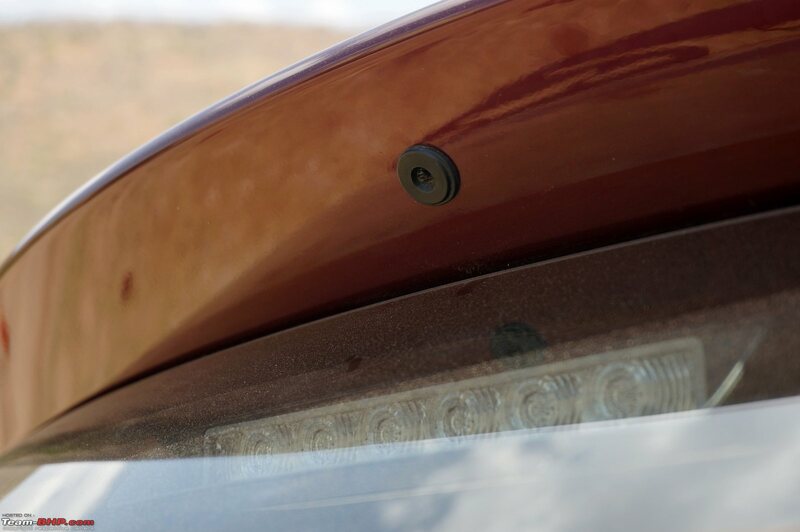 It's honestly disappointing that Honda chose to skip a reversing camera and parking sensors in this vehicle, at a time when cheaper hatchbacks are offering these aids. The ORVMs are appropriately sized and offer a fair view of the action behind. The small & basic IRVM's visibility, on the other hand, is hampered by the thick D-pillars. 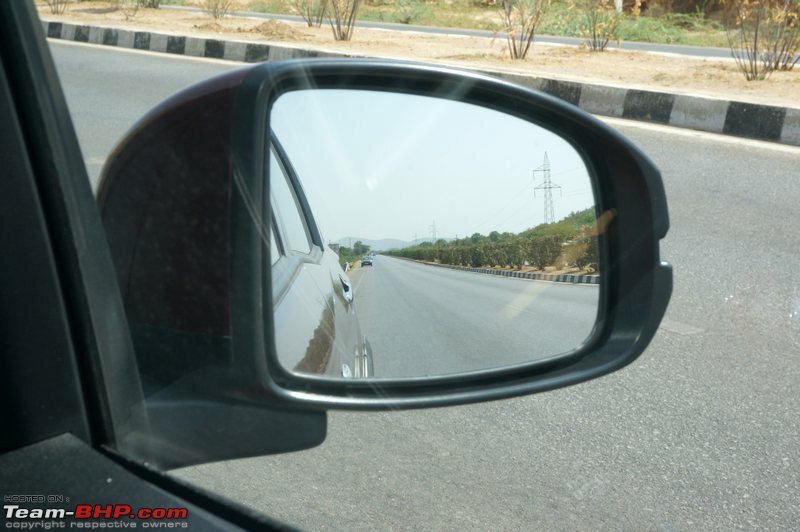 Watch out for blind spots created by these pillars! 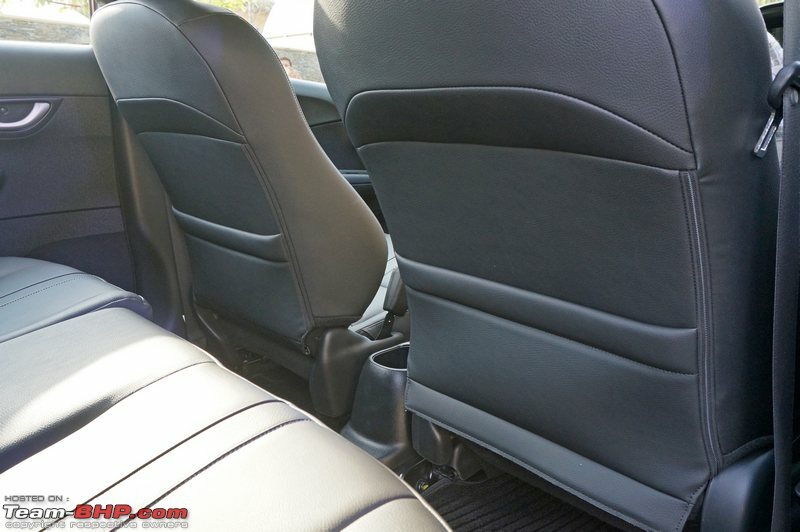 The front seats look extremely smart (even though they are on the slimmer side) and have leather upholstery with a perforated strip in between. 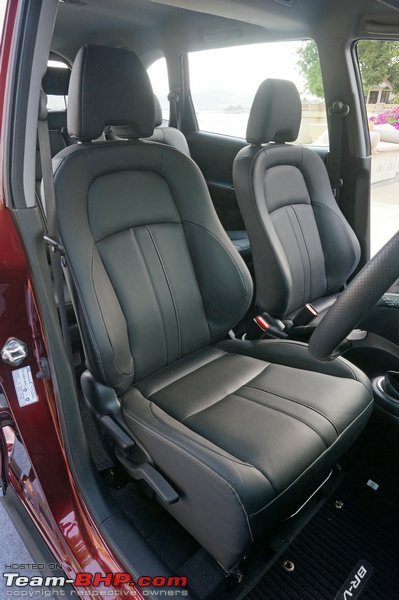 The seat's design, white stitching and upholstery style make it look premium. The seats are scooped in with ample bolstering on the sides. Medium & small built people will love them. Larger folk though might find the seats to be too snug. To sit on, they are on the firmer side and provide good support (especially for the lower torso). 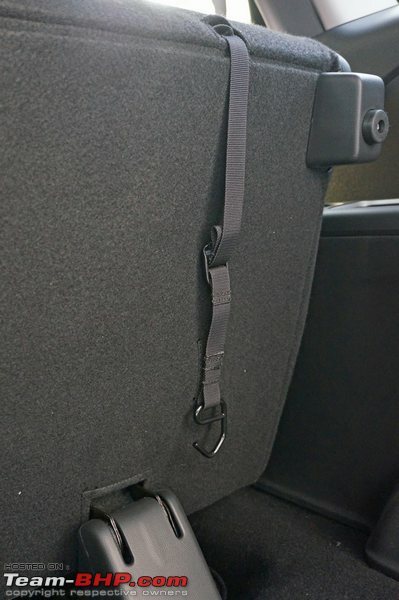 Under-thigh support is satisfactory and the exceptionally long (12-13 inches) fore & aft adjustment range ensures that drivers of all heights will fit in. 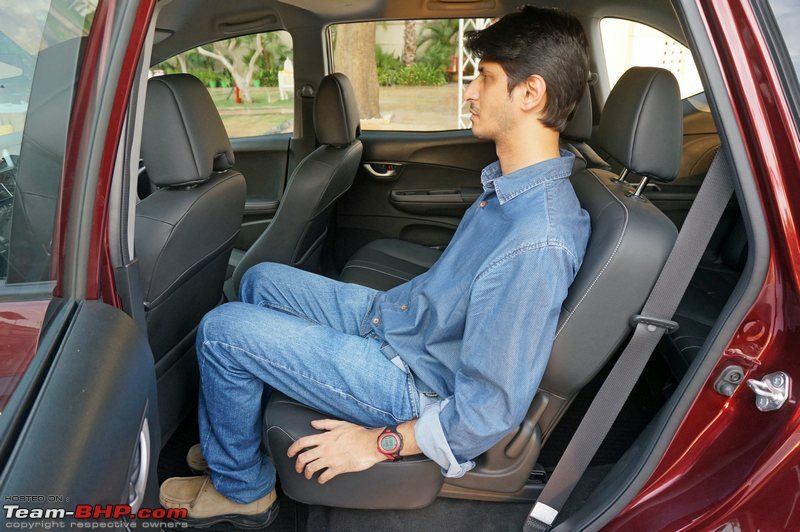 The driver's seat is adjustable for height (unlike the Mobilio) and has a nice travel range. 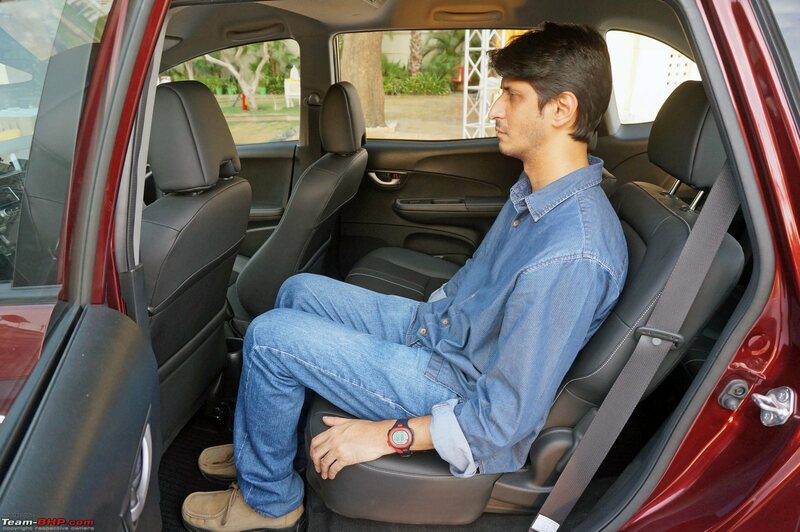 Also unlike the Mobilio, the neck restraints are adjustable. That said, the seatbelts aren't adjustable for height. 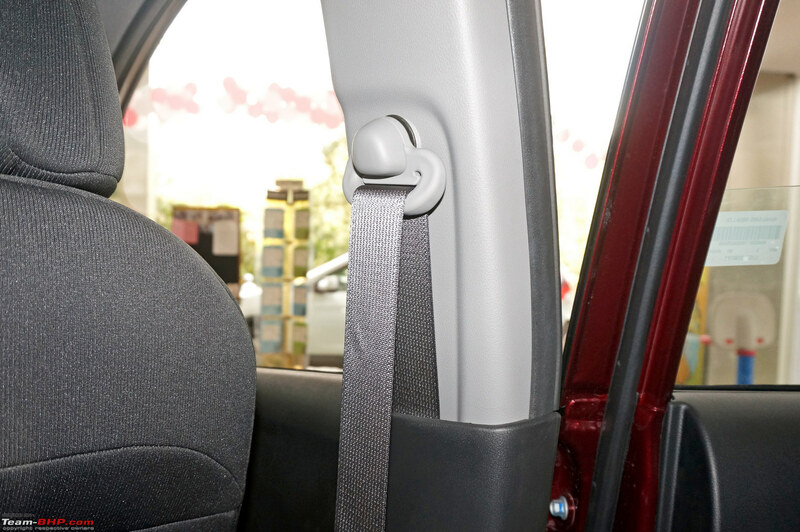 These fixed seatbelts can prove to be a major irritant for a short driver as the seatbelt will rub against his neck. 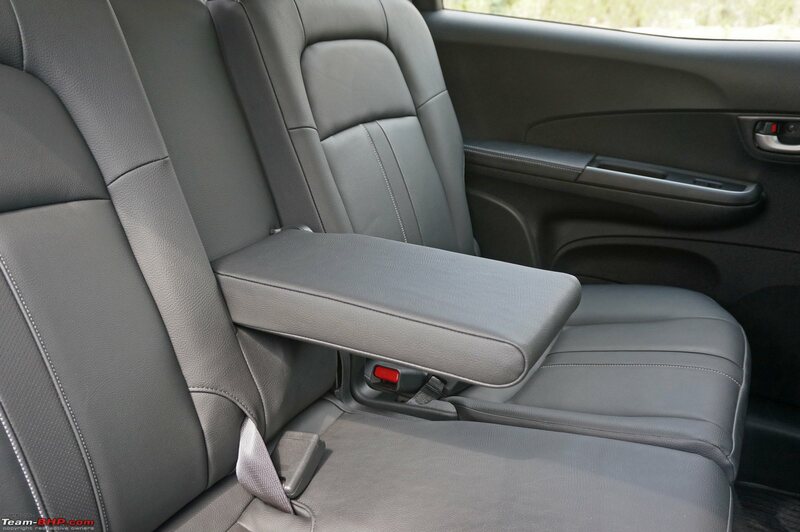 Another useful feature owners will miss is a driver armrest which elevates comfort levels on long drives (just what SUVs are built for). Like in most Honda cars, the ergonomics are spot on. 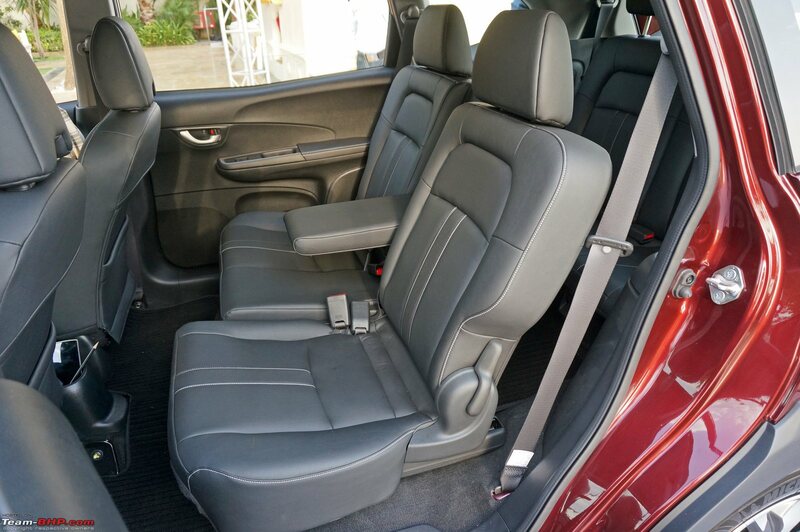 The interior is user-friendly and you are at home within minutes of being seated. 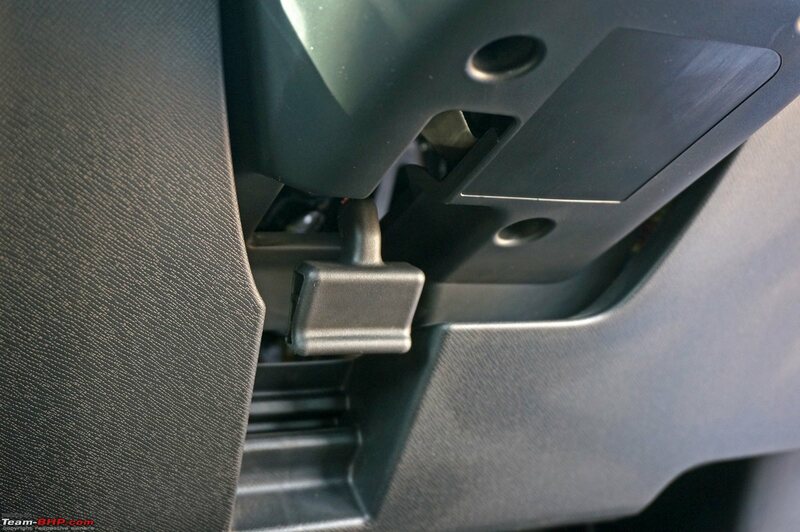 All controls are easy to reach and the center console is angled toward the driver. 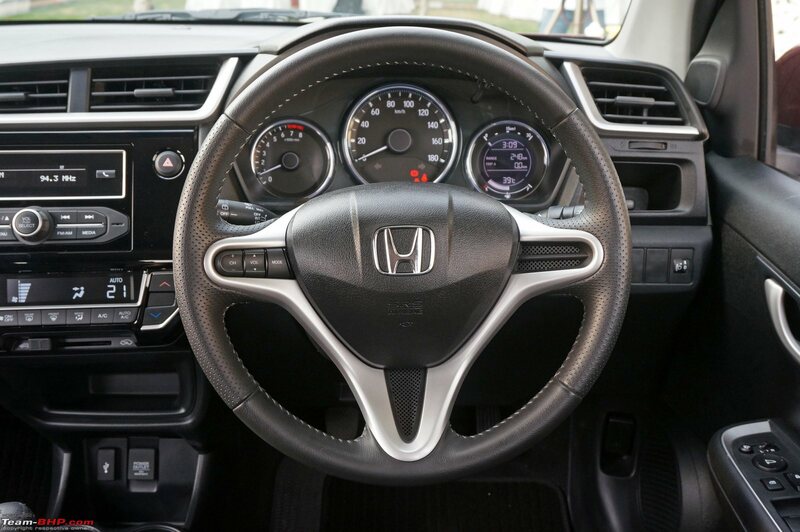 The steering wheel is similar to the one of the 3rd-generation City. It looks classy and has perforated cladding on the sides. The steering is nice to hold, even though thumb contours will be missed. The hornpad is easy to press, but it can be a stretch for those with short fingers. 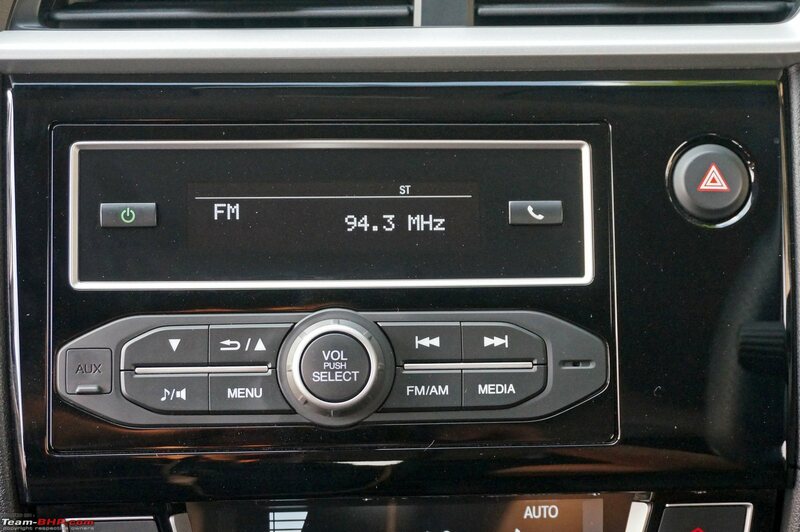 You'll see integrated buttons on the left for the audio system. While the steering can be adjusted for height, it sadly cannot be for reach. The instrument cluster is of the new design seen on the Amaze Facelift & City. It consists of three dials and is easy to read. 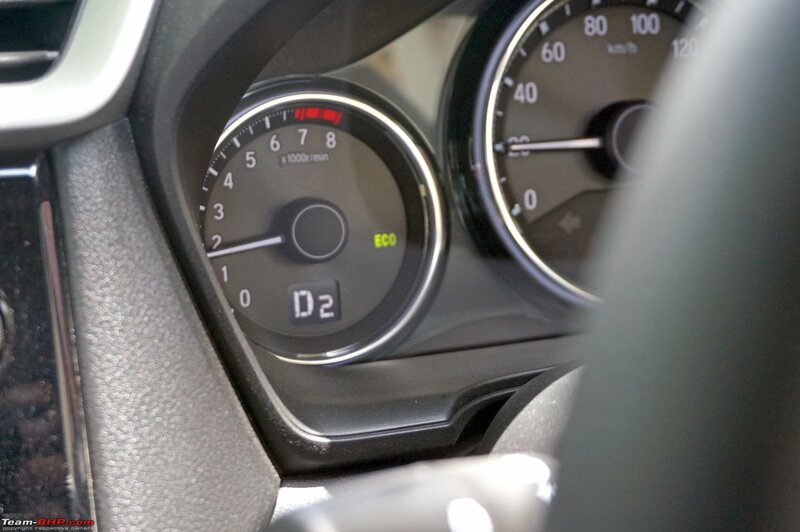 The MID includes 2 trip meters, clock, tank range and average fuel consumption. A graphical bar on top indicates real-time fuel efficiency, while another at the bottom displays the fuel level. 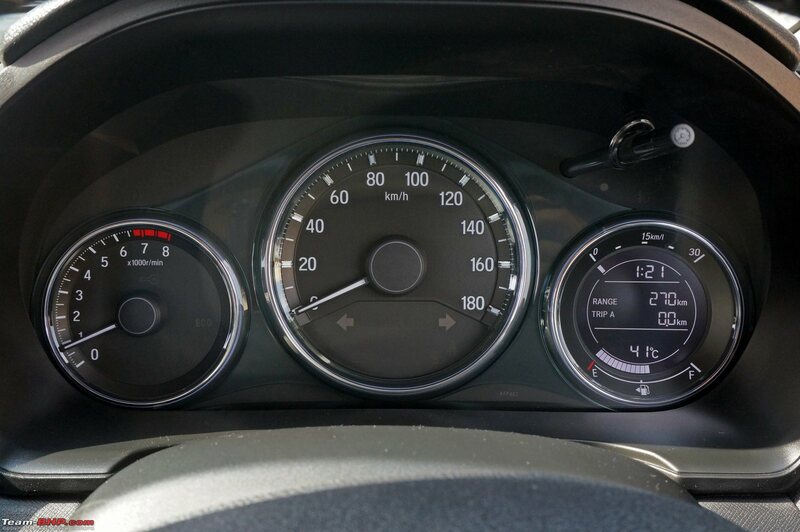 On the tachometer is an "Eco" indicator which lights up when the car is being driven economically. 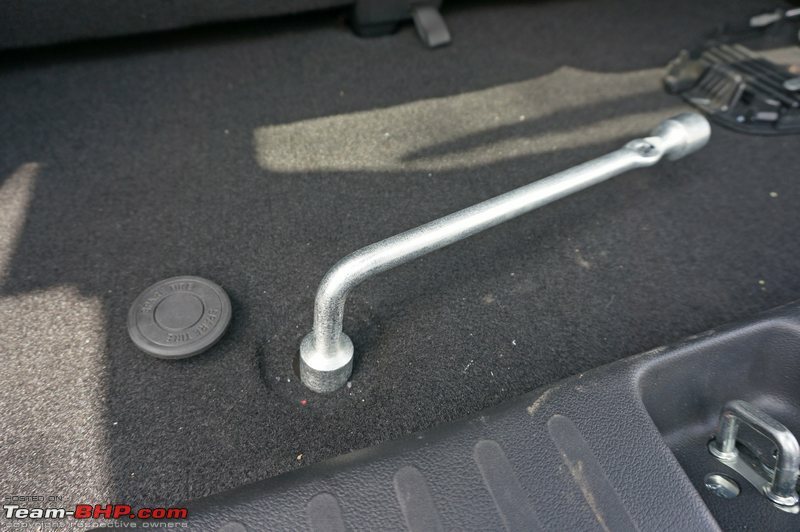 No gearshift suggesting tool for newbies though. 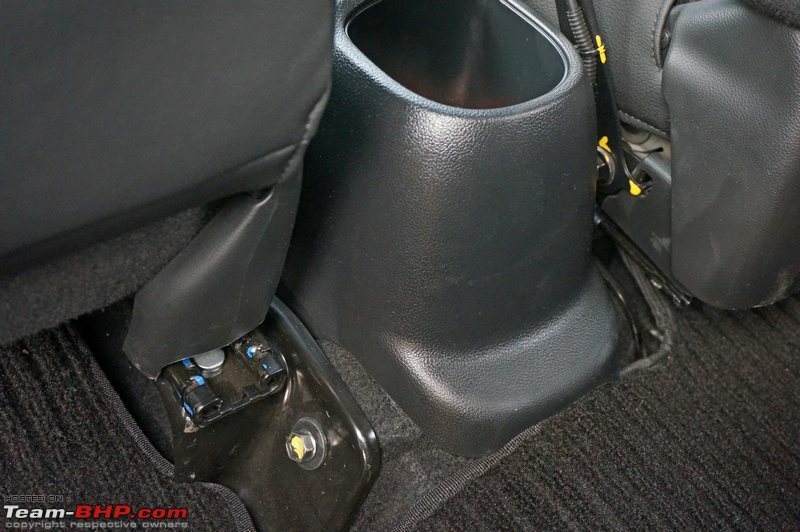 As we have seen in the Amaze facelift, the center console is finished in piano black. 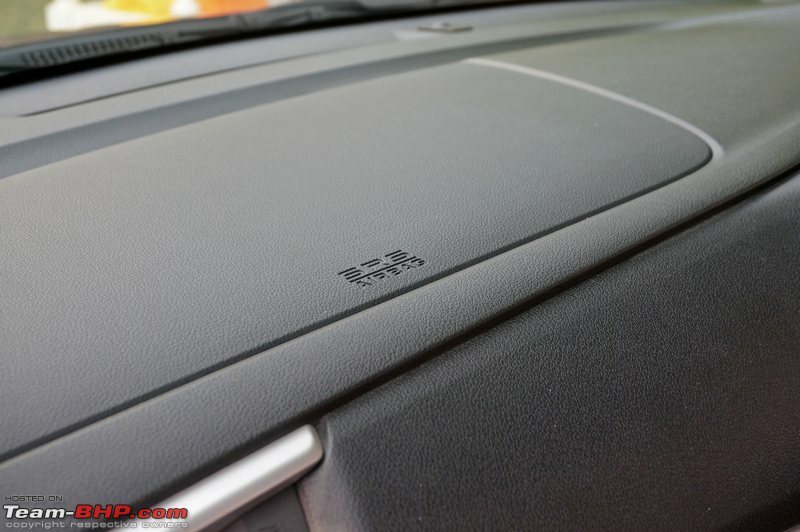 The infotainment system has also been carried over. While it features Bluetooth connectivity for music & telephony, the display is a simple monochrome panel! Now, this looks horribly outdated. A touchscreen system is the norm today (cheaper Brezza gets an awesome touchscreen head-unit). 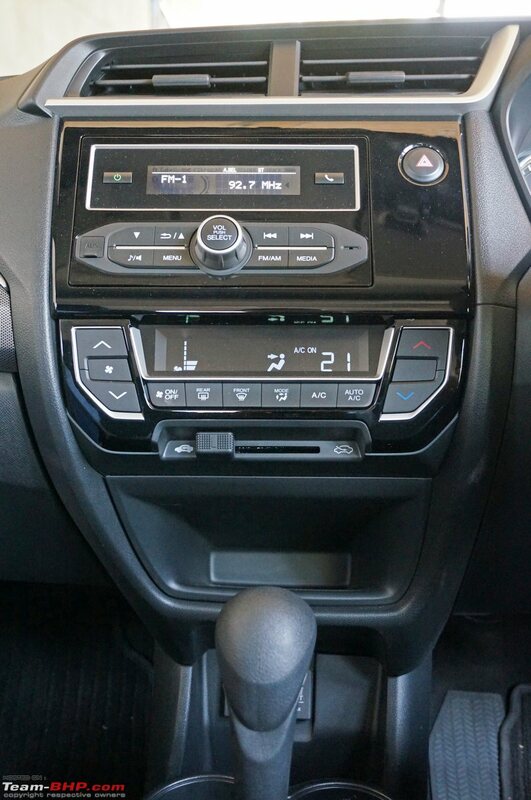 Honda should have definitely provided a more upmarket infotainment system in the BR-V. The ICE has 6 speakers - 2 tweeters & 2 speakers on the front doors and 2 speakers next to the third seat row. Sound quality is quite good. 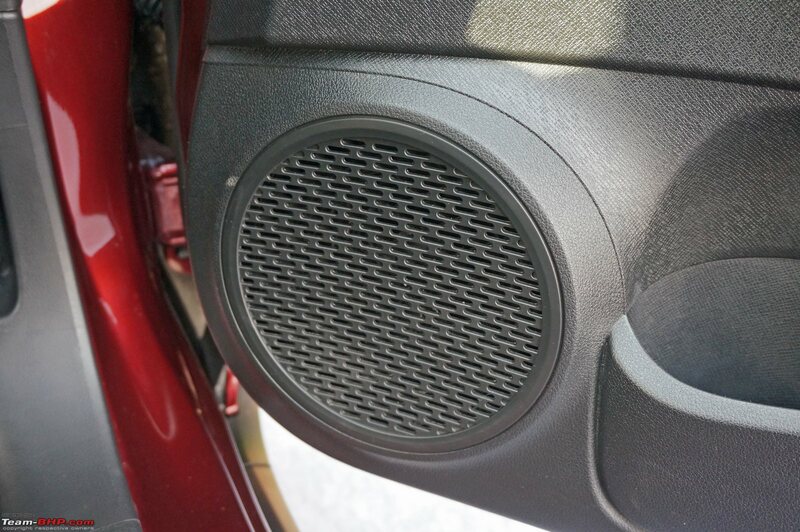 Even while playing a bass-heavy track at max volume, there's no crackling from the speakers. The bass itself is tight and punchy. The mids are slightly lacking and the treble is slightly sharp, yet overall, sound quality is impressive for an OEM system. 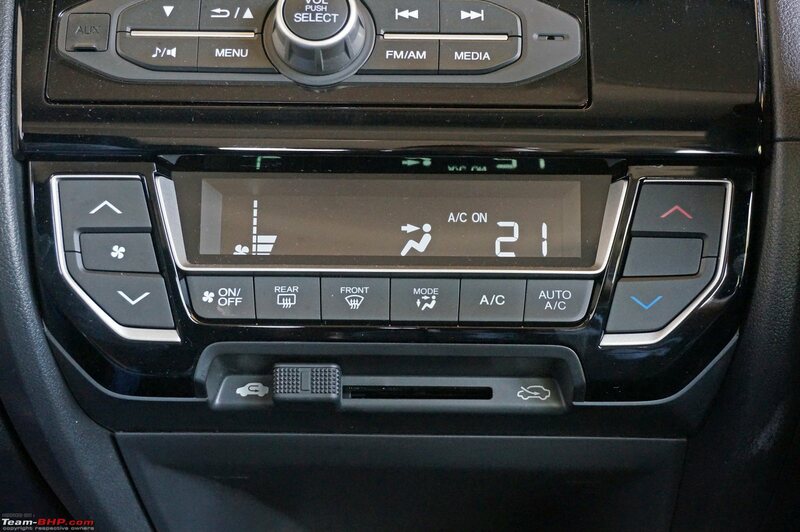 Like the audio system, the climate control unit is also shared with the Amaze. Its display is huge and very easy to read. The fan & temperature control buttons are well-sized, but their feel is plasticky. 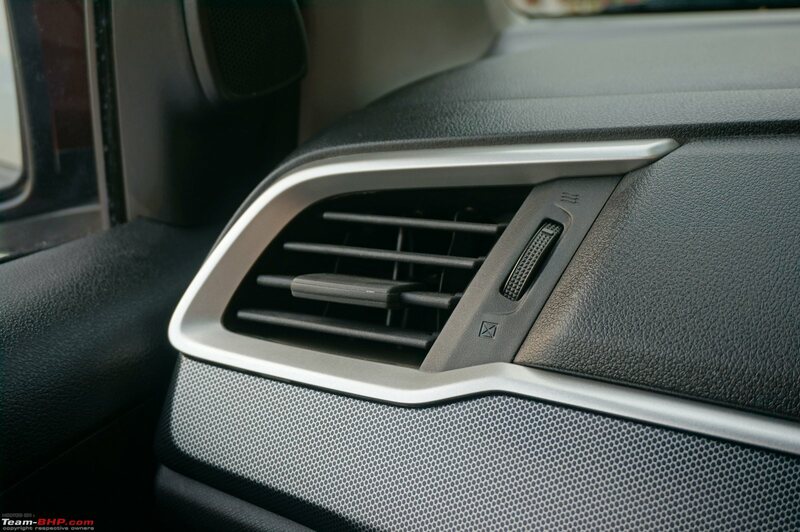 Other A/C controls such as the fan on/off, Auto button etc. are placed below the display. 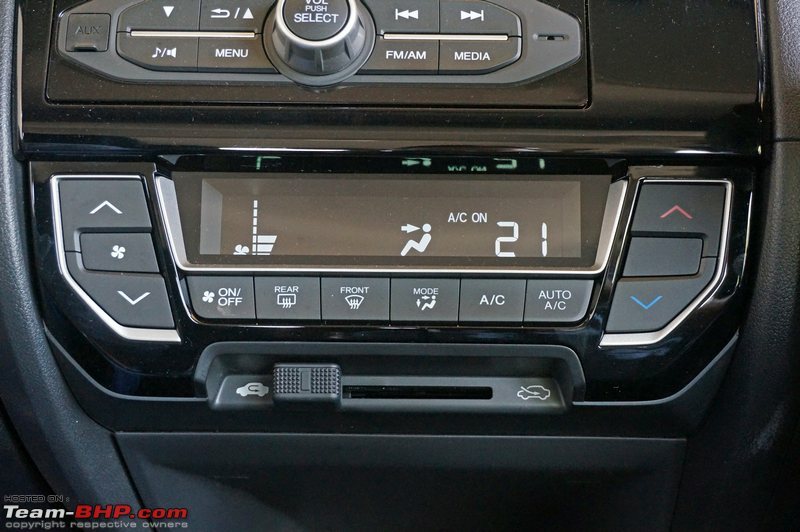 What is shocking is the manual slider for the fresh air / recirculation modes. What was Honda thinking? This looks completely out of place and terribly outdated! The air-con's performance was impressive. 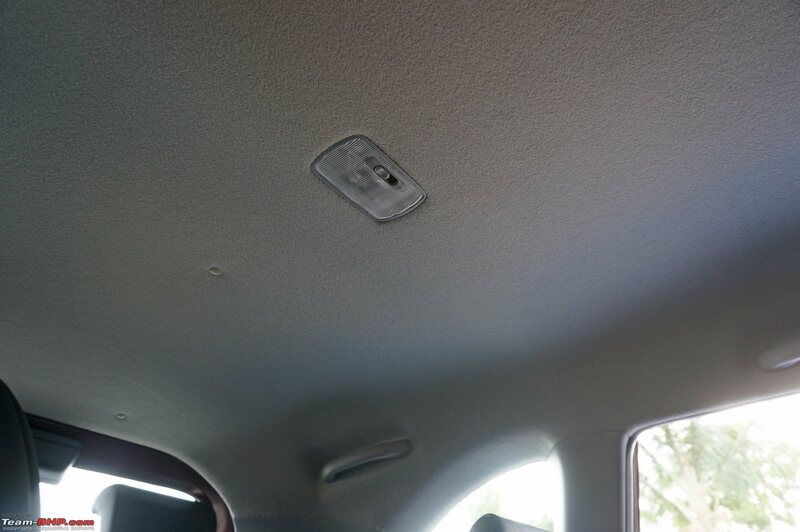 On a 40 degree day with the hot sun above us, the climate control did a competent job of keeping the cabin cool. No complaints about the functioning of the system. The blower has 7 adjustment speeds. From level 1 to 4, it performs silently. At level 5, the air flow gets audible. On level 6 & up, things get noisy. The glove compartment is medium-sized, although its large lid would have you believe otherwise. It isn't very deep and there is a bulge on the inside of the lid that reduces the storage capacity. Additionally, its opening is rather high. There is a deep storage area under the climate control unit. 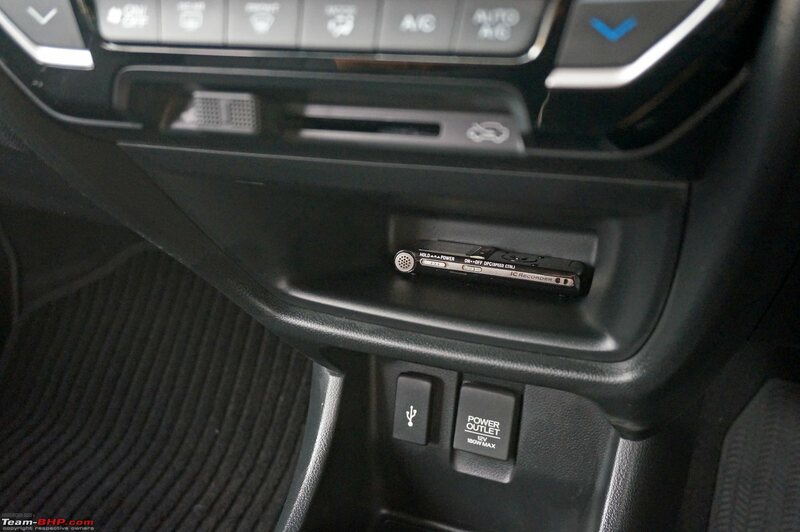 The 12v socket and USB slot are located below it. These have solid plastic covers which close with a nice click. 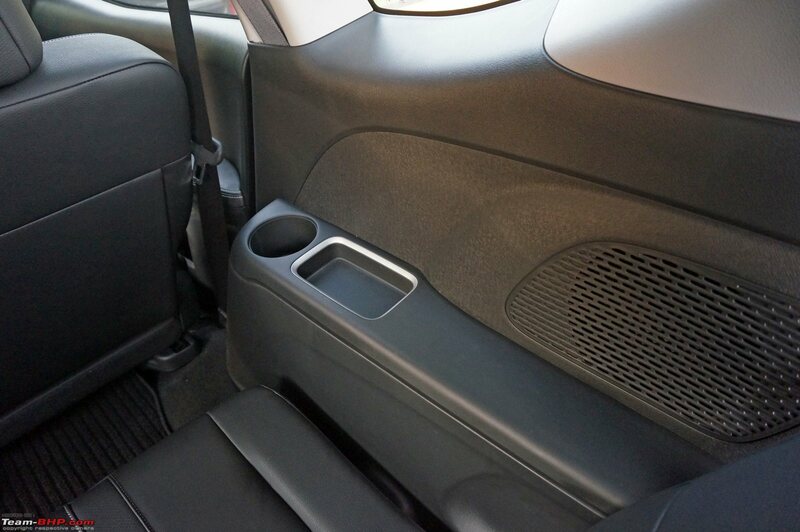 Here, you'll also find a rectangular storage cubicle to park your smartphone and two cup-holders. 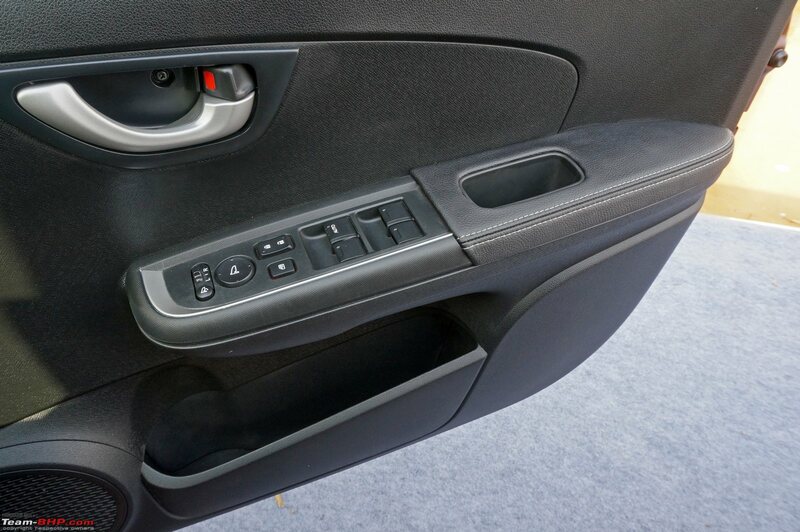 Behind the handbrake is another deep cubby / single bottle holder. Additionally, the door pockets can hold a 1-liter bottle each, with space left over for the knick knacks. 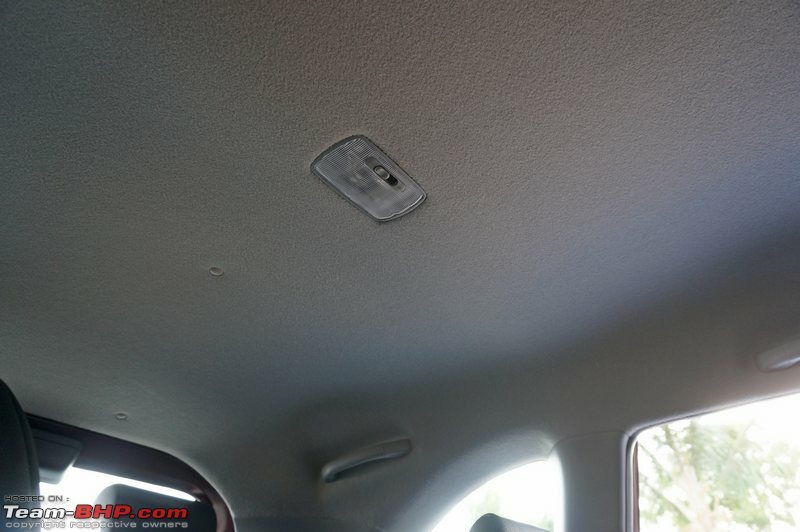 Lastly, to the right of the driver (below the side air vent) is a small open cubicle. Steering in the VX and V CVT variants has been taken from the 3rd-Gen City. It's sweet looking and nice to hold, even if thumb contours are missing. Adjustable for rake only, not reach. Other variants get the unit from the Amaze - related link 1, related link 2. 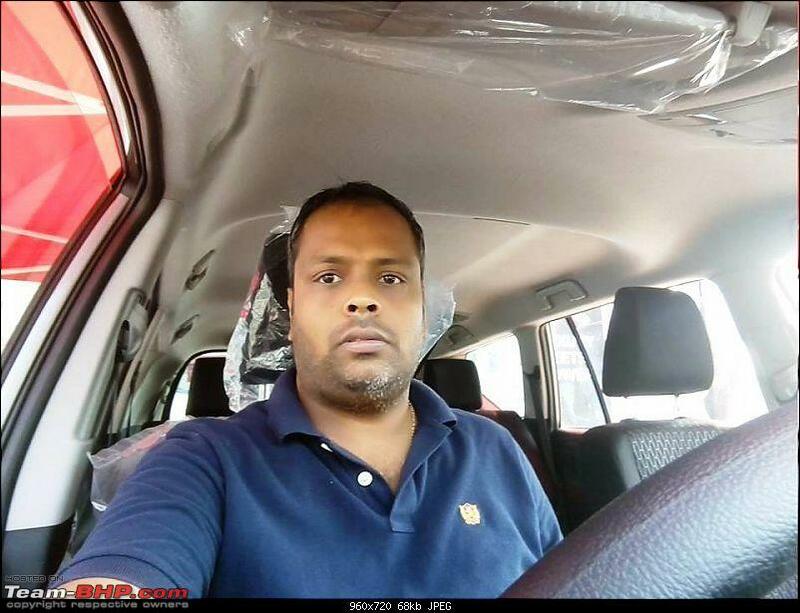 Big shoutout to BHPians CrAzY dRiVeR and -xplora- for sharing! Controls to operate the audio system are located on the left. 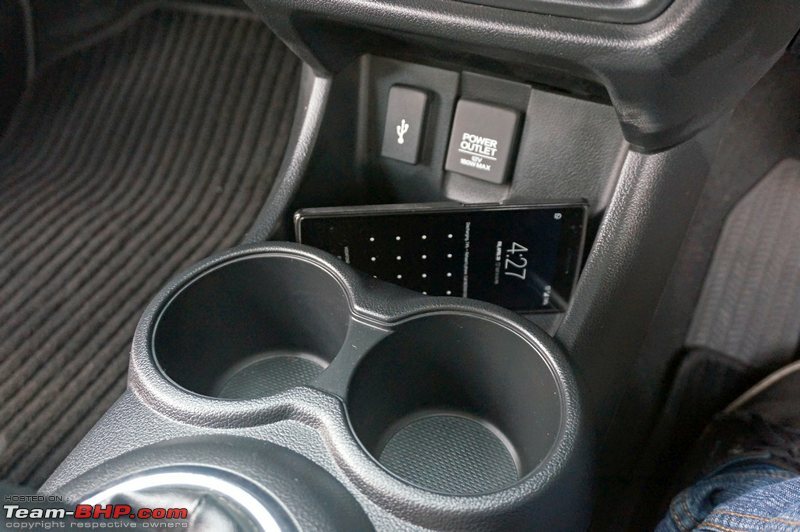 No phone controls on the steering - a glaring omission !! Climate control gets a nice display. Buttons are large and easy to use. 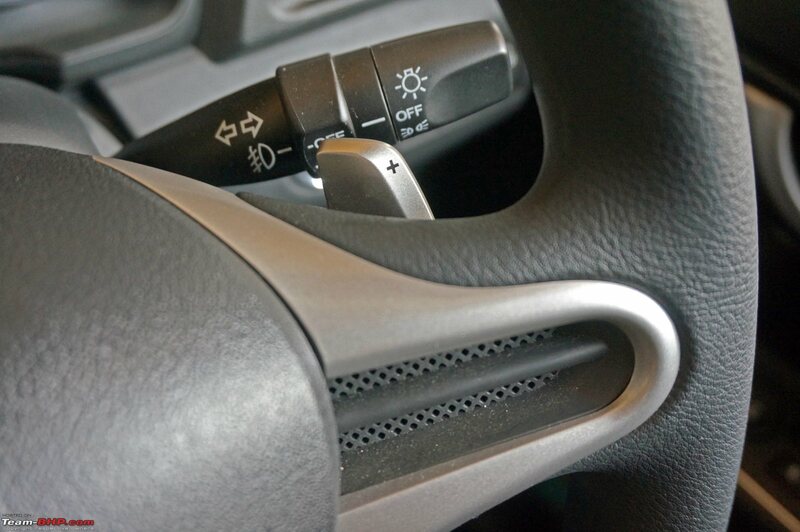 Shocker below - a sliding lever for fresh air / recirculation modes. What was Honda thinking?!! Sunvisors feel Alto-grade and suffer a lot of flex. Honda still hasn't learnt that customers today are looking for quality & will pay for it (just ask Hyundai)! Last edited by GTO : 24th May 2016 at 21:30. 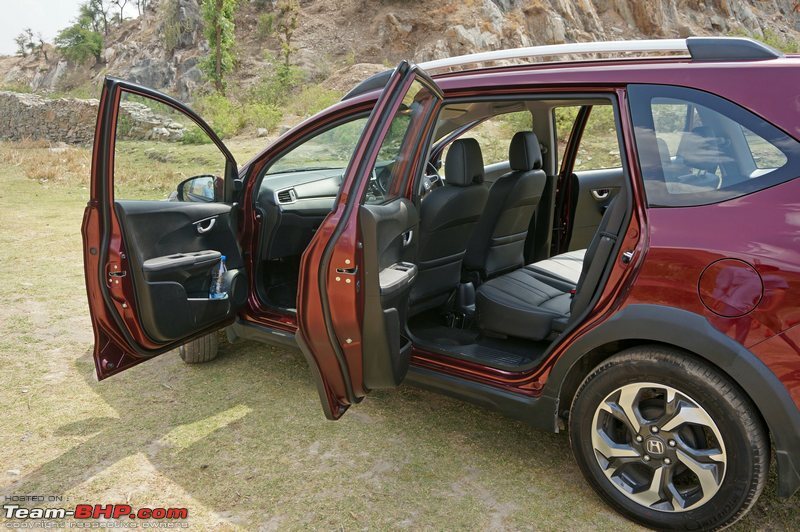 The BR-V has a huge rear door which opens via a dual-stage action. 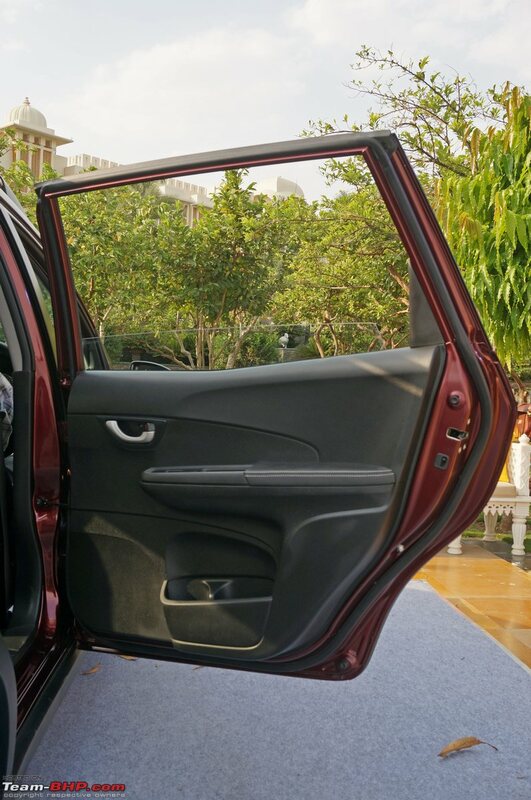 Along with the height of the car & wide gap between the B-pillar & rear seat, it makes ingress and egress easy. When you want to get out, place your feet on the ground and you barely have to stand up by a few inches. The elderly will appreciate this. The generous glass area allows a great amount of light into the cabin. This negates the effects of the all-black interior and lends an airy feel to the cabin. In fact, the windows are so big that - despite the 3rd row glass area being small - the light entering is enough and no one will complain about feeling claustrophobic at all. It literally feels like sitting by the window of your house & getting a crystal clear view of the happenings outside. The bummer here is that the window doesn't roll all the way down (goes in ~85% of the way). There is ample headroom as well as legroom in the second row. The ceiling is quite high too. At 5'10, I had about 4 inches of headroom and even 6+ footers won't have trouble sitting up straight. The seats are individual units, split in a 60:40 ratio, and offer fore & aft adjustment. While sliding the seats all the way back gives you immense legroom, even with the seat in full-forward position, there is adequate space. 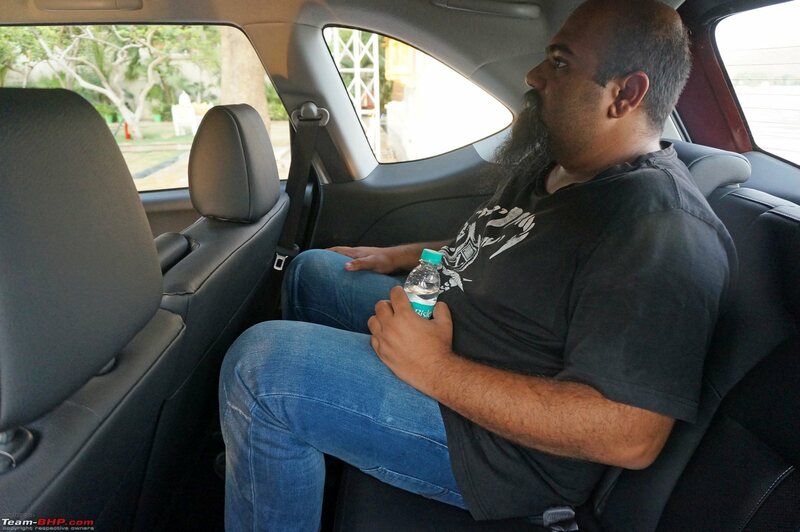 With the front seat in my driving position (5'10"), 5'8" Rehaan had approximately 5 inches of legroom to spare in the middle row! 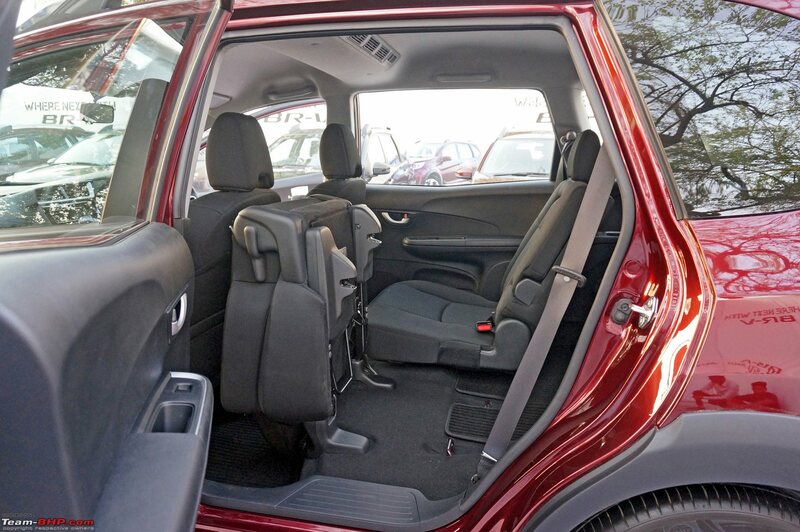 The BR-V can effortlessly accommodate two 6-footers sitting one behind the other. 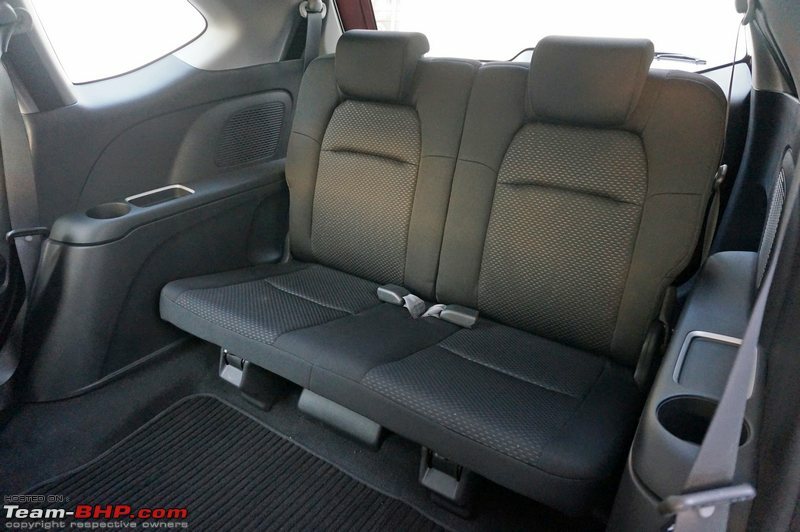 It comprehensively beats its competitors in the area of legroom, no contest. 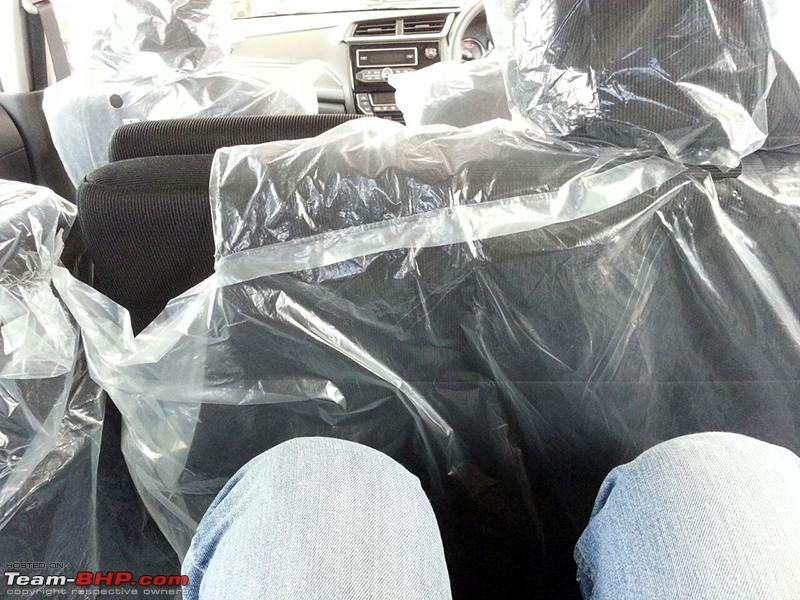 What's more, the second row of seats can be reclined in 8 steps. While the first few steps are too upright, beyond them, you can get exactly the amount of recline that will make you comfortable. 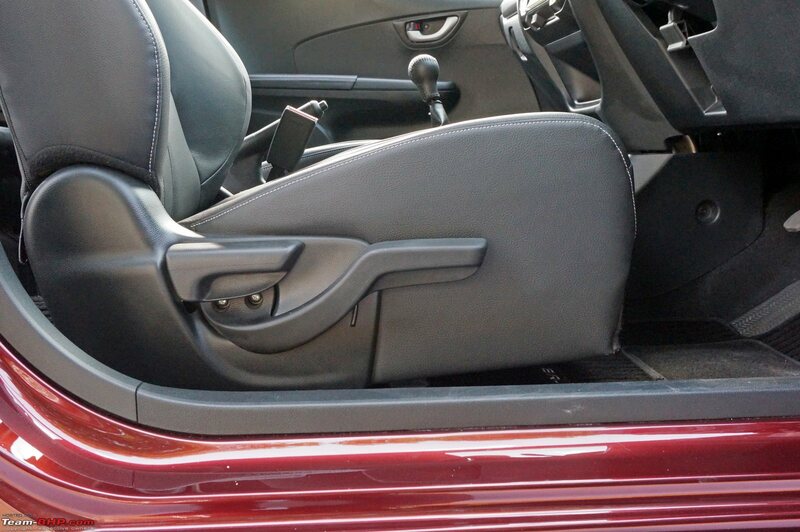 The backrest can be reclined very far down (about 60 degrees) - those who want to r-e-l-a-x are in for a treat. 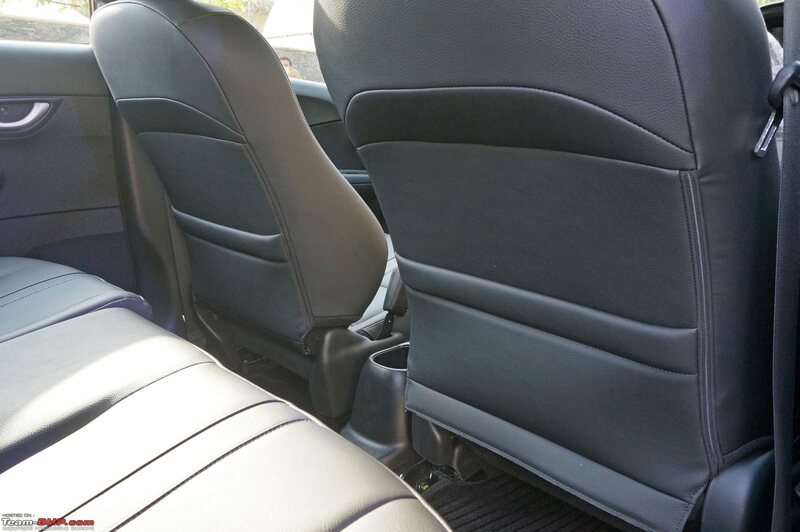 There is a center armrest as well and with it down, second row passengers can get very comfortable. This armrest, which is connected to the RHS seat, is at a good height and matches the armrest on the doorpads. The seatbase is sculpted, the seatback has some contouring and it offers good lumbar support. 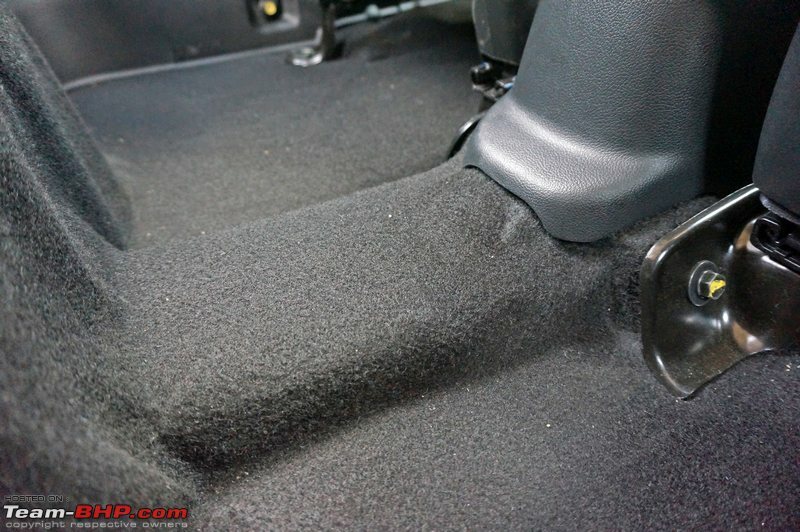 Coming to the negatives of the seat, while average sized people will find the under-thigh support to be adequate, a taller dude will feel it's lacking. Then, the headrests are nice & soft, but they have only two positions - full up or full down (should have had intermediate adjustments). We observed that there is plenty of length on the rod of the headrests, and it would have been preferred if they went up a little more. Must again mention that the BR-V is not a very wide vehicle. The middle row will be a squeeze for three healthy adults. Better to place two out here. Foot room in the second row is sufficient. The floor is almost flat and the floor hump is narrow (just about 2.5 inches off the floor). Additionally, there is a healthy amount of space under the front seats, which allows occupants of the middle row to slide their feet under. 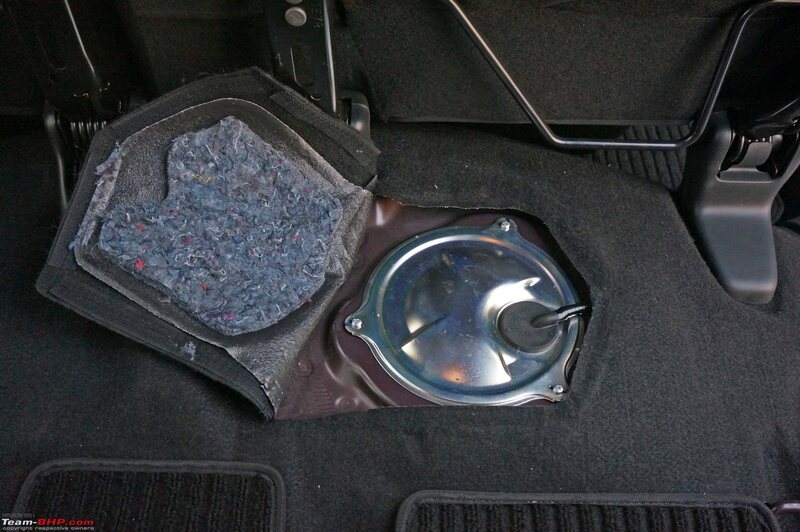 Strangely, the floor pan is an inch higher on the right side than on the left. The doors have sufficiently wide armrests. 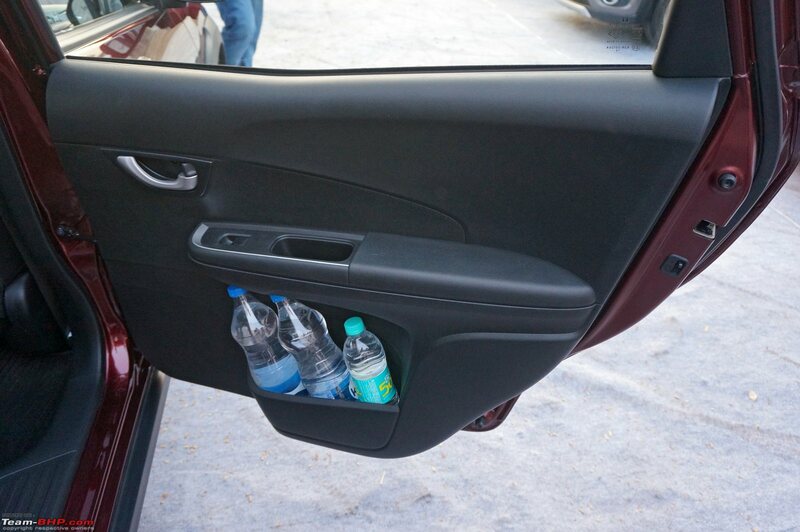 The door pockets can hold a 1-liter bottle each, with extra space for other items. 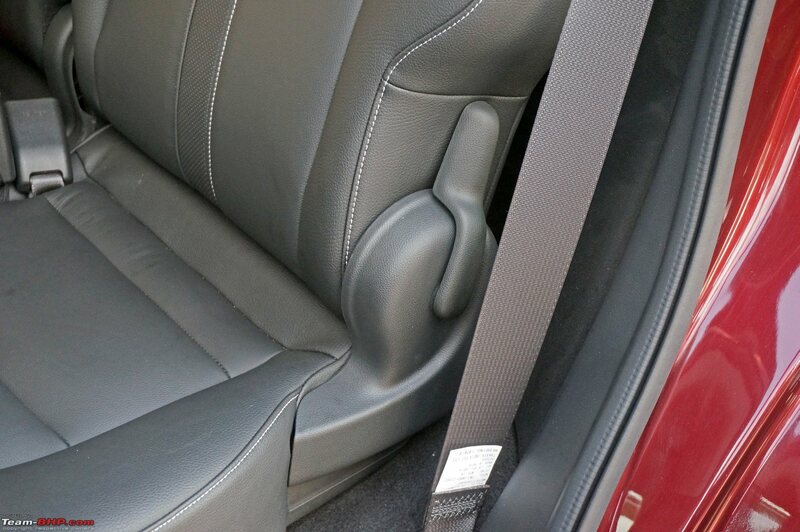 There is a bottle / cupholder just behind the handbrake and Honda has provided two seatback pockets too. The BR-V gets a roof-mounted air-conditioner unit for rear passengers. 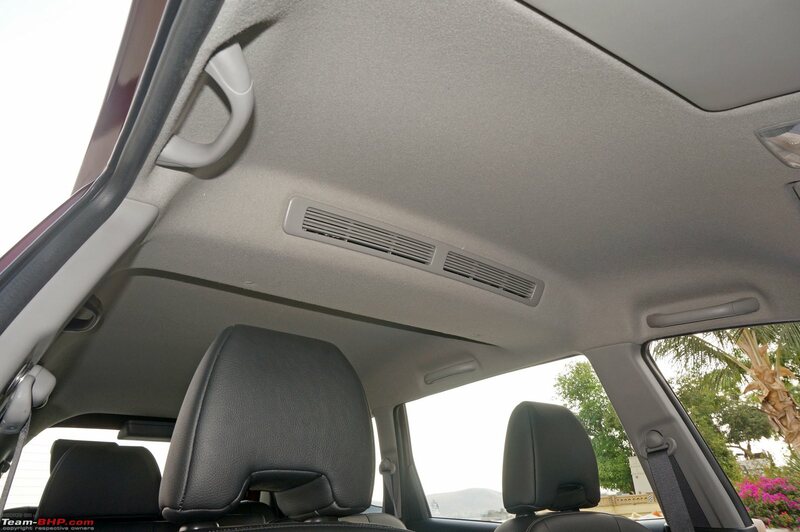 While the whole panel looks outdated and built to a price, it is very effective and has no trouble keeping 2nd & 3rd row occupants cool. With all that glass area in an Indian summer, you are going to need it. Honda has smartly provided the rear air-con on all variants, except the base. 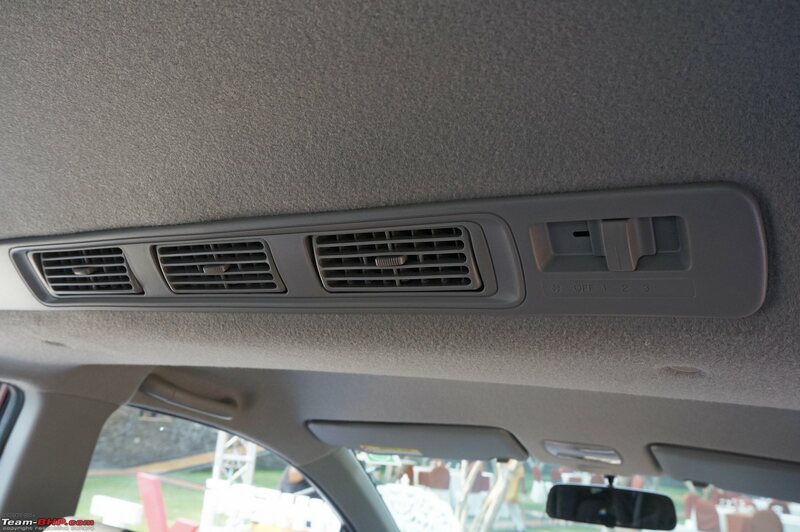 The rear air-con has 3 fan speeds. It is completely silent on step 1, although on step 2, it gets audible. On step 3, the blower is very noisy. This noise can get irritating after a while; you will surely go down on the speed adjustment. Pull the middle row's recline lever and it can be flipped + tumbled forward completely in just one motion. This is very convenient, even for those sitting on the last row. 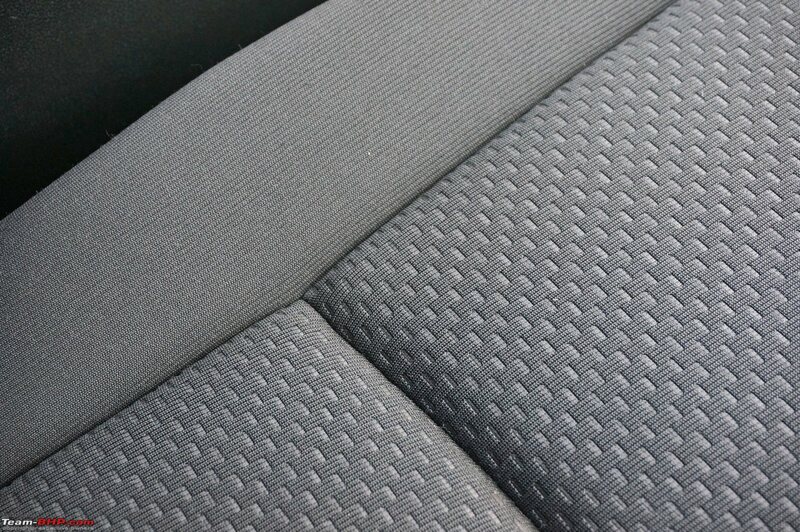 They can fold the second row away without anyone's assistance. The feature makes getting in and out of the third row quite easy. That said, the ingress / egress are clearly not a job for the elderly. Be kind and offer the front rows to them. 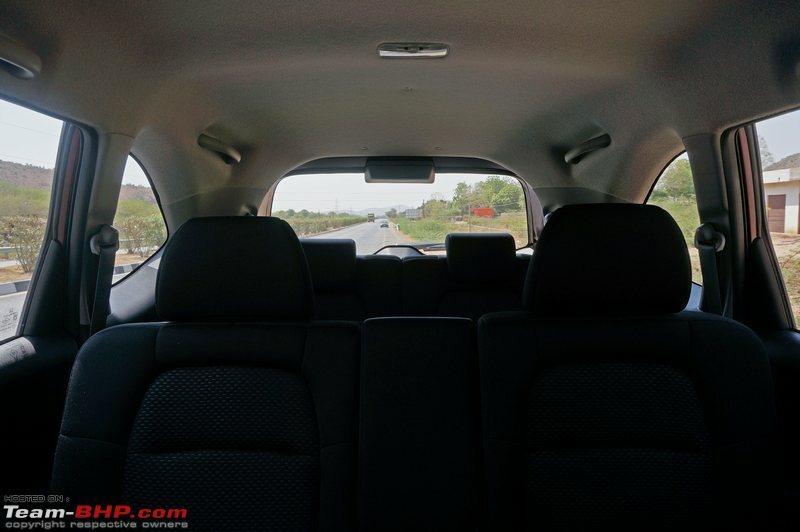 It's possible for the BR-V to accommodate a 5'11 driver, a 5'10 second row passenger and a 5'8 third row passenger, all sitting one behind the other. However, as we have seen with most seven-seaters, the last row of seats is suitable only for short adults or children. A 5'8 adult can sit straight in the last row with his hair just about touching the roof. 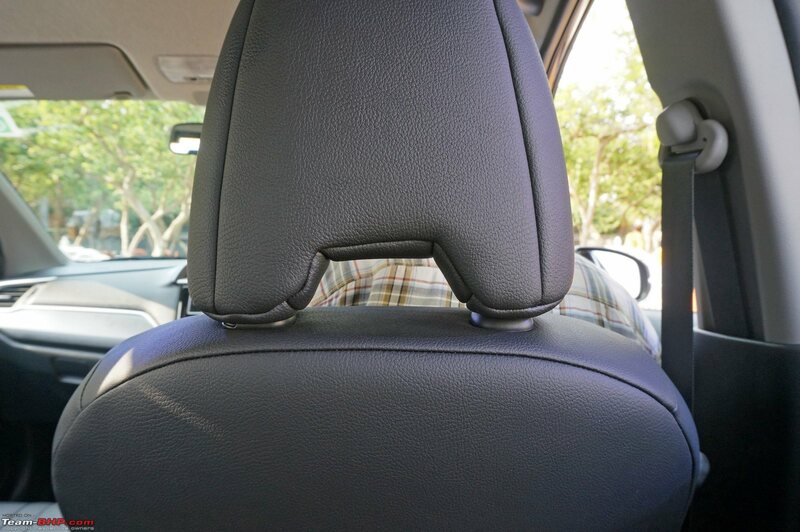 If the seat is reclined, the bulge in the roofliner will touch his head. With a slightly relaxed posture though, headroom increases and even a taller person can fit in. Tall adults can use the last row for short commutes in the city, but not for long highway runs. A cousin's wedding within Bombay & 7 adults onboard? Sure thing. The same crowd on a Bombay-Goa run? Forget about it. 5 adults + 2 kids is more like it. Under-thigh support is missing on the last row. The seat's cushioning is also poorer compared to the ones in the other rows. Medium-sized people with slightly longer legs will find their knees pointing skyward. Knee room is good if the middle row seats are pushed forward. In this position, one can stretch his legs out a little and get some more under-thigh support. Foot room is not enough though. 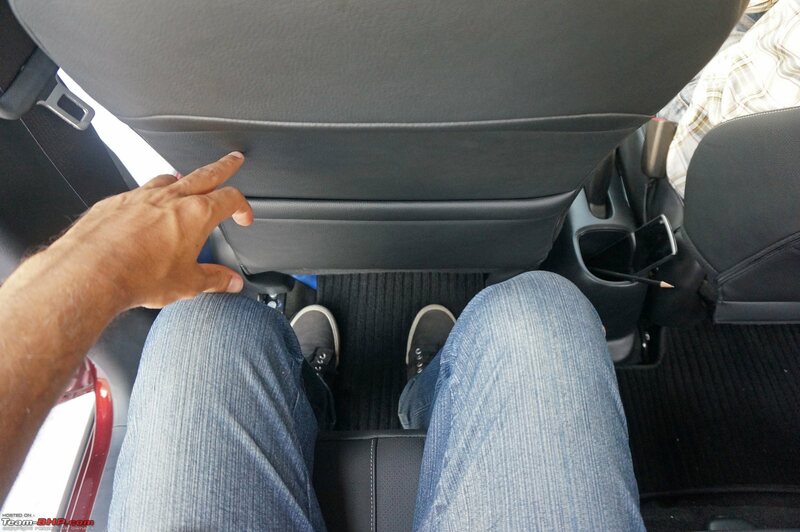 You cannot push more than 1/3rd of your feet under the seat in front. The 3rd-row seats can be reclined in four levels and set at a comfortable angle. Just like the middle row, the headrests have only two positions - full up or full down. Adults will be able to use them only in the latter position. There are wide and long armrests on both sides of the third row. These are very usable and you will inevitably find your arms resting on them. 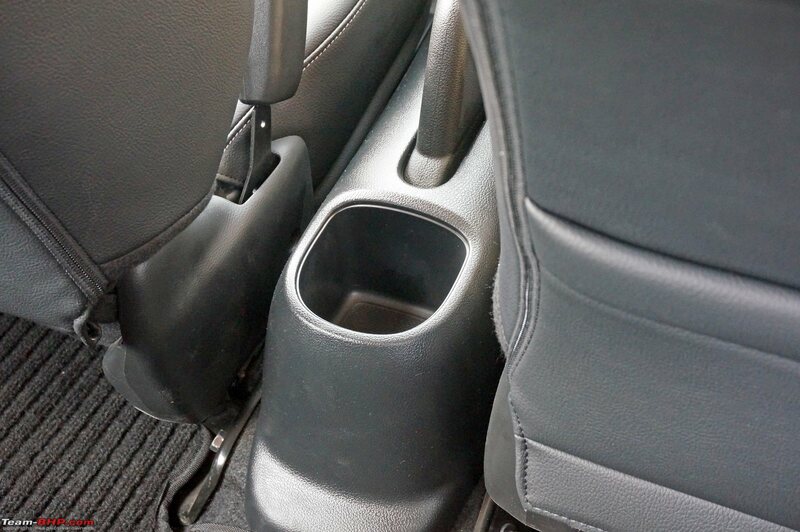 A cupholder has been provided along with a cubbyhole on both sides. 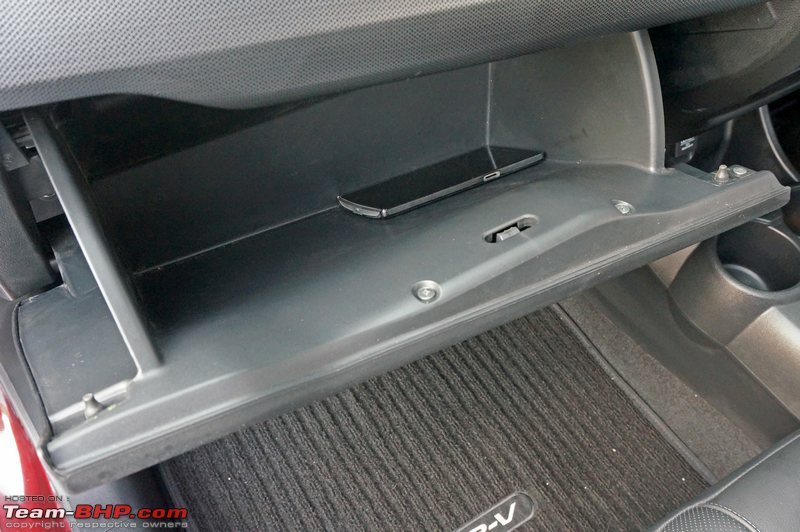 Interestingly, the cubbyhole on the left isn't as deep as the one on the right. The car's rear speakers are located just above the armrests. These come right next to the occupants of the third row seat and can be a good or bad thing depending on how they like loud music . 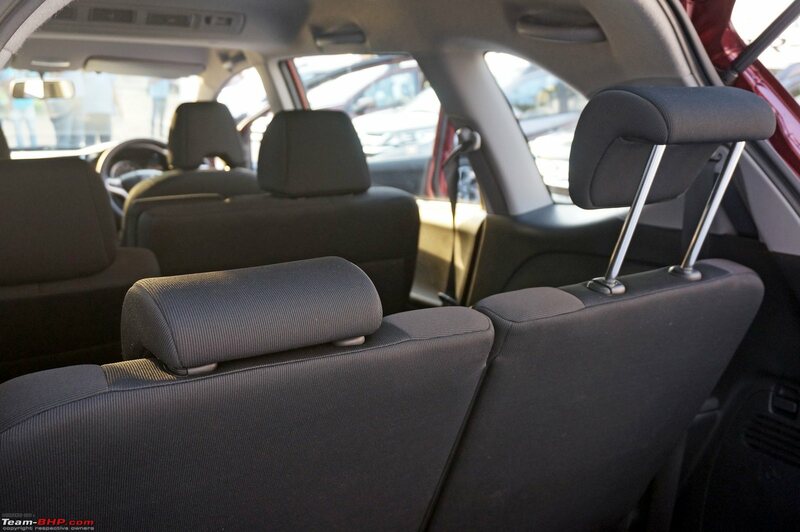 As is the case with most SUVs & MPVs, 3rd row occupants suffer poorer ride quality than others, due to the location of their seat (relative to the axle). You'll feel more vertical movement here than on any other seat. 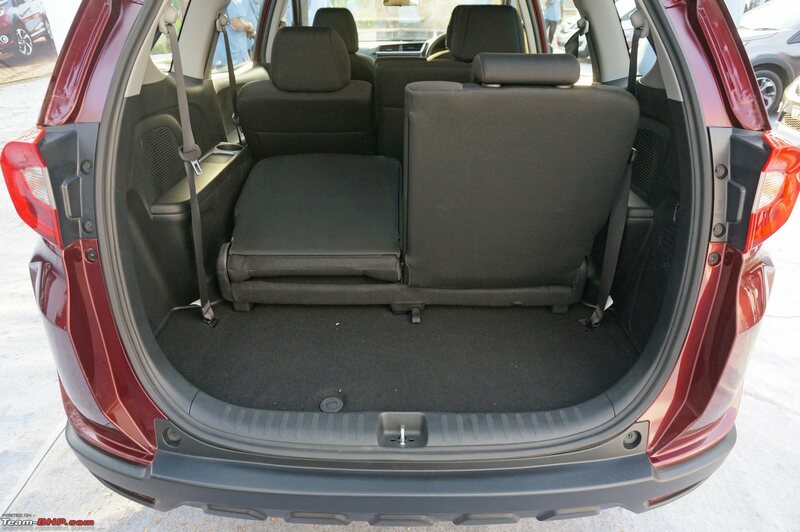 With all the seats up, the BR-V offers 223 liters of boot space. 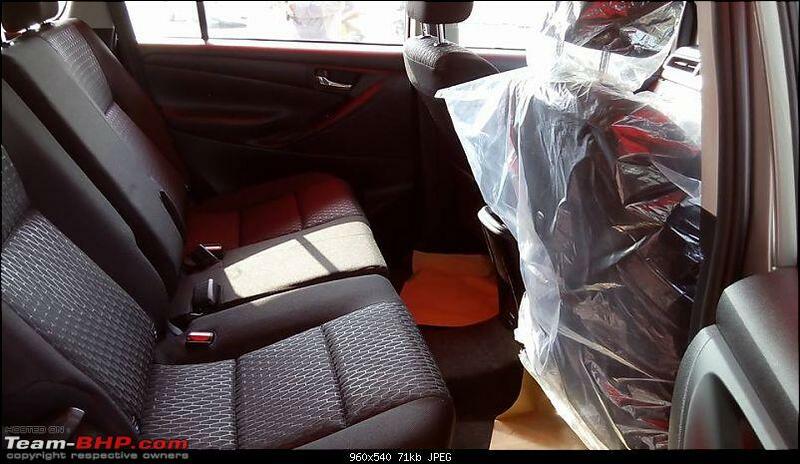 That's identical to the Mobilio and a lot more than the larger Mahindra XUV500. You can easily fit in 1 large + 2 small bags, or 3 - 4 medium-sized pieces of luggage. 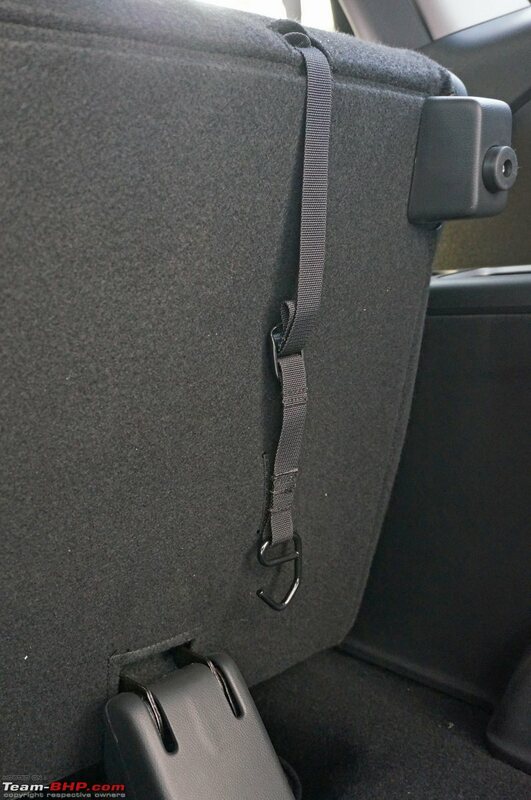 The third row can be flipped forward by pulling on a strap. 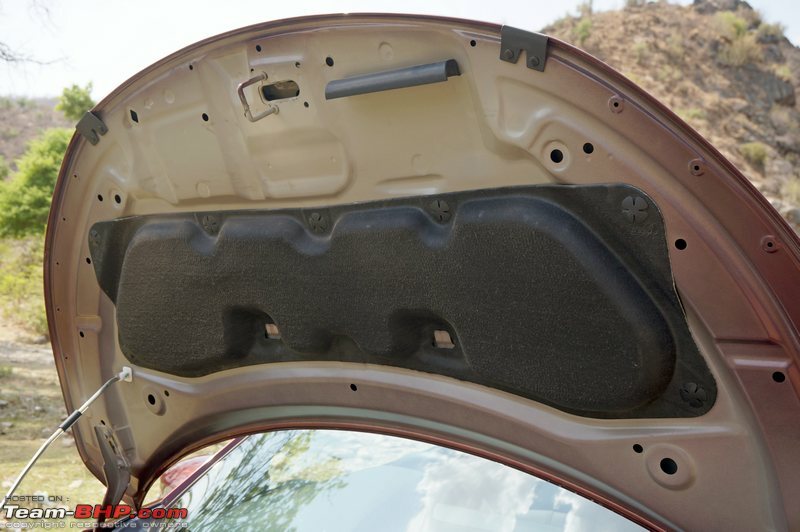 This will see cargo space increase to 691 liters. While the 3rd row flips forward, it cannot be stowed out of the way like the seats in the Innova & Ertiga. 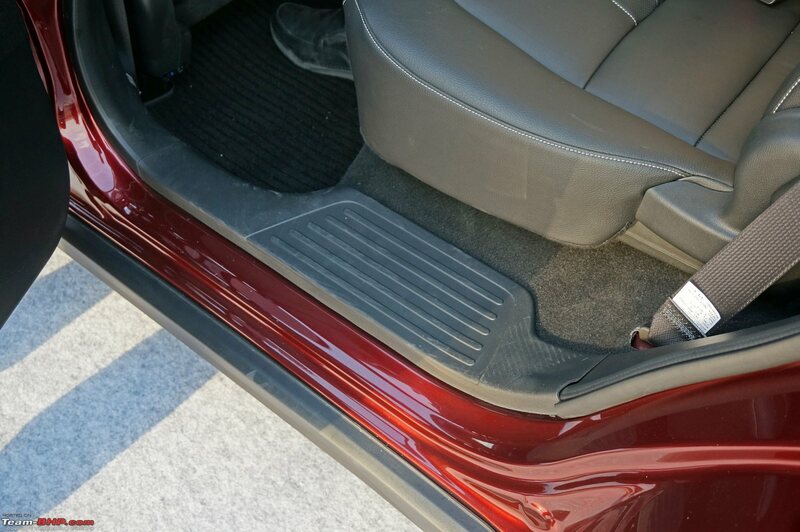 The backrest of the third row has a 50:50 split, which gives the boot some more flexibility. 6 people with luggage? No sweat. The spare tyre is held under the body of the car and the tools are stowed away neatly in a housing on the right side of the boot. Honda hasn't provided a dedicated boot lamp in the BR-V. However, you can use the cabin lamp placed right above the 2nd row seat. Large rear doorpad gets a long armrest, bottle holder and storage for an odd item or two. Just look at that enormous window area! Last edited by Aditya : 6th June 2016 at 10:00. Honda has done a pick & choose from its parts bin, with a lot of matchmaking. 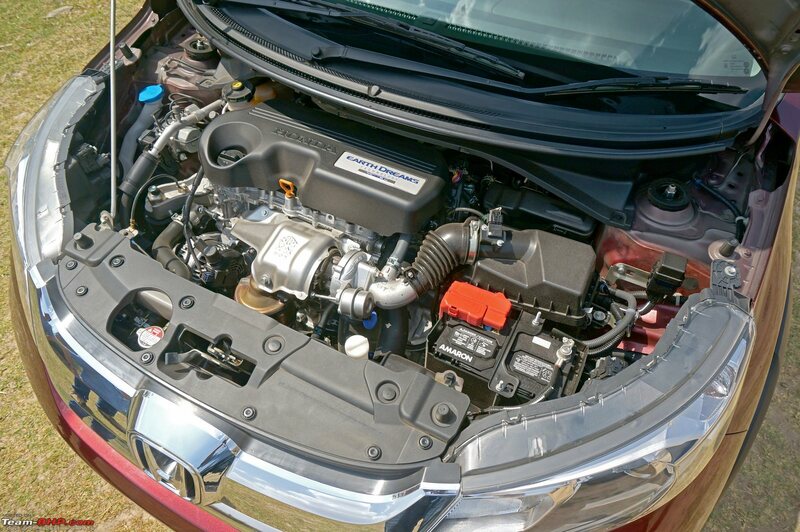 The BR-V is offered with the familiar 1.5L petrol & diesel motors. 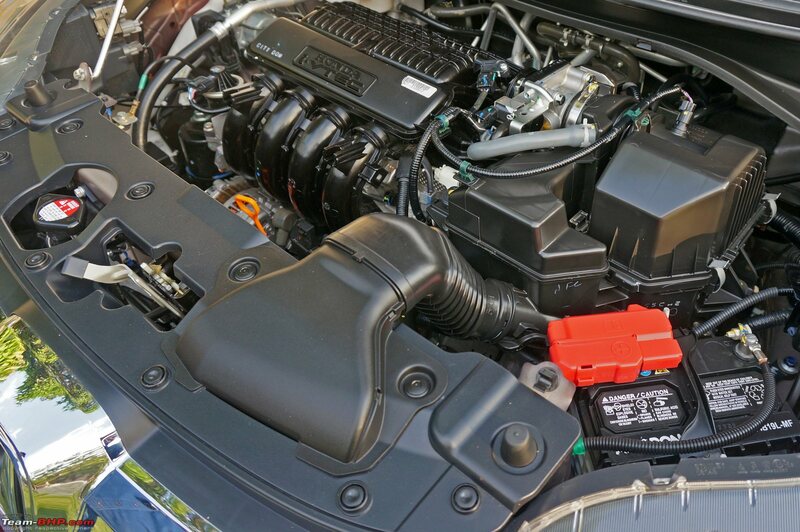 While the engine bay is the same size as the Amaze / Brio, the bigger 1.5L petrol engine is from the City (like in the Mobilio) and the 6-speed gearbox is new. 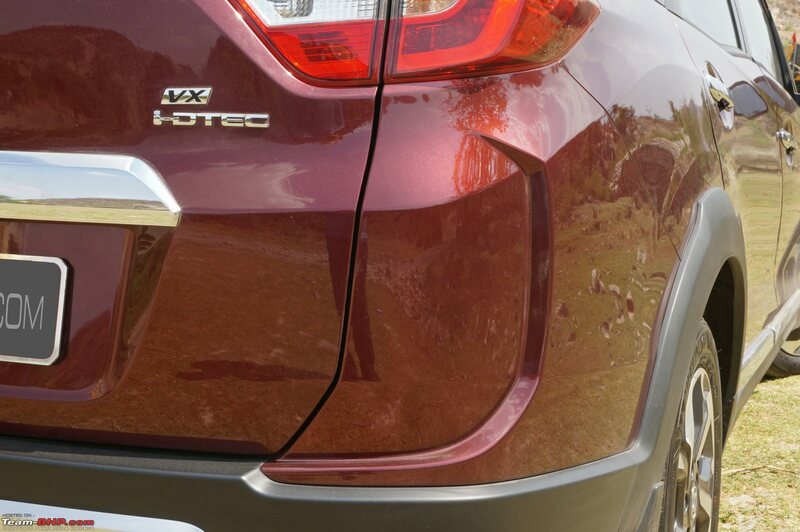 The 1.5L petrol & CVT automatic combination is a straight lift from the City. Also like the City, the 1.5L diesel is mated to a 6-speed MT. 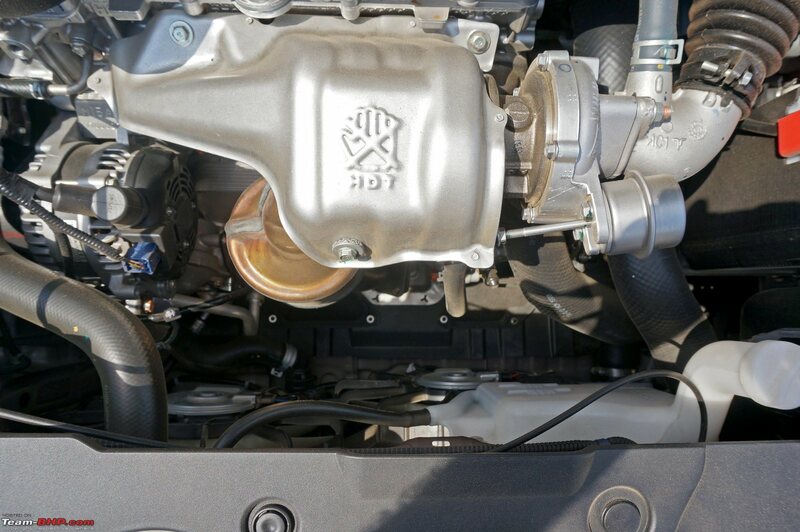 The diesel variant gets the now-familiar 1.5L, DOHC, 4-cylinder, 16-valve i-DTEC that produces 99 BHP (@ 3,600 rpm) and 200 Nm of torque (@ 1,750 rpm). Compared to the City diesel, the final drive ratio for the BR-V is 7.7% lower. Reason? Additional weight, including that of the 6th & 7th passengers. As opposed to the Honda petrols we know, this 1.5L i-DTEC focuses entirely on low-end power delivery. Simply put, in-city driveability is outstanding. Turbo lag is nearly inexistent, with the diesel motor responding well from idle rpms itself. Power delivery is far more linear than some other diesels that suffer from turbo-lag (last thing you want with 7 people onboard). It also means there is none of that sudden punch at 1,800 - 2,000 rpm which many turbo-diesels give. The engine has an incredibly tractable nature and within town, you only need to give it light accelerator inputs to potter about. The 1.5L moves away from crawling speeds in 2nd without breaking into a sweat, and even passes the 2nd gear speed-breaker test with flying colours. 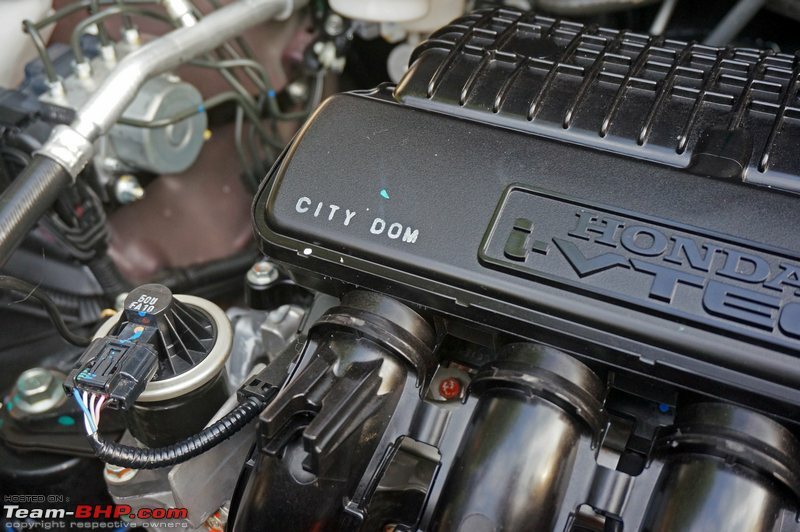 Throttle response at <2,000 rpm is satisfactory and in-city manners are a highlight of the engine. When driving in slow traffic, we are constantly shifting between the 1st & 2nd ratios, this is exactly where the BR-V has an advantage. 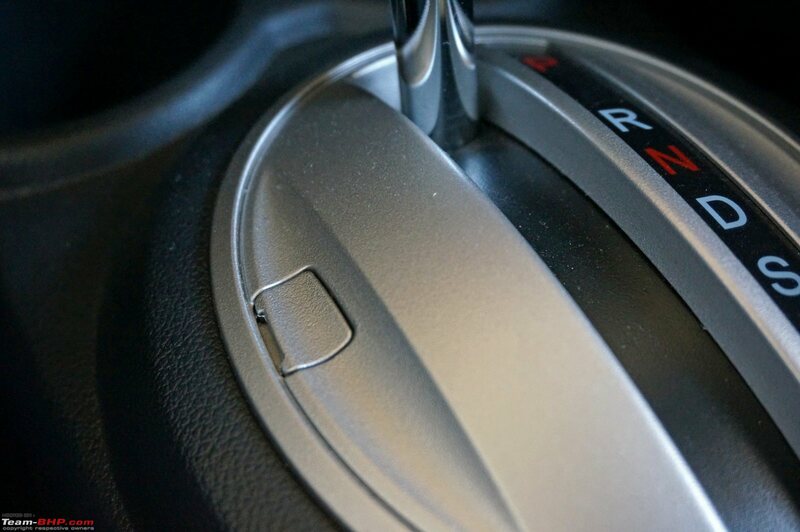 When traffic conditions are less dense, you could use 3rd gear as an automatic from 20 kph to beyond 100! With a power-to-weight ratio of 78 BHP / ton, the BR-V offers decent performance on the open road, but it's not a scorcher. Straight line acceleration is peppy enough and the car is capable of keeping up with C segment sedans on the highway (Duster 110 is faster though). 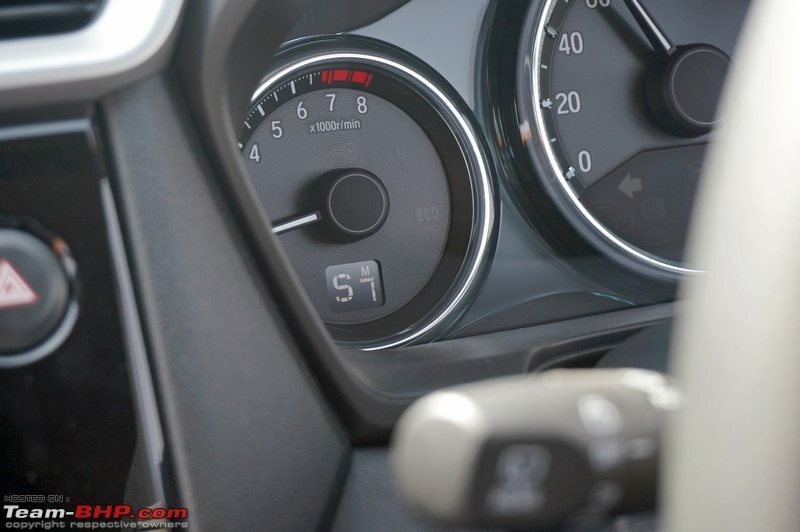 In 1st, 2nd and 3rd gears, the top speeds attained are 37 kph, 65 kph and 106 kph respectively. Overtaking isn't a problem and you don't have to worry about turbo lag catching you out in the middle of an overtaking manoeuvre either. 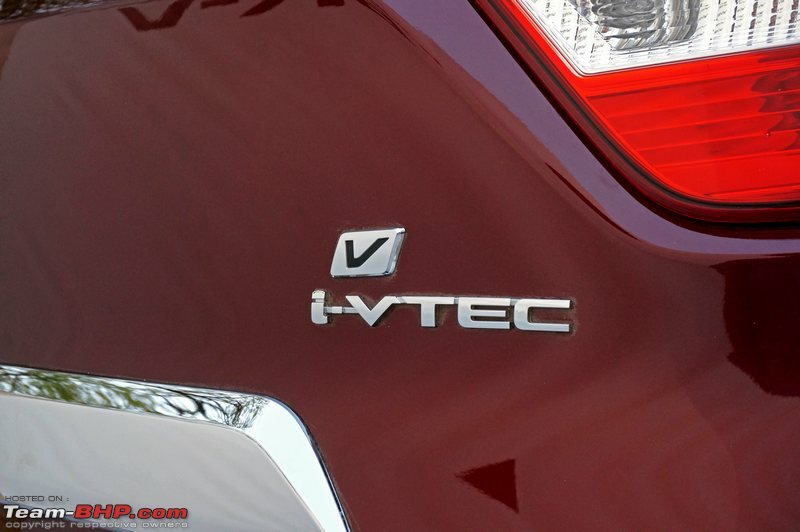 On the flip side, the i-DTEC isn't high rpm-friendly and revvs to a max of ~4,400 rpm only. 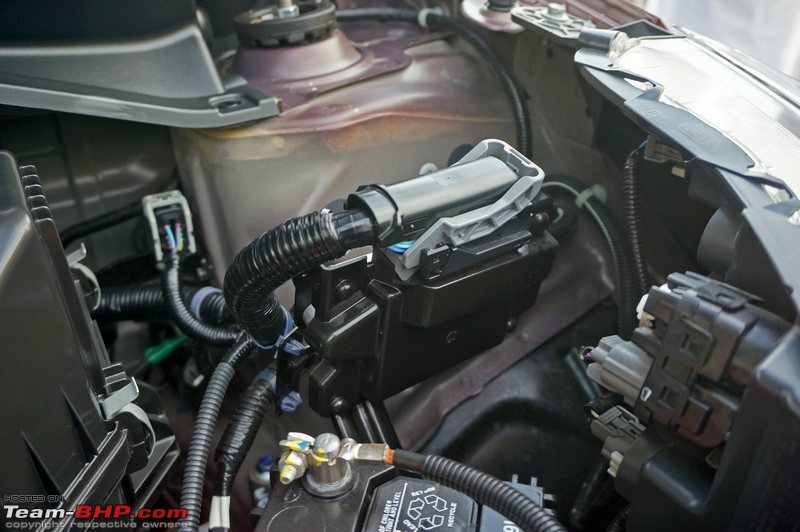 There's no point in taking the revvs that high, and it's best to upshift at 4,000 rpm tops. At high revvs, the motor doesn't sound or feel good either. Surprising for a Honda engine, I must say. In terms of cruisability, 100 kph is seen @ just 2,000 rpm in 6th gear (300 rpm lesser than the Mobilio in 5th), while 120 kph is @ 2,400 rpm. 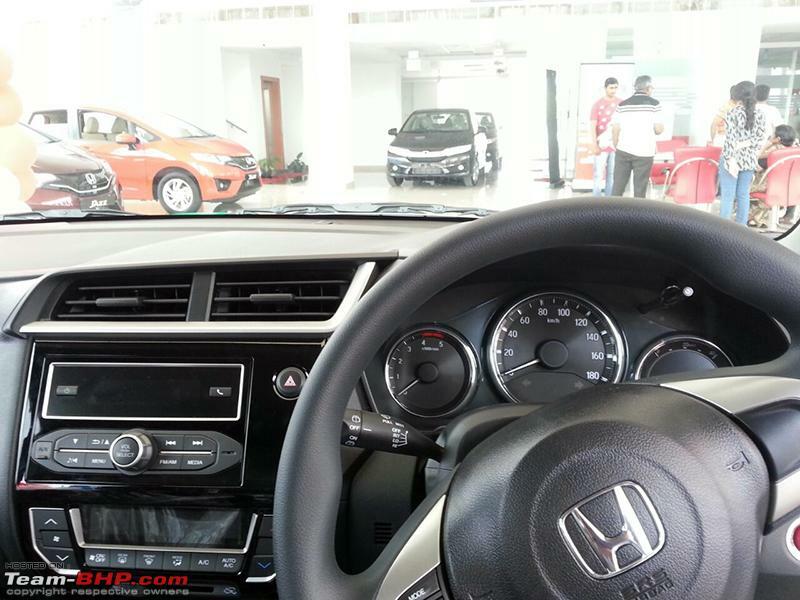 Top speed has been electronically limited to an indicated 145 kph (actual 140 kph just like the Mobilio). The BR-V made light work of inclines. Recovering from a stop on a climb is easy too, as the lack of lag means you don't have to slip the clutch. This absence of lag is a notable advantage when you're carrying 6 passengers with a full load of luggage. 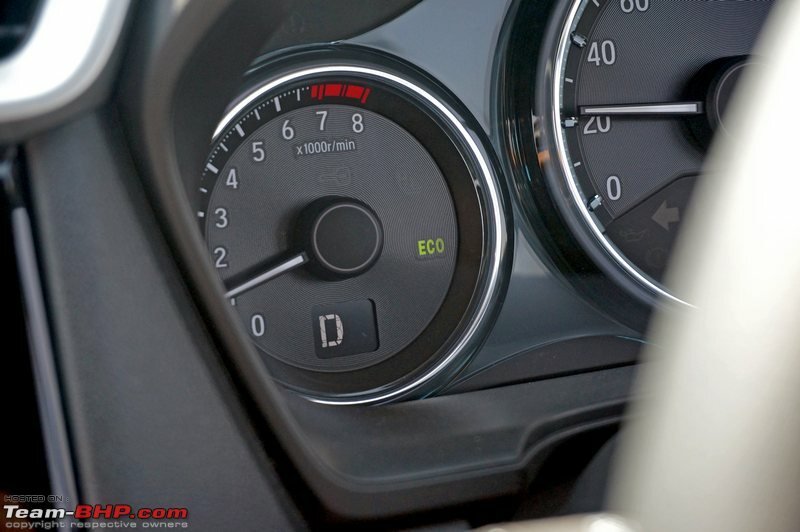 If you maintain a light foot and go easy on the rpms (1,500 - 1,800 range), the green ECO sign lights up on the meter console, indicating an economical driving style. A variety of parameters (including current gear, speed, road incline etc.) are considered by the ECU for the ECO mode. The ECO light also comes on whenever you are decelerating, or the car is free-wheeling. Low turbo-lag cars usually record high fuel economy figures within the city as there is no need to unnecessarily revv, and the BR-V is no different. 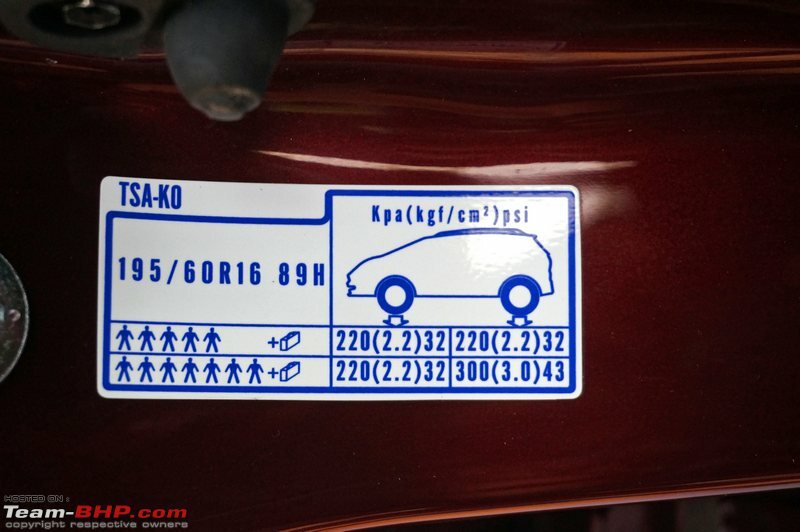 Its ARAI fuel economy rating is 21.9 kpl. The short throw gearbox with well-defined gates is nice to use. However, it's not butter-smooth and has some notchiness. 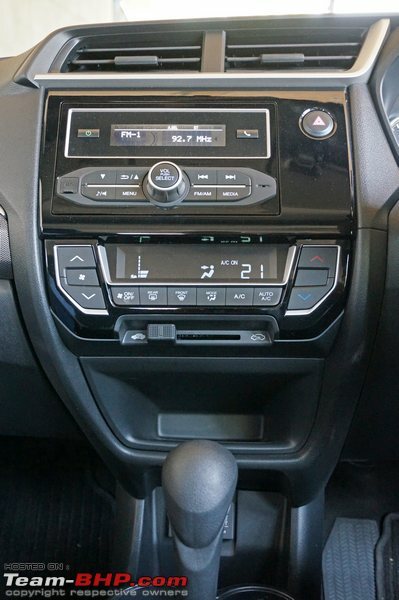 The clutch isn't as light as that of the BR-V petrol, yet isn't a pedal I'd call heavy and complain about either. It's par for the course in terms of effort required. Honda has worked on feedback from its customers and reduced the diesel's noise levels. No, it's far from the best in class and can still get audible, but surely isn't a deal breaker. 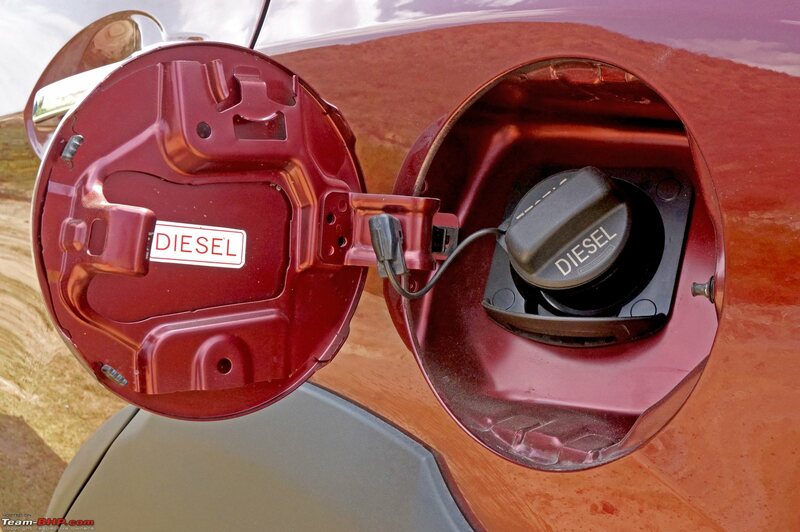 We'd say that the diesel's overall refinement levels are now 'acceptable'. 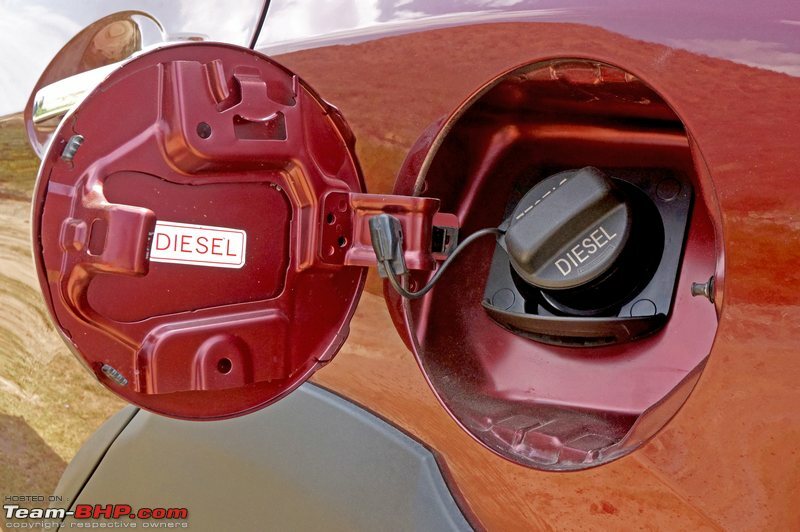 On the move, the diesel engine does make its presence felt, yet it's not excessive. It's only over 3,000 rpm that things start getting loud. The engine note isn't pleasant and the motor sounds rather UV'ish. As I took the rpms higher, it reminded me of how the Innova sounds, albeit at a lower decibel. 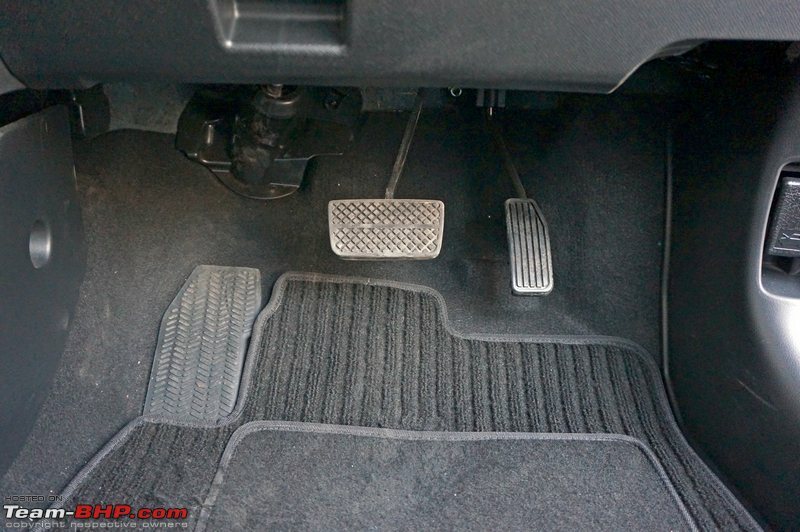 Some vibrations are felt on the pedals (most prominent on the clutch pedal) too. 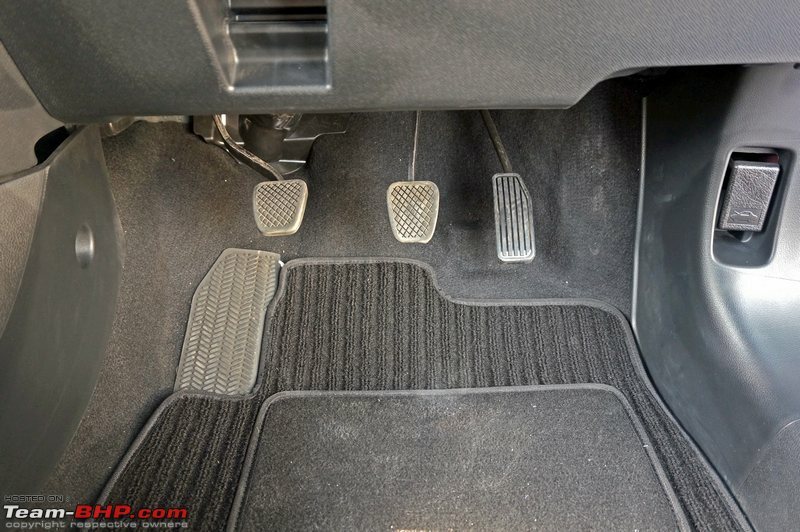 Of course, other than the pedals, vibrations aren't present anywhere else in the car and passengers won't be complaining at all. 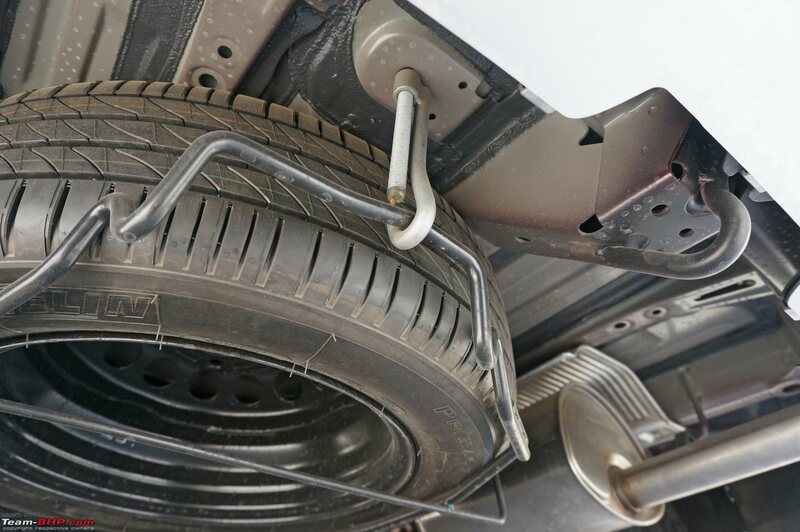 Insulation from road & tyre noise isn't satisfactory at highway speeds. At 100 kph, road noise is on the higher side. Above 120 kph, wind noise is prominent as well. The BR-V Automatic has the same 1.5L i-VTEC as the MT, with 117 BHP and 145 Nm on tap. 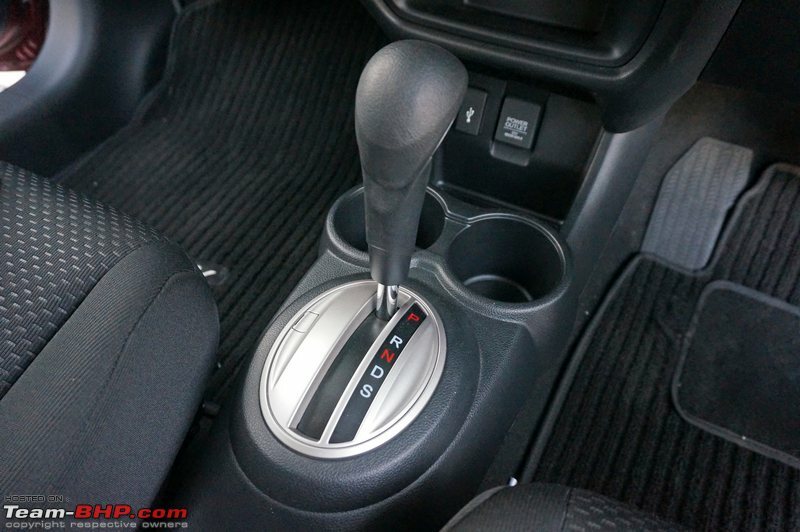 Like the Amaze, City and Jazz, the BR-V AT comes with a CVT (continuously variable transmission). 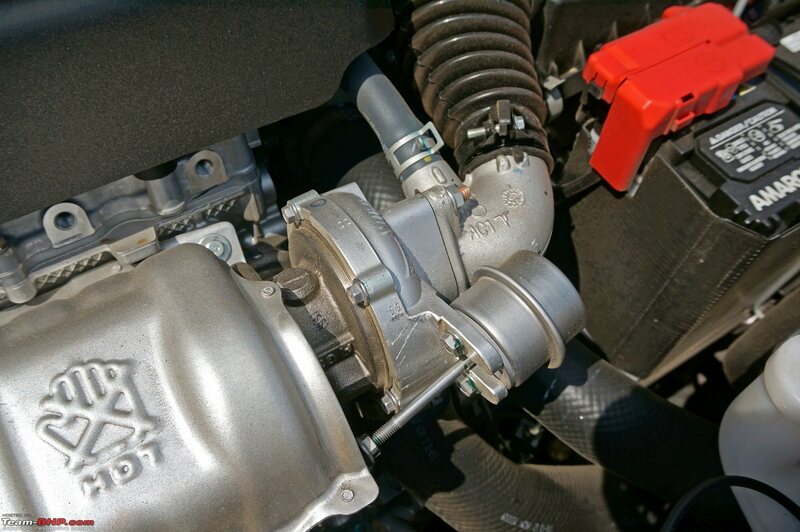 A CVT has less moving parts than a conventional AT, and is lighter too. 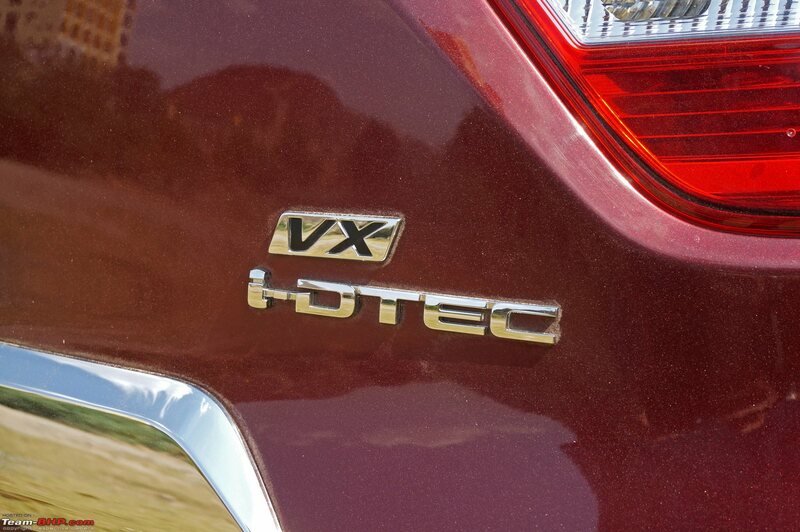 Honda is moving to CVTs in a big way in the world's largest automatic market - North America. If you're considering the CVT variant, be advised that these transmissions are incredibly sensitive to maintenance schedules. 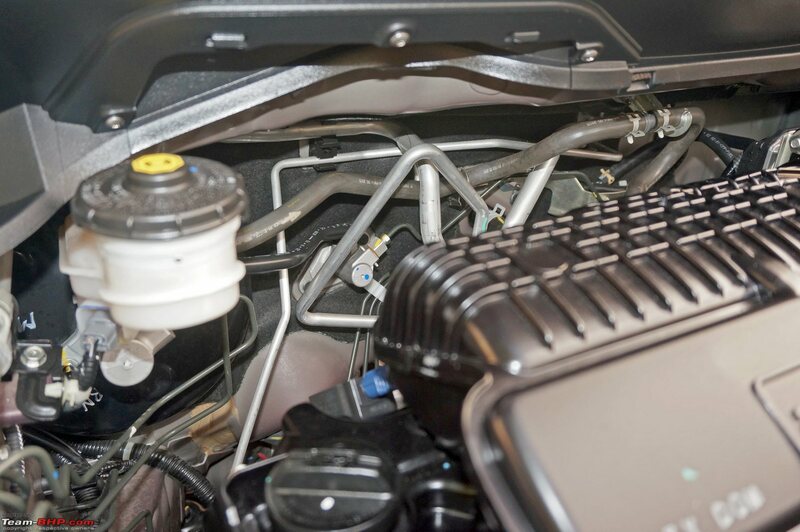 It's critical to change the transmission fluid on or before time. Be sure to check out this post. The BR-V AT gets steering-mounted paddle shifters that let you access 7 'virtual' gear ratios. 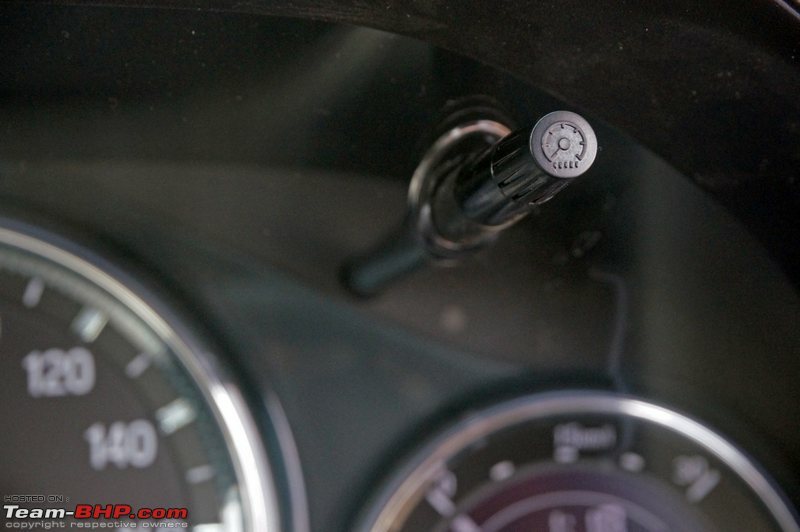 A gearshift indicator (e.g. D1, S4, etc.) on the instrument cluster shows you what predefined 'virtual' ratio you've chosen. Unlike the City however, the BR-V CVT doesn't get an ECON button which makes the ECU choose settings to maximise fuel-economy. 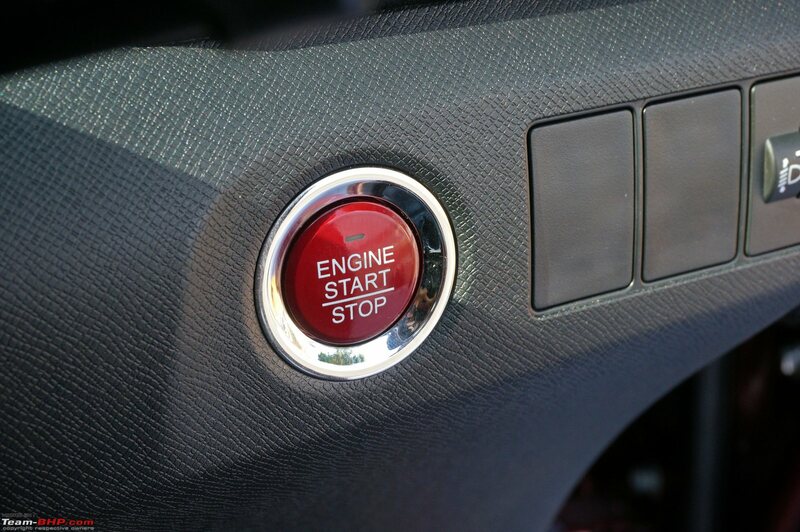 Start the car by putting your foot on the brake pedal and hitting the starter button. Take your foot off the brake and the vehicle starts rolling. The car slowly creeps at a speed of <5 kph. This creep speed means that you can drive the car with just the brake pedal in stop & go traffic (no need to press the accelerator). 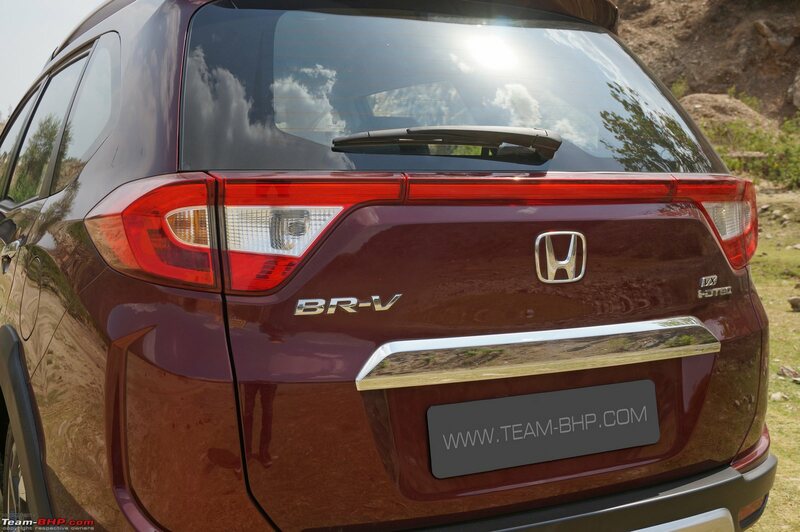 The BR-V CVT provides an eerily seamless experience in the city. There aren't any actual gearshifts taking place, hence the drive is smooth as silk. In the traffic conditions of Indian metros, you'll rarely see the rpm needle cross over 2,000. It uses a higher ratio at the earliest possible opportunity. By CVT standards, throttle response is good and the rubber-band (slipping clutch) effect is well controlled under normal driving conditions. That it's mated to a powerful 1.5L engine helps mask some of the CVT's deficiencies, yet there isn't a doubt this type of transmission has come a long way. Most folk won't be able to tell the difference from a normal AT, except for the 'shiftless' drive. 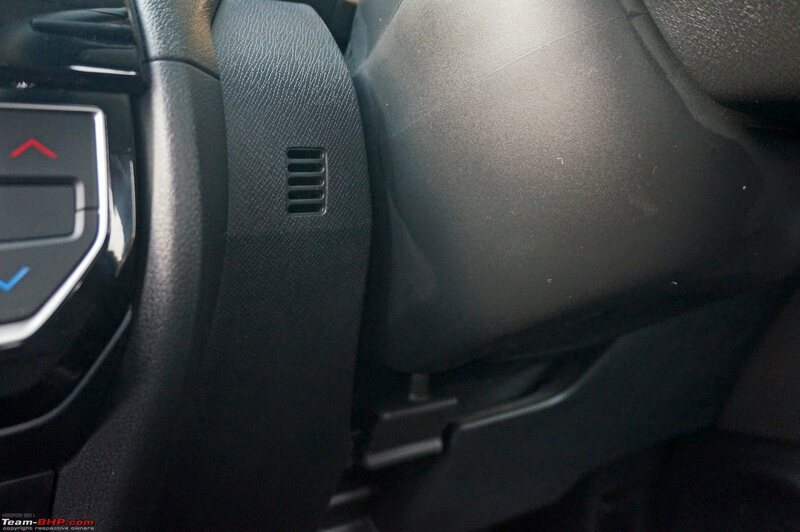 The BR-V's light steering and smooth transmission make for an ideal combination in our congested cities. 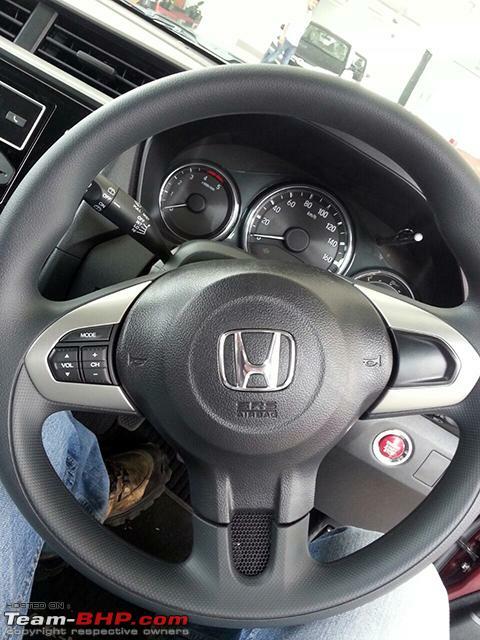 Over your daily drive to work, don't even bother with the paddle shifters. Let the transmission do all the work. 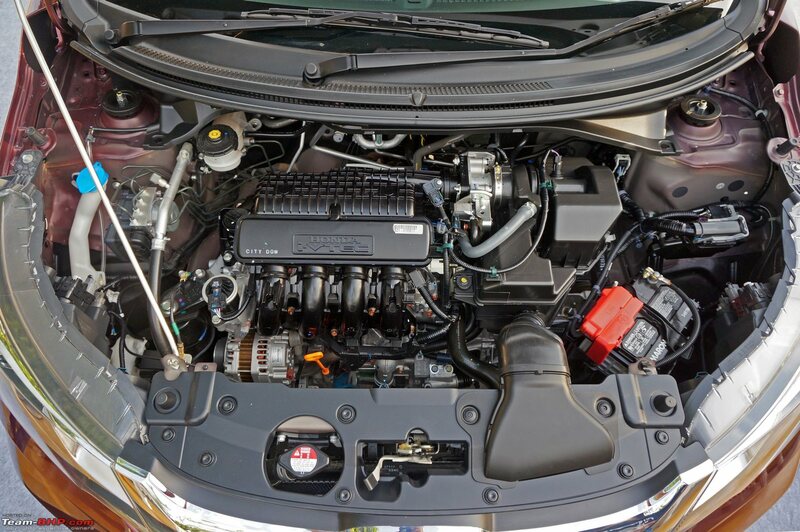 Because of the power on tap, you won't call the BR-V CVT slow on the highway. Spend some time understanding the transmission's characteristics and you can make fast progress. This CVT completely demolishes the likes of the Sunny & Scala CVTs. It's only when you suddenly poke the accelerator expecting instant grunt (say, to overtake the car in front) that the rubber-band effect raises its ugly head. Floor the accelerator abruptly and all you see is a rise in engine rpm, with no corresponding increase in speed. 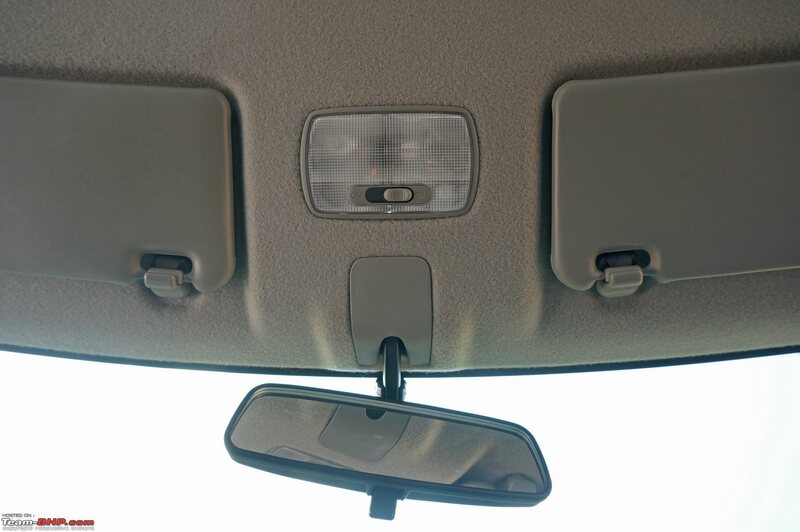 In such a situation, the car will be slow to respond and the rubber band effect can get very annoying. 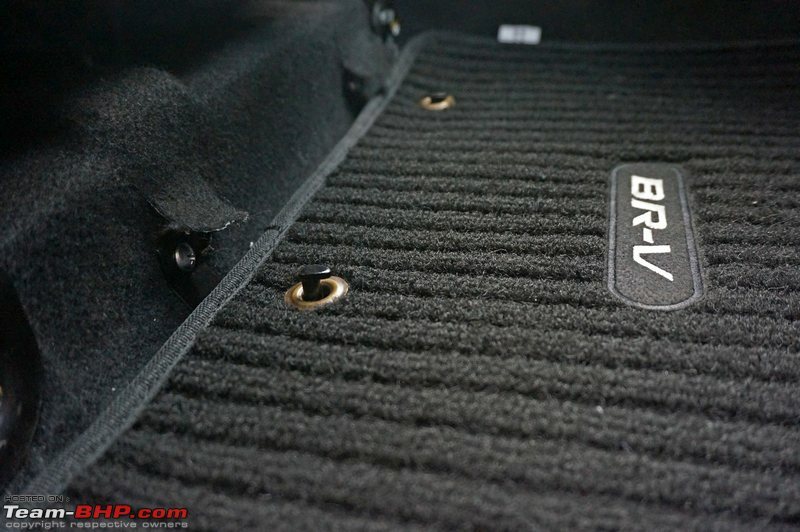 The BR-V (like other CVTs) drives best with light to mid-range accelerator inputs. With a CVT, it's important to 'prepare' the car in advance for a quick overtaking manouveur. I found that the best way to overtake is to move the gear lever to 'S' mode and make use of the paddle shifts. 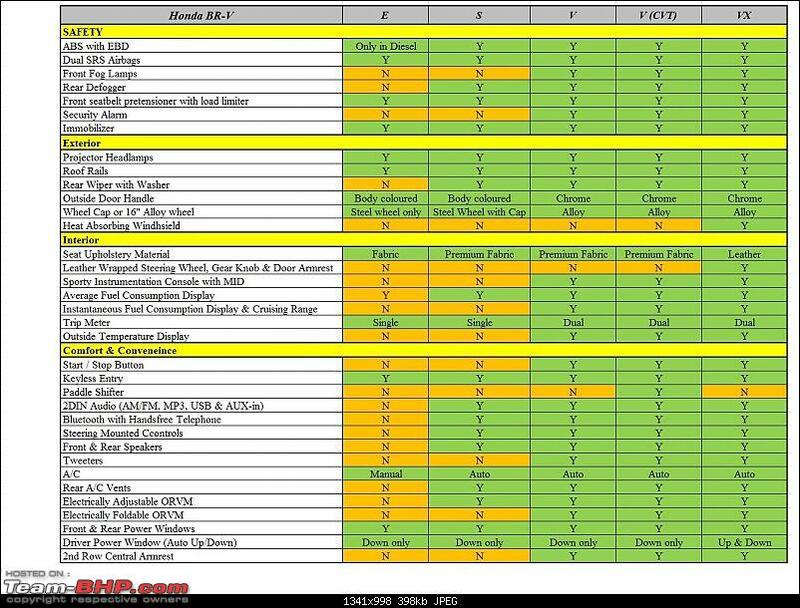 S mode basically makes the engine & transmission work harder, going till the redline before the CVT gets a higher ratio. 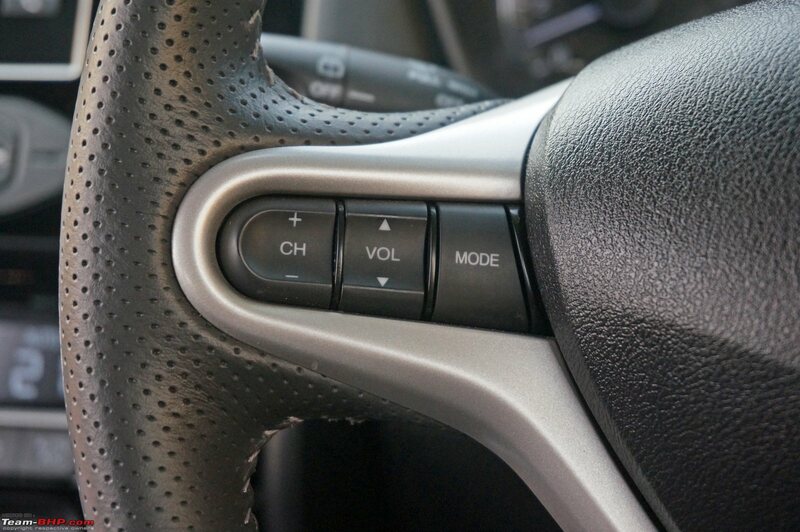 With the S mode and paddle shifters, you can also extract a good amount of engine braking from the gearbox. Still, in terms of driving pleasure, conventional ATs or the DSG are a whole lot more fun than this boring CVT. The BR-V CVT is more suited to a calm cruiser than a fast enthusiast. 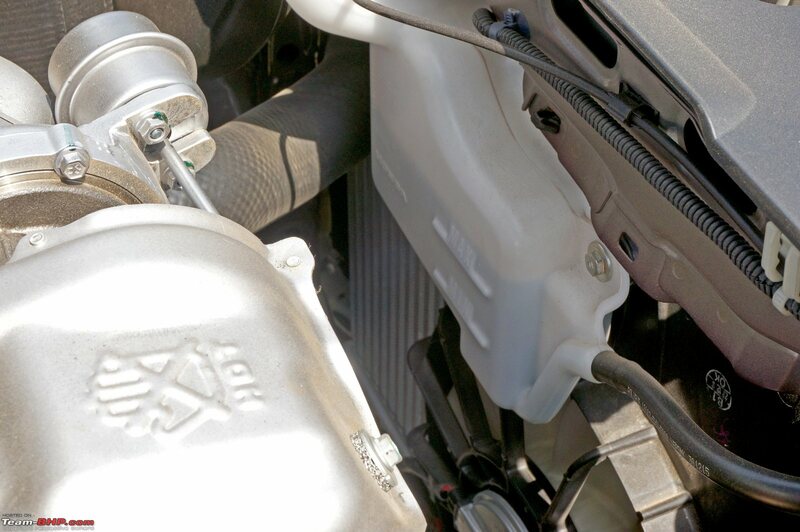 Must mention that the 1.5L petrol can get noisy over 3,500 - 4,000 rpm. Enthusiasts will like this sound, normal folk won't. CVTs can be more fuel-efficient than conventional ATs (but not well-driven manual transmissions). 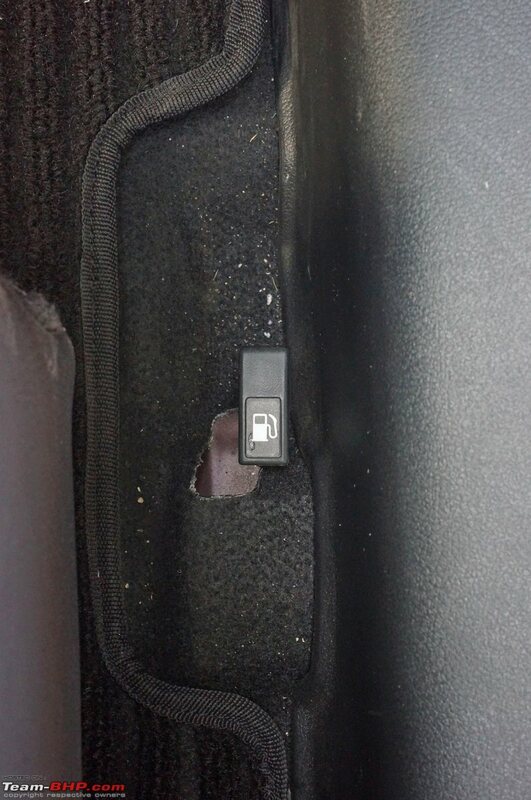 Drive with a light foot and you should see acceptable fuel economy. 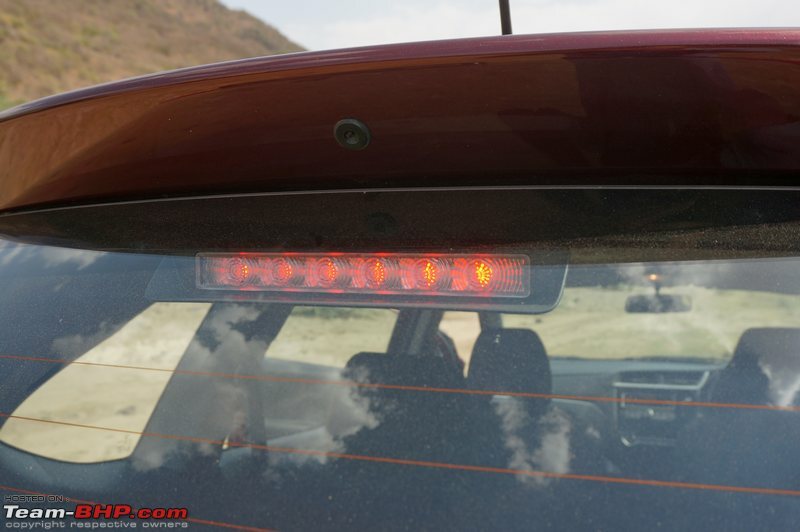 An ECO light comes on in the instrument cluster when the car is being driven economically. 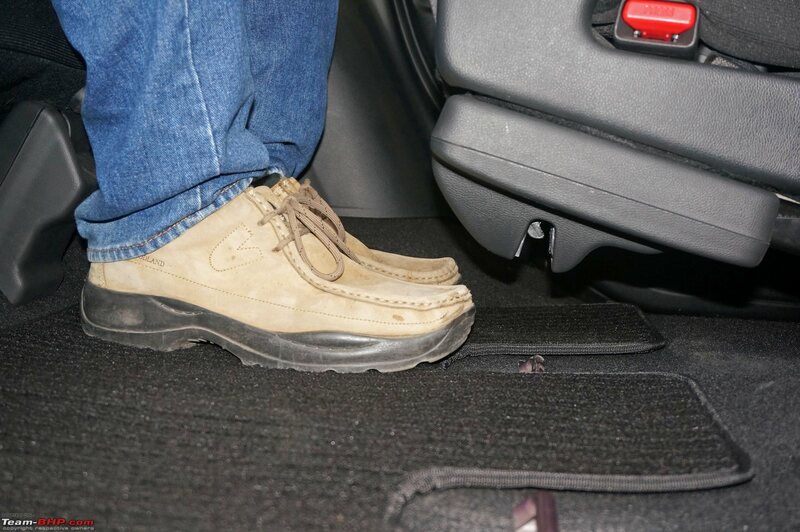 On the flip side, a heavy foot will see your efficiency drop drastically, more so because it brings in the CVT's rubber-band effect & 'wasted revvs'. The CVT's ARAI rating of 16 kpl might be slightly higher than the MT, but don't let that misguide you. 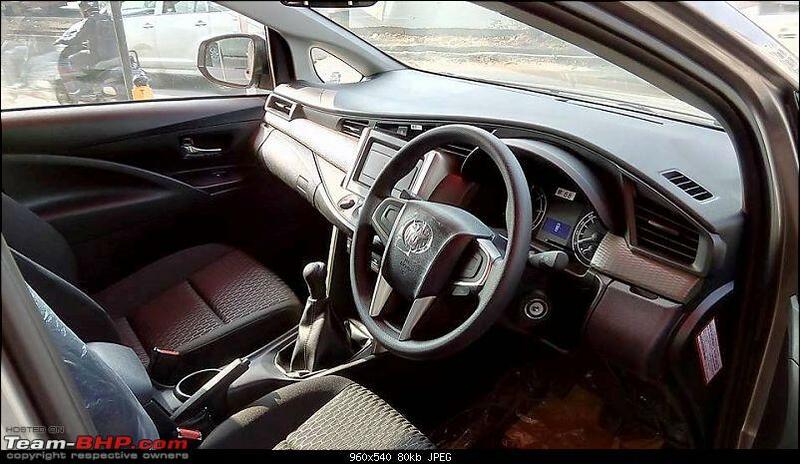 The only reason for the rating is the CVT's ability to cruise at high speed with low rpms. We'll leave final kpl reports to our ownership reviews which have accurate real-world numbers. 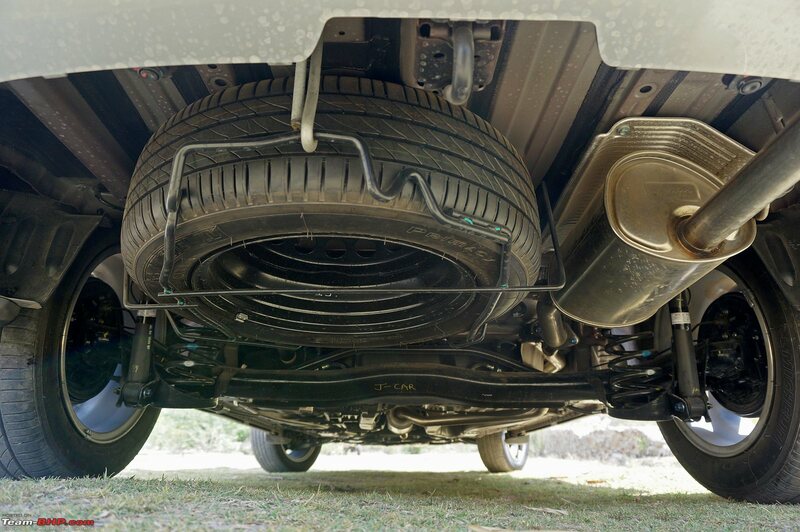 The suspension is a ubiquitous McPherson strut front & torsion beam rear. 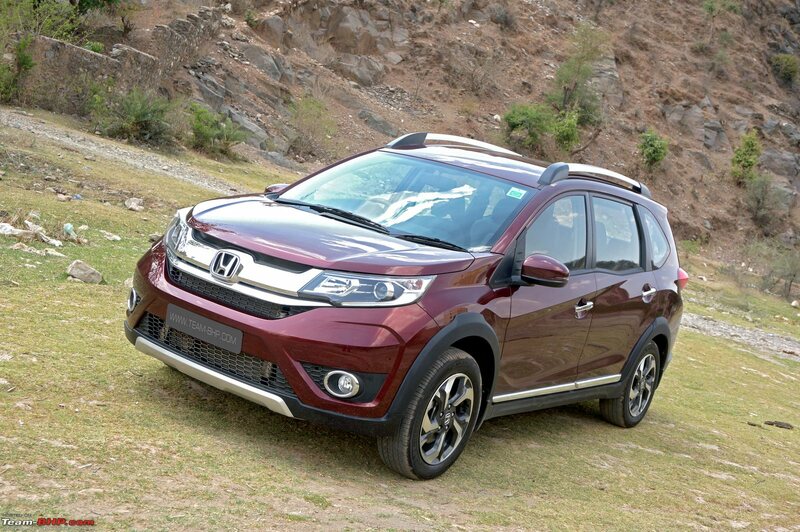 The BR-V offers a good balance between ride & handling, and owners won't have any complaints on either front. Monocoque SUVs offer superior road manners to the body-on-frame variety. The former are also far more light & car-like to drive, thus easier to live with in the city. Monocoque SUVs usually have a front wheel drive layout (as the BR-V is), unlike most body-on-frame UVs that are rear wheel drive. Urban ride quality is satisfactory. The suspension is compliant over most road conditions and absorbs bumps in an effective manner. Slightly taller tyre sidewalls & bigger wheels (relative to its sedan sibling, the Amaze) also improve bump absorption capability. 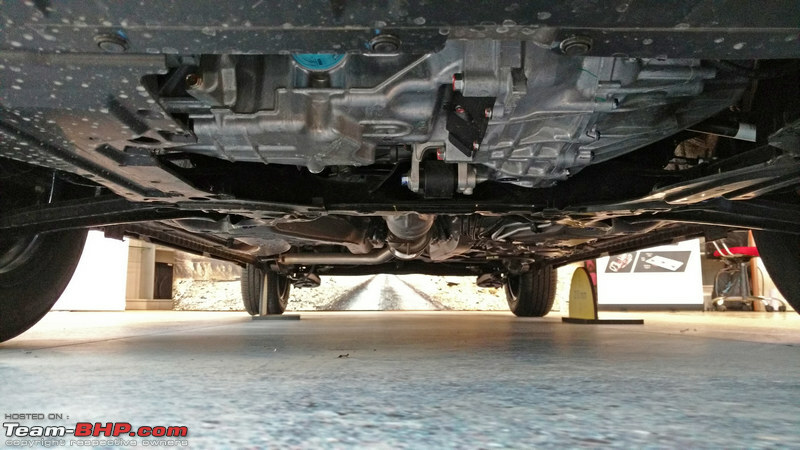 We were particularly impressed with how potholes were handled by the BR-V. It did a great job of minimising jolts felt on the inside. Ride quality remains comfortable at speed and the BR-V flattens out bad highway patches acceptably well. It's important to mention that the rear is stable and there is none of the excessive vertical movement or bounciness that so many SUVs suffer from. Don't get me wrong though, it's no 'magic carpet' suspension like the Renault Duster. Sharp + big bumps are prominent in the cabin, especially on the last row of seats where it comes in solid. Then, there is a certain amount of suspension stiffness that is felt more on the 2nd & 3rd rows than at the front. By SUV standards, the BR-V's handling is excellent. Let me put it this way: If you're moving from a regular hatchback / sedan to the BR-V, there is no learning curve for you to master. It drives just like a regular car. Conversely, if you're moving from a body-on-frame SUV, a pleasant surprise awaits you. 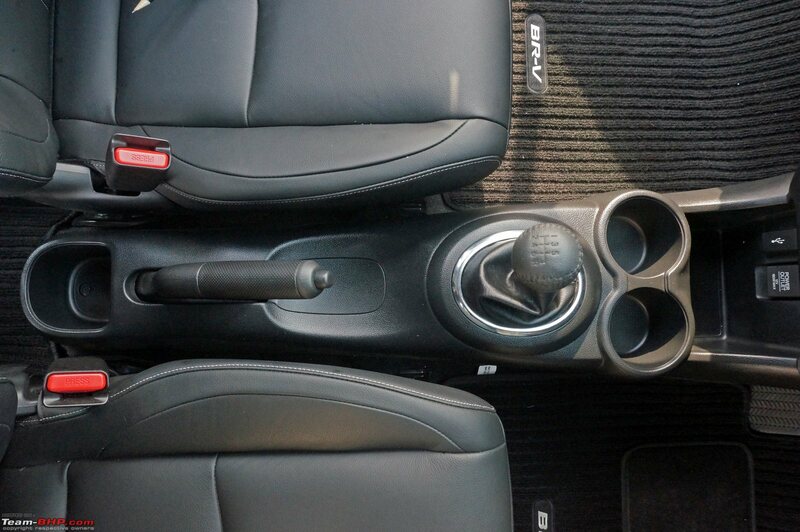 The light steering / gearshift / pedals and compact width make it a breeze to drive within urban India. Parking however, isn't due to the sheer length, awful rearward visibility and lack of reversing aids. 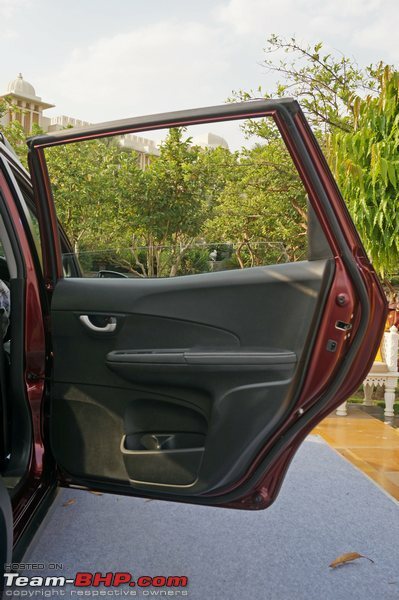 The petrol variant has a turning radius of 5.3 meters, while the diesel's is larger at 5.5 meters (even the Innova has a smaller 5.4 meter radius!!!). You should expect more 3-point turns than necessary with the diesel. 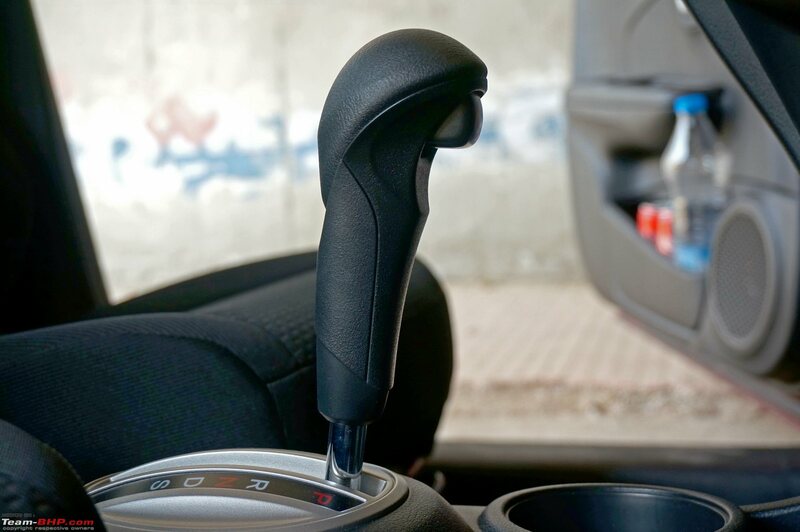 The steering is effortless to operate at low speeds and very direct in action. As the speedometer climbs, the steering does weigh up, but not as much as we'd like and you need to maintain a firm grip on it at 100+ kph. The 195/60 section Michelin Primacy tyres offer excellent traction (happy to see Michelin as an OEM choice). 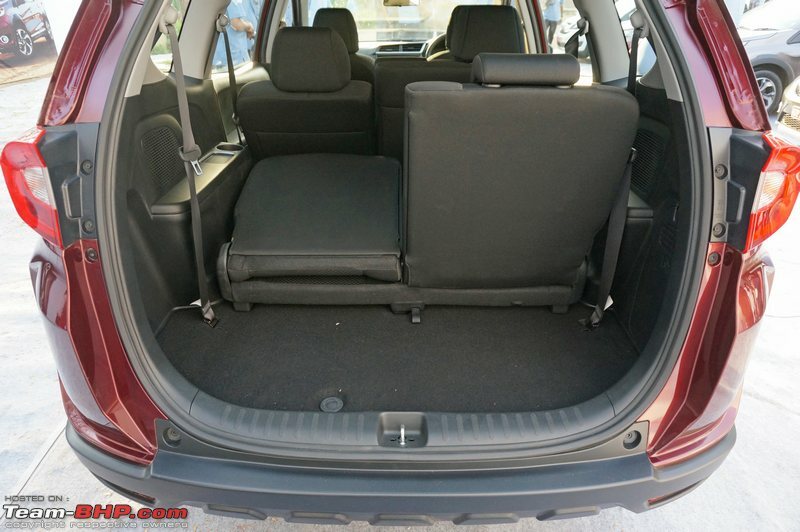 The BR-V's body roll is well-controlled for an SUV and there is no 'top heavy' feeling. Even on fast lane changes and swerving, the vehicle remained composed. You can actually push it around corners and it doesn't understeer too early. 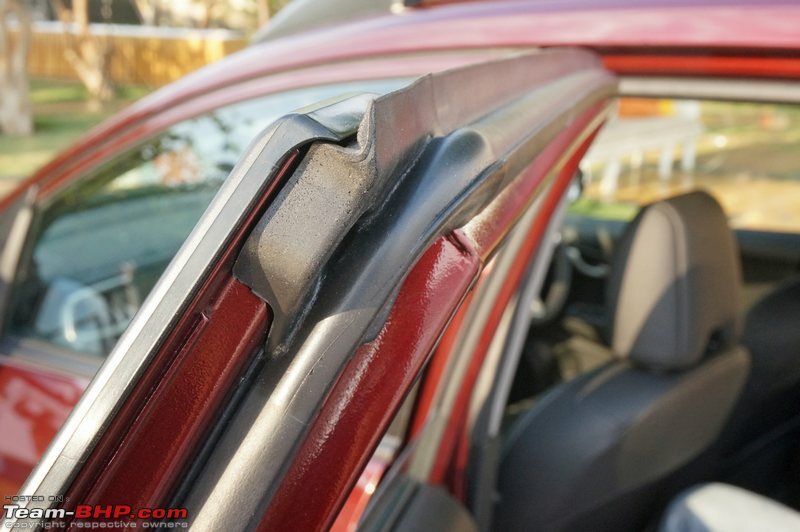 The BR-V is no corner carving tool for enthusiasts though, but suffice to say, it has competent road manners. 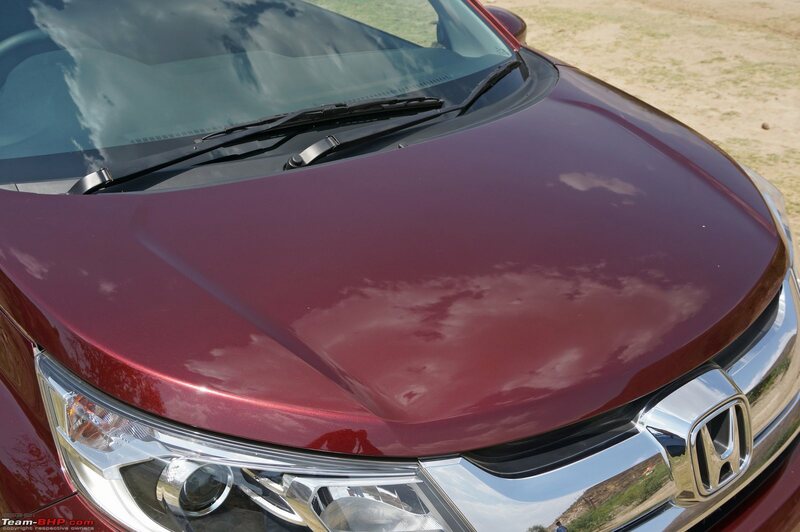 This is one Honda you won't have to worry about under-body scrapes in! 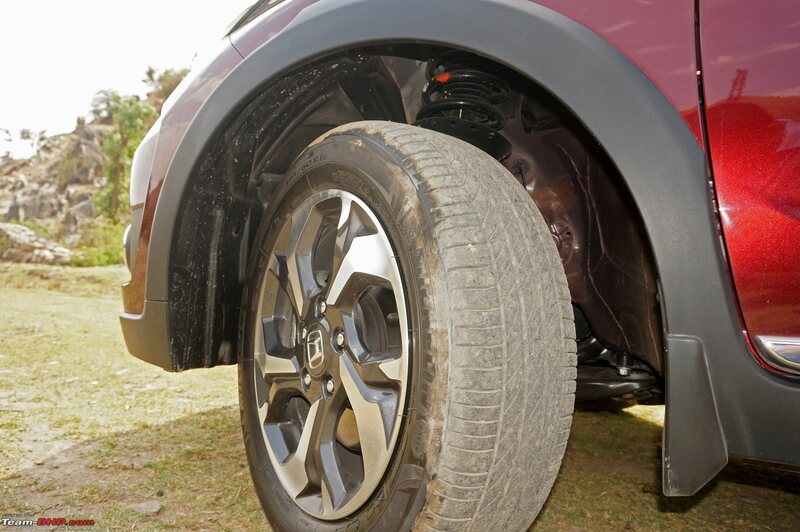 The BR-V has a ground clearance of 210 mm, which is at par with the Duster AWD! It ensures that you don't have to worry about scraping the road surface, including those ill-maintained rural India patches. Braking is car-like as well. Overall, the brake feel is linear & predictable. 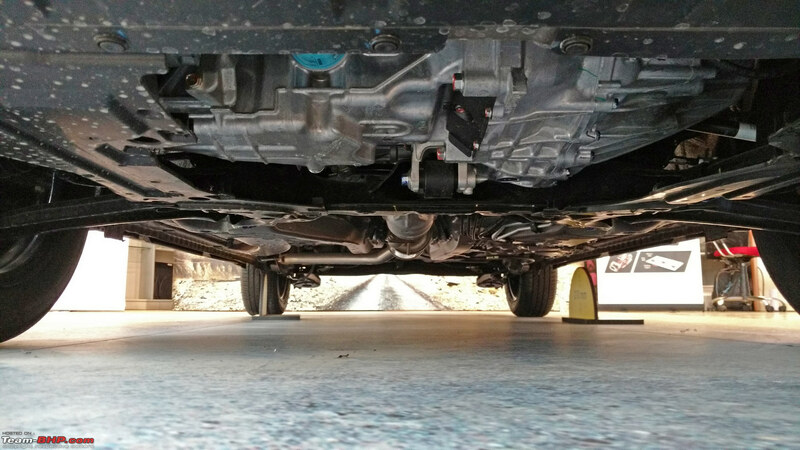 We slammed the brake pedal at 100 kph and the BR-V stopped in a straight line, with the rear end staying tidy. No sliding out or anything negative of that sort. We observed that ABS kicks in a little earlier than expected. Last edited by Aditya : 6th June 2016 at 06:35. • We haven't driven the Petrol MT yet. It's expected in Mumbai soon & you can expect its review in June. 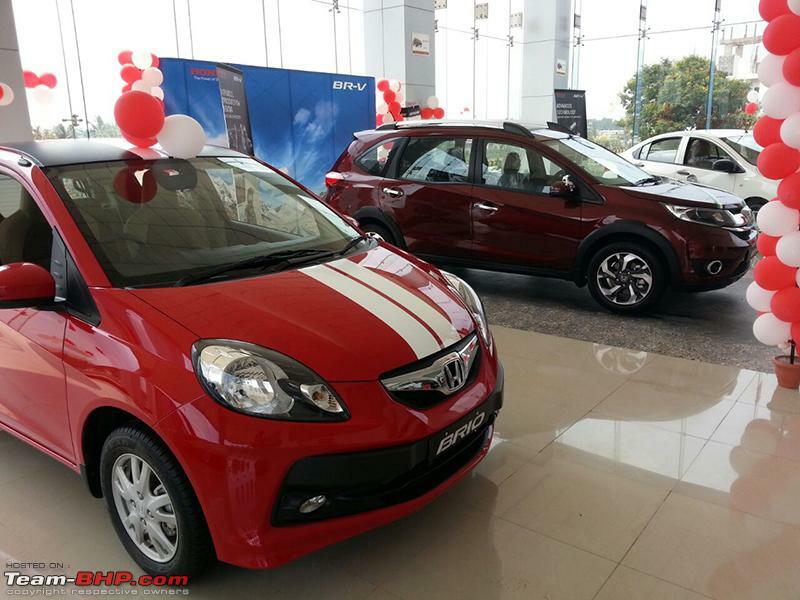 • Honda appears to have instructed its dealers to move the Mobilio off showroom floors. 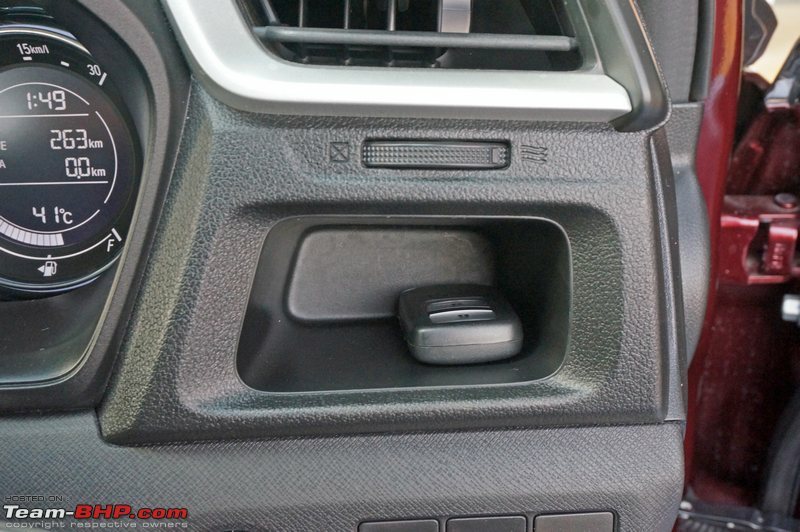 A lot of BHPians who checked out the BR-V said that the Mobilio was nowhere to be seen! Considering how much the two cars have in common, that's hardly surprising. Honda will now push the Mobilio to the commercial / taxi segment. 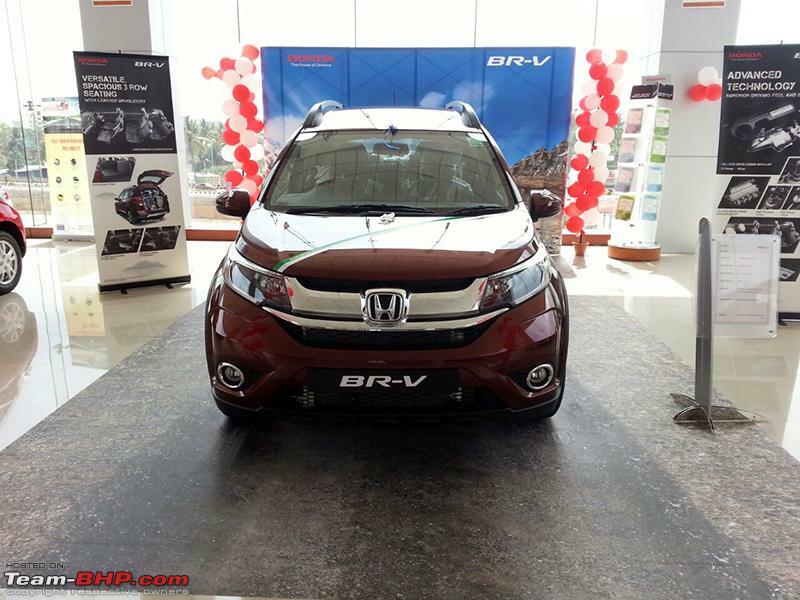 • India will be the third market for the BR-V, after Indonesia & Thailand. 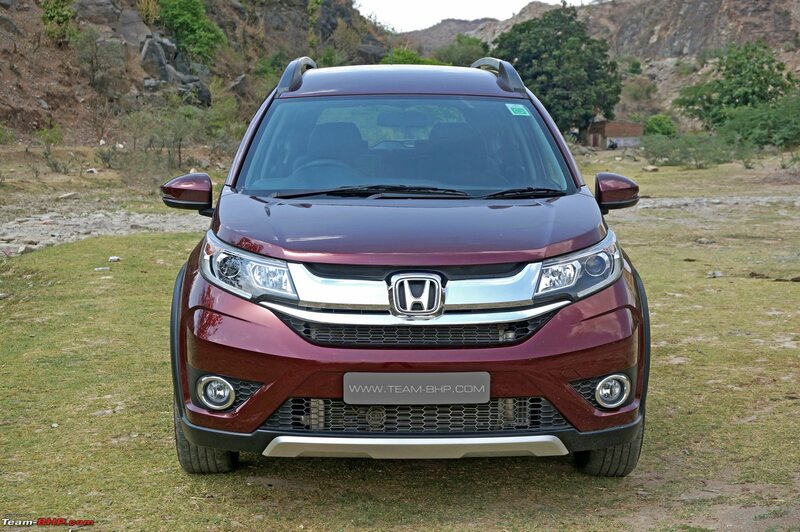 • Built at Honda's facility at Tapukara, Rajasthan. • The BR-V is the only SUV among its direct competitors to come with a 7 seater configuration. This is the car's USP and will work to its advantage. 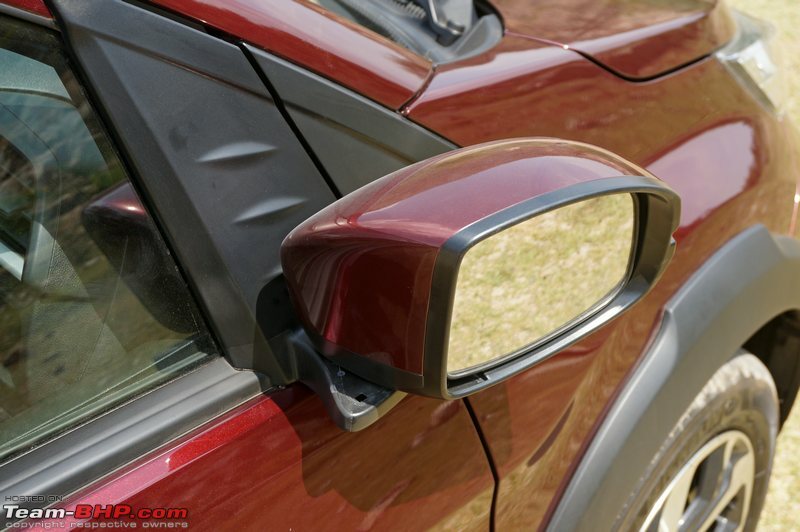 Here's an example of a BHPian's father who switched from the Creta to the BR-V - related link. 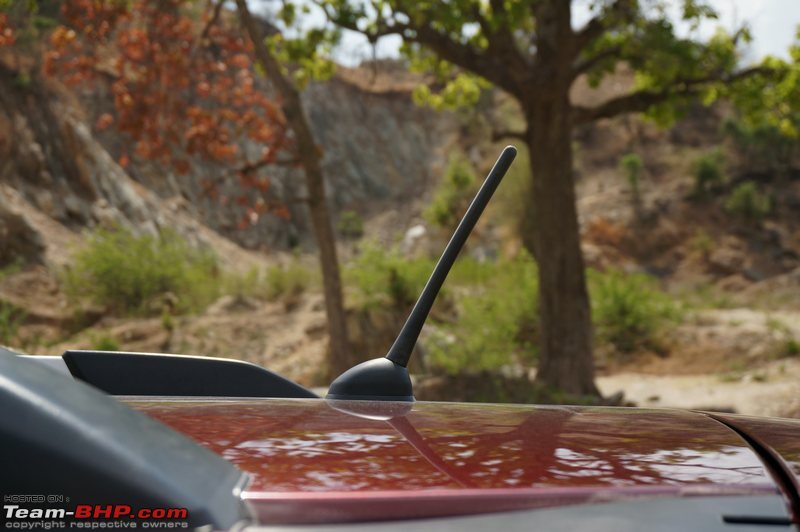 • The lack of a diesel automatic could be a disadvantage, as the Creta & Duster are both offering the combo. • As you would have guessed, an AWD variant isn't on the horizon. 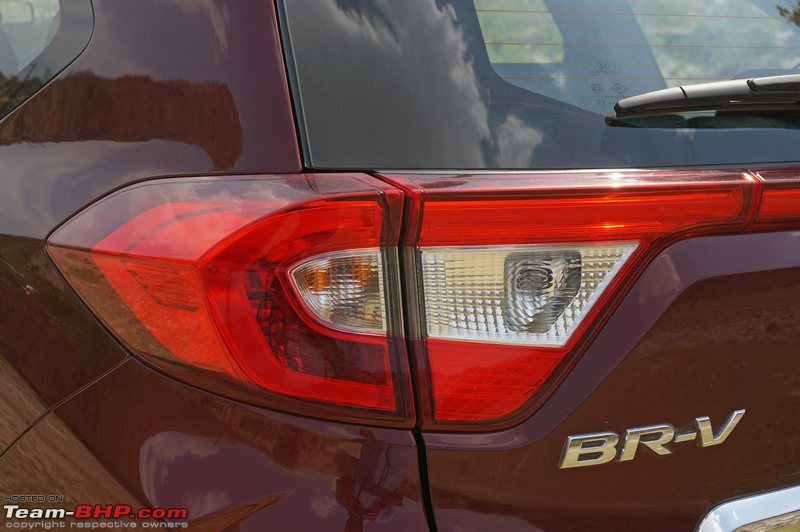 The BR-V is an 'on-road' SUV. • Fuel tank capacity = 42L. 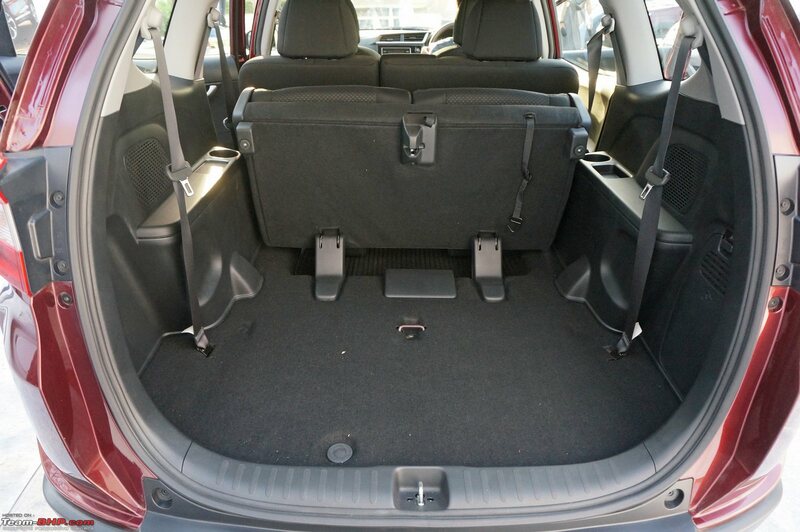 Rather small for a 7-seater SUV. 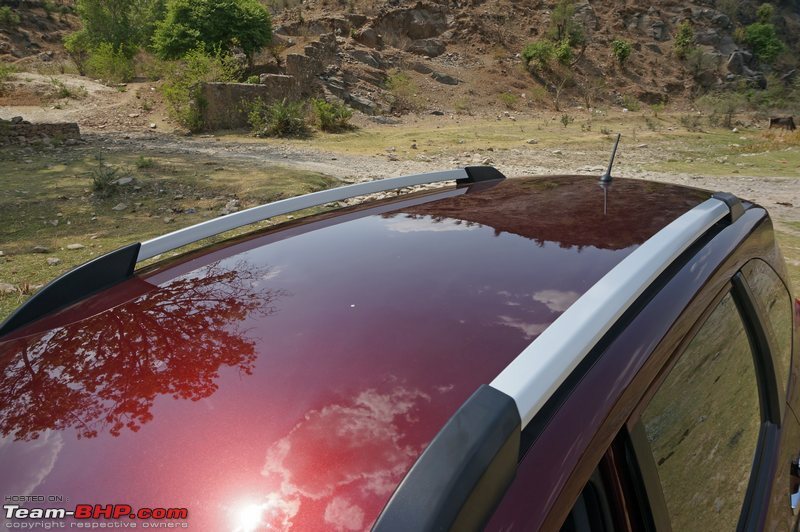 We would have expected at least 50 liters like the Duster. For every 4 fill-ups that a Duster will need, the BR-V will take 5. • Comes with a standard warranty of 3 years / unlimited kms. Extended warranty for 2 more years can be purchased. We're big fans of extended warranties and highly recommend the same. The 7 year option, as seen at this link, will surely follow for the BR-V too. • ABS + EBD are standard on all variants, except the Petrol E trim. 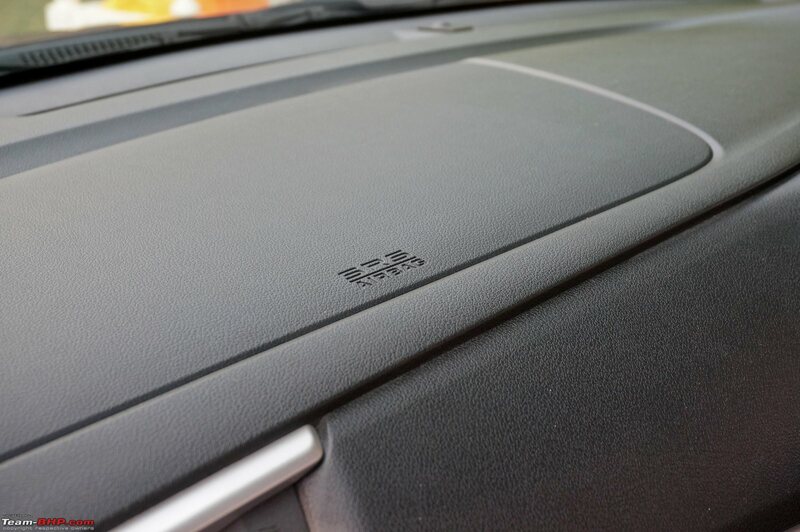 Dual airbags are standard across the range . 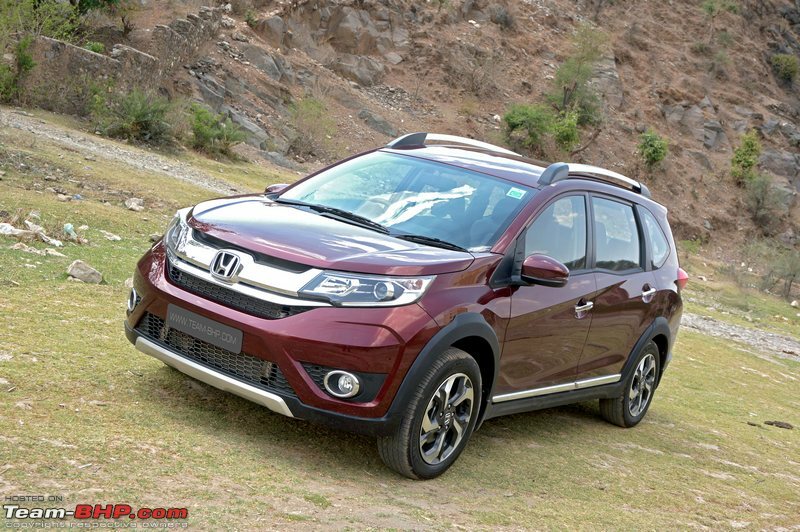 • BR-V with ESC & SBR scored 5 Stars in the ASEAN NCAP crash tests - related link. Variant without scored 4 stars. • Yes, the doors auto-lock at 15 kph. They will also automatically unlock in an accident. • Available in 6 colours - Carnelian Red Pearl, Orchid White Pearl, Urban Titanium Metallic, Taffeta White, Golden Brown Metallic and Alabaster Silver Metallic. • It's strange that Honda is giving the BR-V Petrol a 6-speed manual gearbox, while the City (a more premium car) makes do with a 5-speed unit. We expect the City Petrol to get this 6-speed MT sooner rather than later. • Honda sure wants to drive home the fact that the BR-V has 210 mm of ground clearance. Take a look at this image. Big shoutout to BHPian Smartcat for sharing! 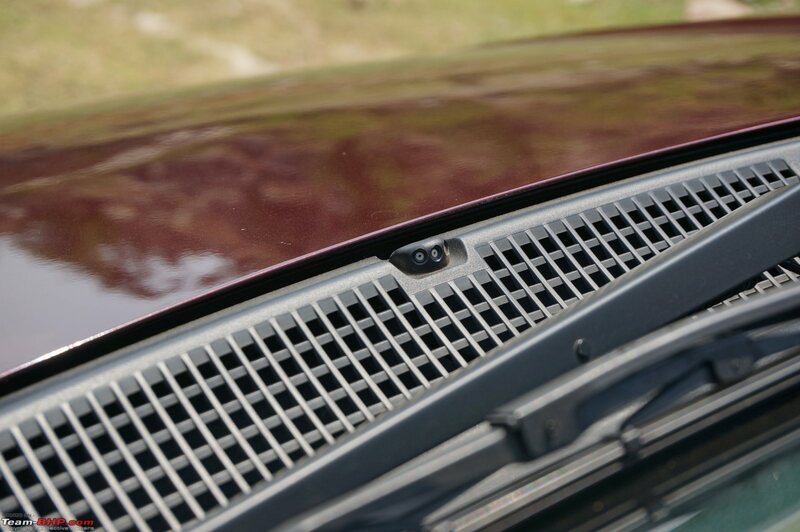 • Reverse parking sensors are available as an accessory. Reversing camera? Not yet. • First service at 1,000 km, second service at 5,000 km, third service at 10,000 km. Then, service intervals of 10,000 km. Initial 3 services are free. 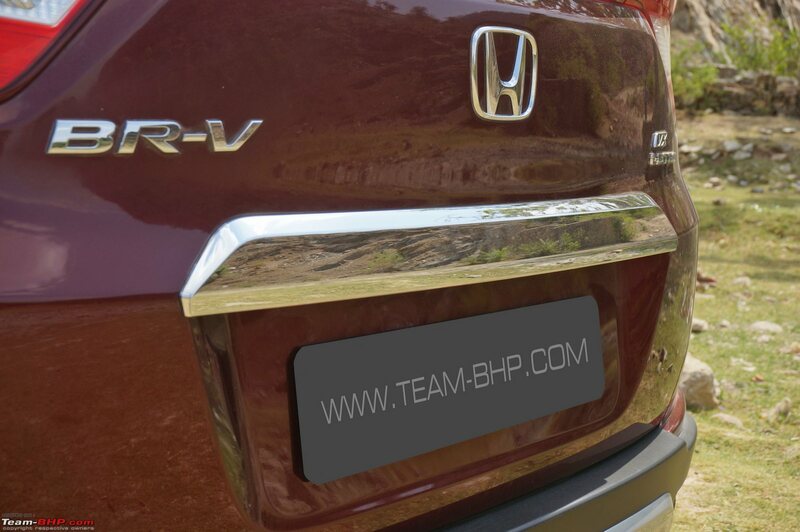 • Disclaimer: Honda invited Team-BHP for the BR-V test-drive. They covered all the travel expenses for this driving event. Last edited by GTO : 27th May 2016 at 10:34. Recommended air pressure is 32 PSI. 2 PSI higher than usual for fuel economy, perhaps? With a full load, you have to pump the rear up to 43! Fuel flap release on the driver's right. None for the tail-gate. The finishing of this hole is so rough & uneven. 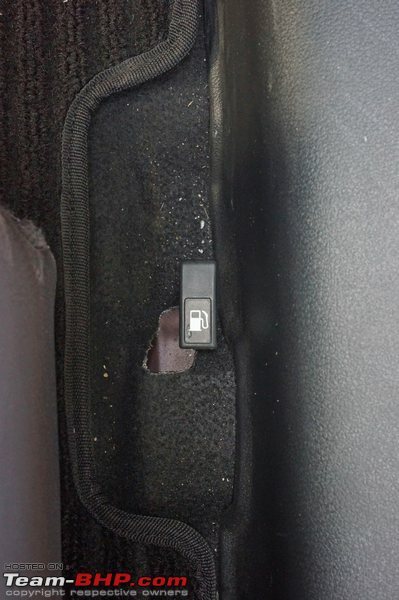 Where's the attention to detail, Honda? Small & basic IRVM. No individual map reading lights!! Last edited by Aditya : 6th June 2016 at 06:36. Thread moved from the Assembly Line to Official Reviews. Thanks for sharing - rating a full 5 stars! Excellent review. Rating a well deserved five stars. 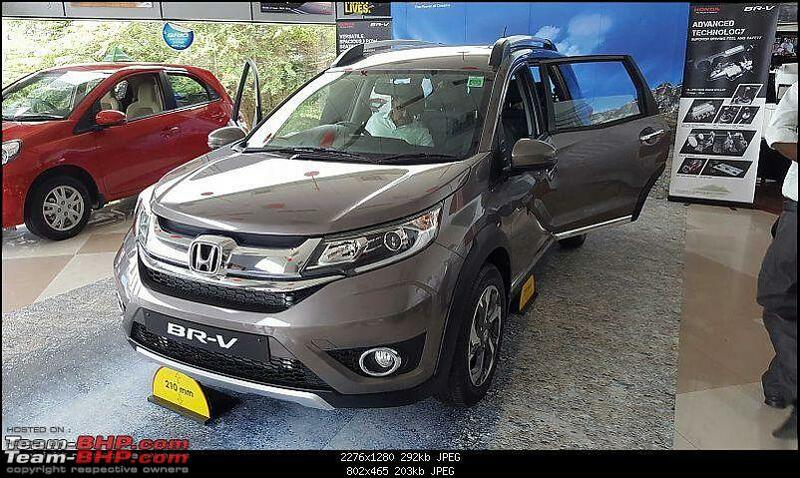 Had a quick look of the BRV at the nearest Honda dealership. 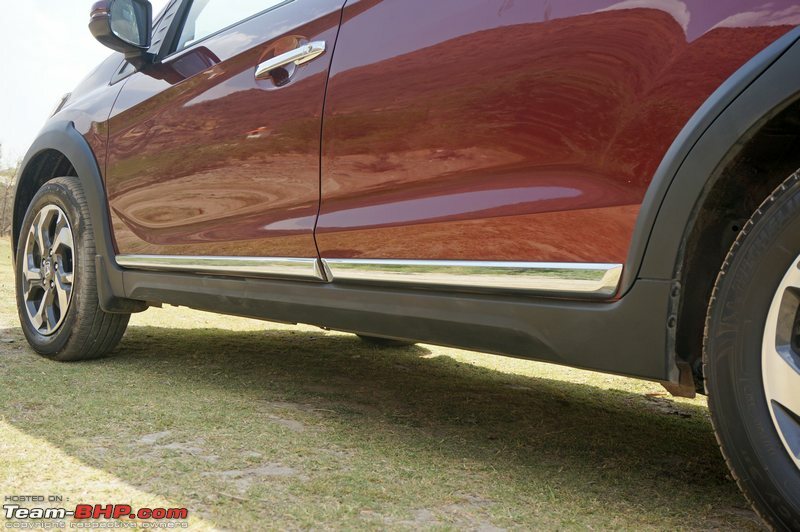 I am a self confessed fan of these small crossovers, as I feel they make a good package for the Indian roads without having to compromise all roads manners for a full fledged SUV, and hence wanted to try out the new BRV as well. + Very useable third row. Good 2+2+2 seater. + Good engine options. 1.5 VTec, 1.5 VTec with CVT, 1.5 Diesel. - Lack of cruise control is a primary deal breaker (for me). 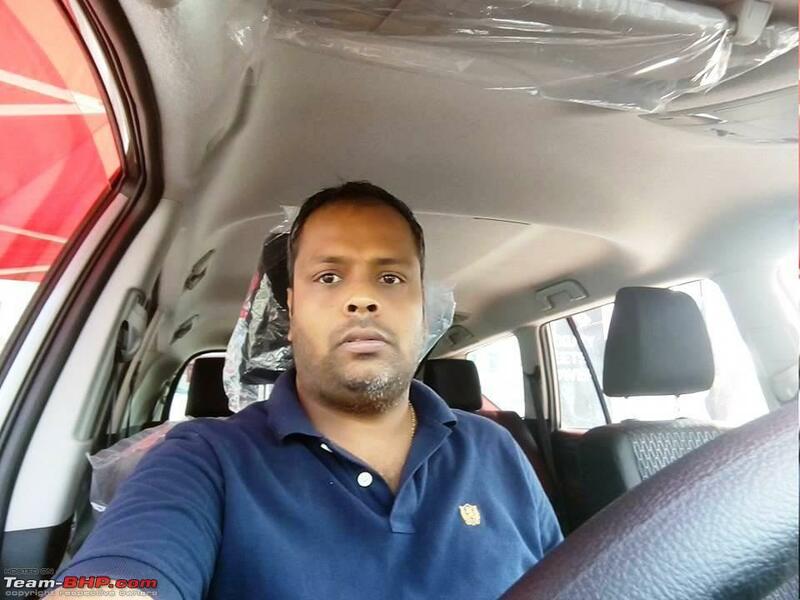 - Features list is spartan - No reverse camera, no reverse sensors, no touchscreen headunit or navigation, no driver armrest, no auto dim IRVM etc expected for a 16L car. Jazz is almost 5L cheaper and comes equipped with a much better equipment list and better comfort for five people. - Price - 16.28L for the top end diesel in Bangalore. Looks good from the front, with little resemblance to the Brio family. The catch here though is that it looks especially great when viewed head on from a similar height (As in most media pics). But height is a serious disadvantage and doesn't have much presence in reality, as seen in pics. Short and narrow proportions along with the huge length makes the car looks more "Mobilio Cross" than compact-SUV. I believe Honda is aware of this as well, and hence given instructions to all dealerships not to display Mobilio inside the showroom for the timebeing. Step inside and the height is both the highlight and the drawback once again, depending on how you look at it. 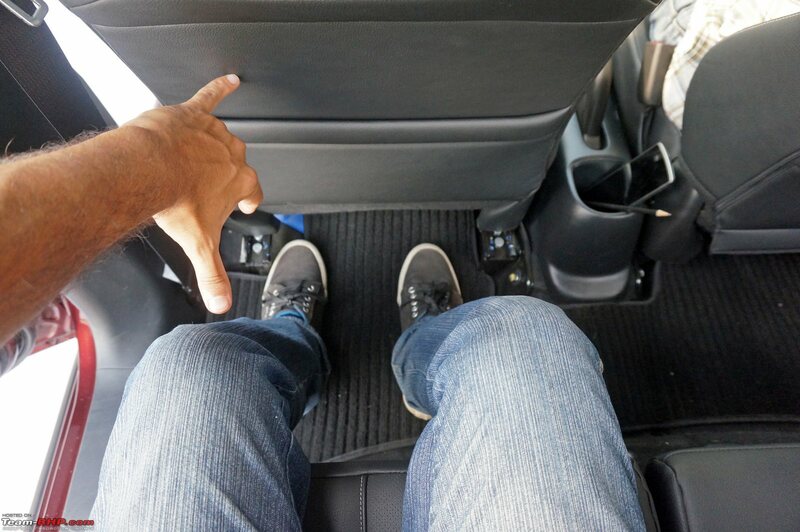 I felt it was very comfortable to walk into the seats thanks to the low seating position.You sit almost as low as in any other cars like the City for instance (shown below). The dashboard layout. 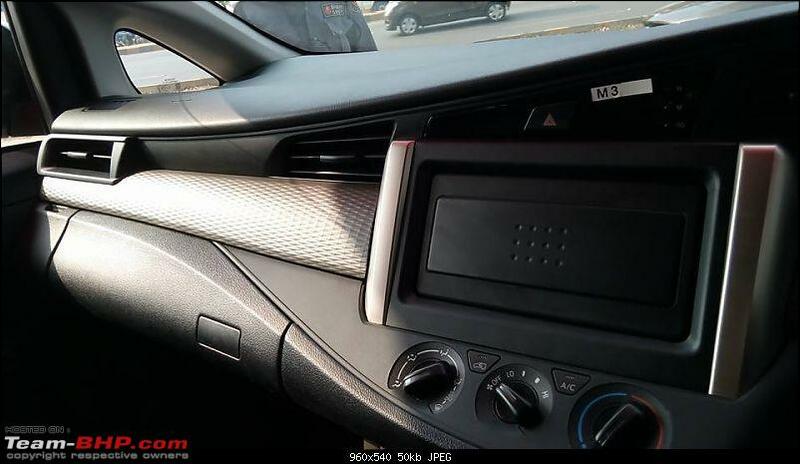 Interior quality was decent and miles ahead of the earlier version found in the Mobilio, but the slider recirculation lever, MID adjustment lever sticking out of the speedometer console and the screen for the music system all look a decade old in design. The car on display was the V variant with the steering wheel shared with the Amaze. Funny incident here though - the SA denied outright there is any change in steering wheel design between variants, even after showing him the difference in design in the Honda brochure. After insisting, he went inside and checked with his lead - and both of them came out and denied it once again. Third row seating was very much useable for my height, but the narrow width makes it a strict 2+2+2 seater. 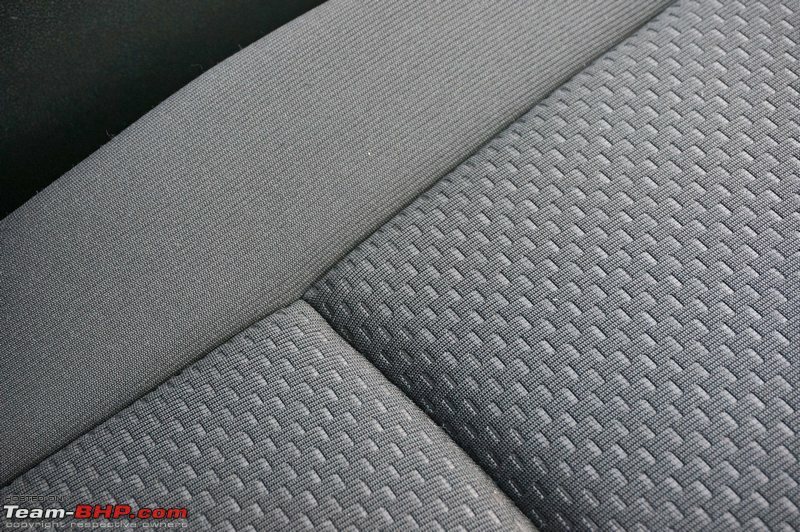 Also note the fabric seats of the V variant. 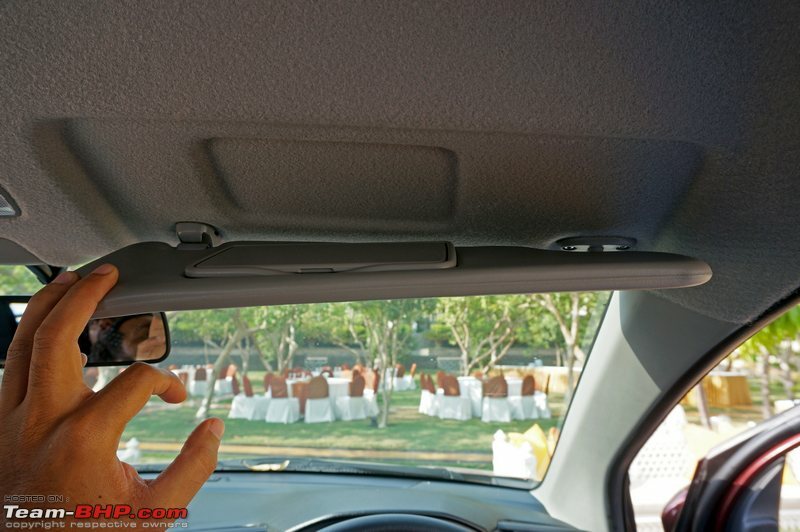 Loved the third row, even compared to the Innova Crysta which I checked out on the same day. 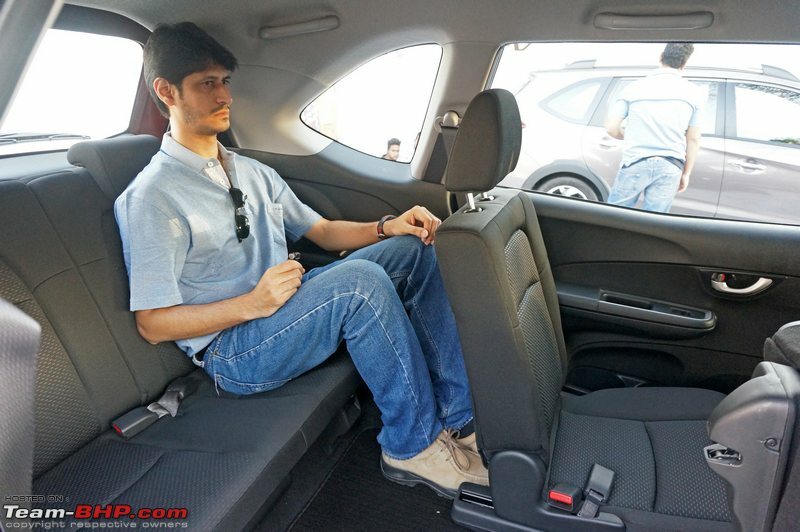 The low height of the vehicle and the lack of a body on frame construction means it is effortless to walk into the third row (Unlike Innova where I had to climb into!) and once seated, the third row quarter glass makes the place feel airy as well. Does it make sense? Well, not for my requirements. Not that it has anything wrong with the product (Lack of cruise control is a deal breaker though), but the pricing is too high and the features list is too sparse. 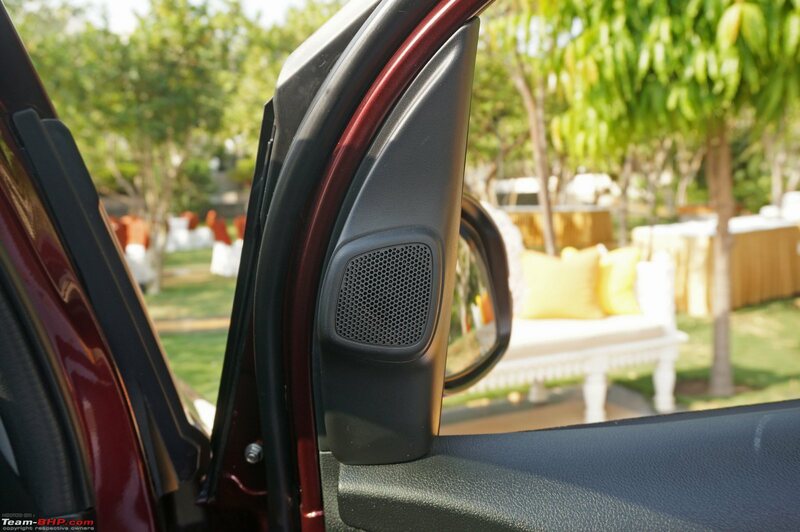 If Mobilio was overpriced to begin with, BRV takes it to a whole new level with very little additions over Mobilio. I would pick the XUV 5OO W6 variants instead. The on road price is around 17.5L for XUV 5OO W6 AT. Thats a price difference of 2.4L in Bangalore when compared to the BRV V Petrol CVT. 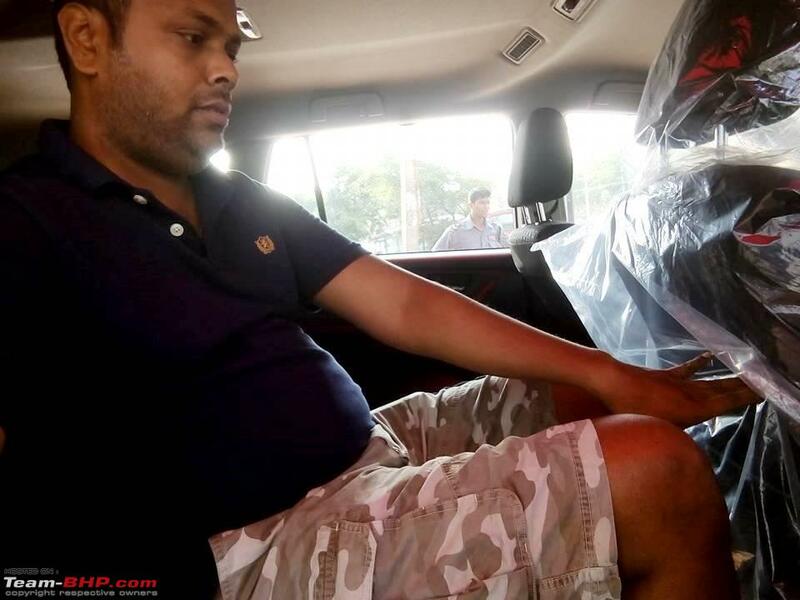 Manual diesel VX variant of BRV which is 16.28L in Bangalore while XUV 5OO W6 is only 16.92L! 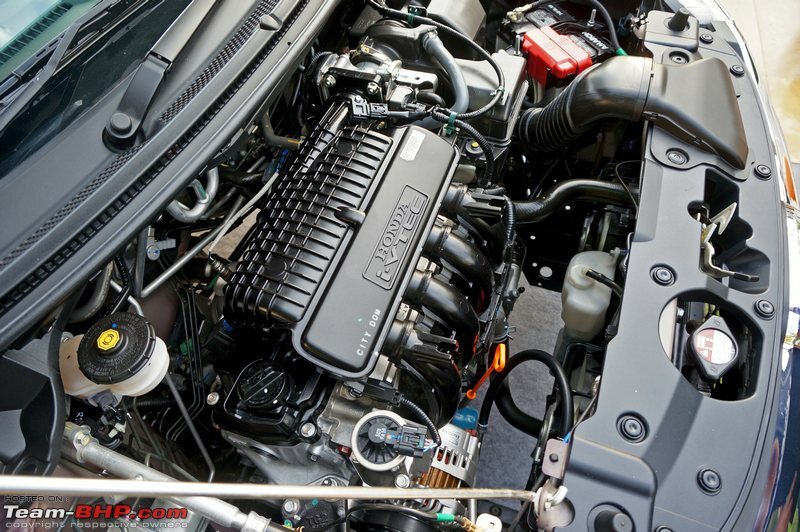 - Diesel engine (BRV petrol CVT v/s XUV diesel AT). - Much more spacious first and second rows. - 2+3+2 seating compared to 2+2+2 of the BRV. 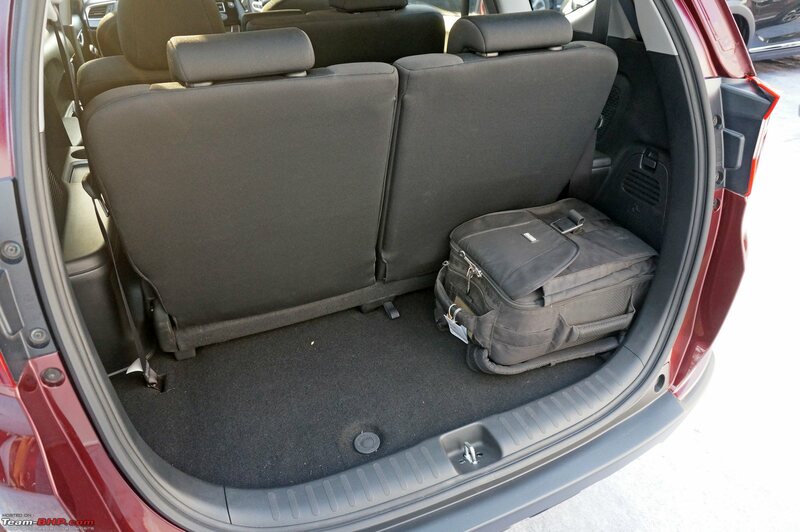 However, boot space with all 3 rows folded is less. 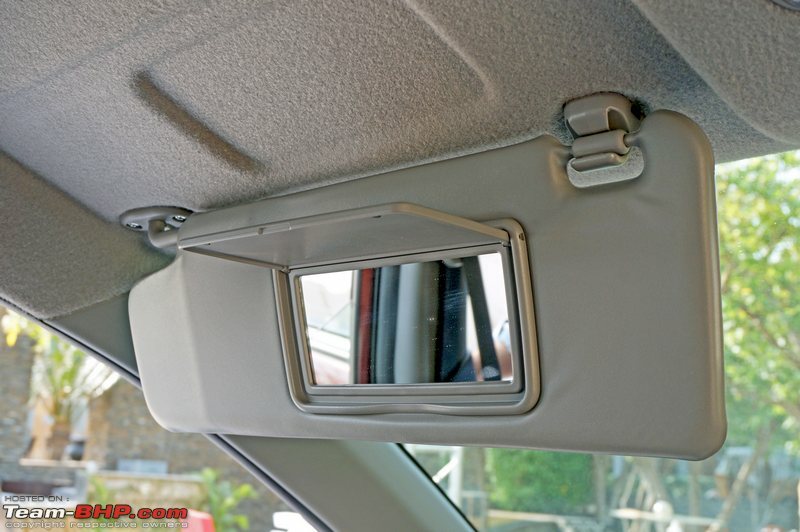 - Automatic stuff like headlamps and wipers. 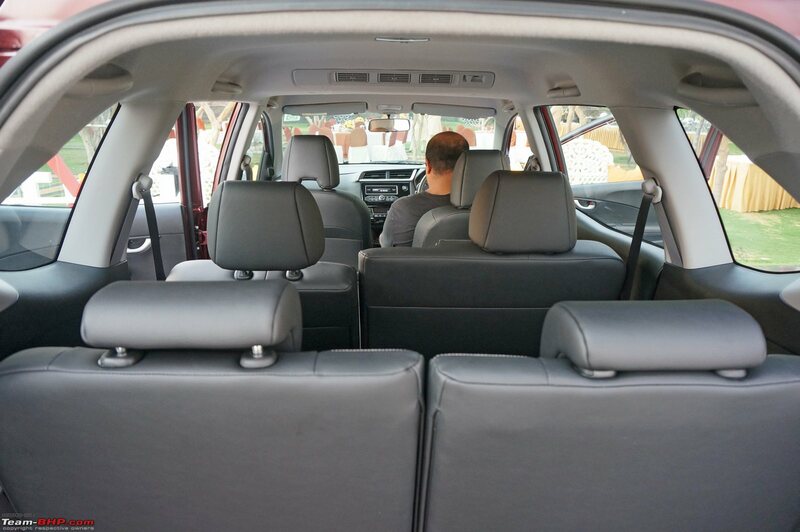 IMO - BRV makes the most sense for people looking for a six seater petrol automatic variant. 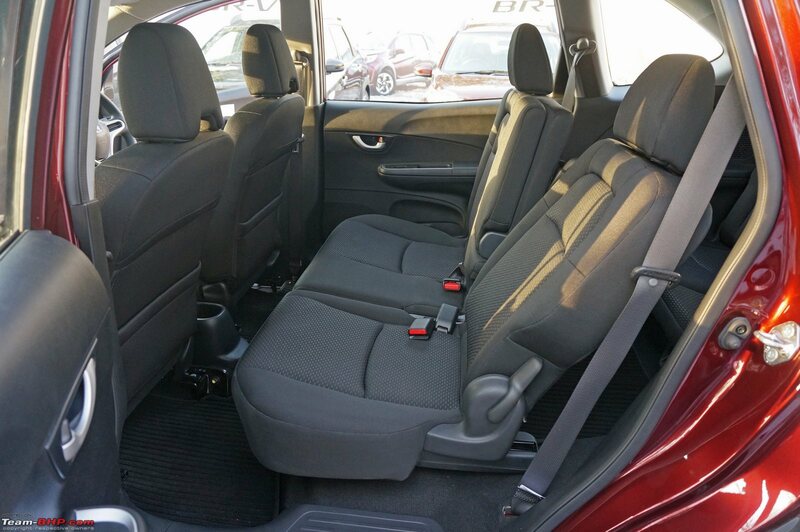 Unless, the sixth seat is important, I would pick the more accomplished and fun to drive S-Cross 1.6 diesel. Last edited by CrAzY dRiVeR : 25th May 2016 at 10:17. 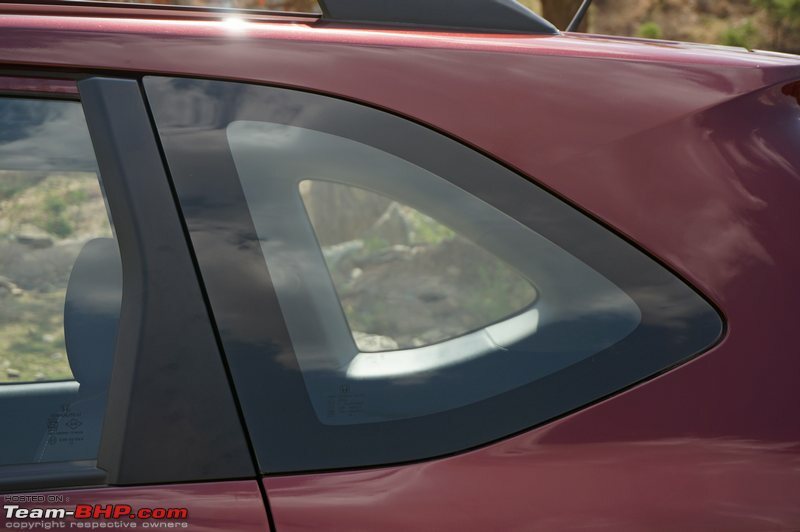 Ertiga is based on the Swift and it is priced lesser than the Ciaz. The BR-V is in the similar league, based on brio but I can't understand why is it priced higher than the city? Probably Mobilio sitting below is the reason for the confusion. IMO Honda should have priced it below the city. 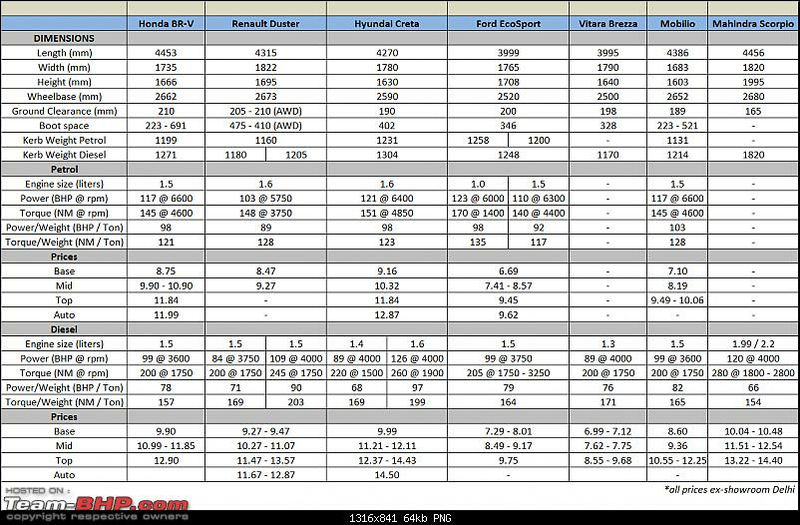 Anyways, if we have to choose between, BR-V, Creta and Duster, following should be ideal selection based on requirement. Last edited by Karthik Chandra : 25th May 2016 at 10:13. 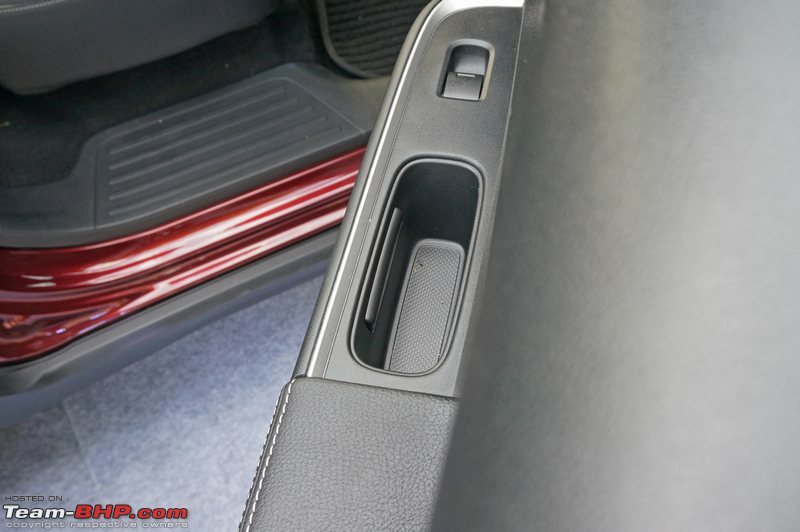 I'm surprised to note that the gear shift is mentioned as light. 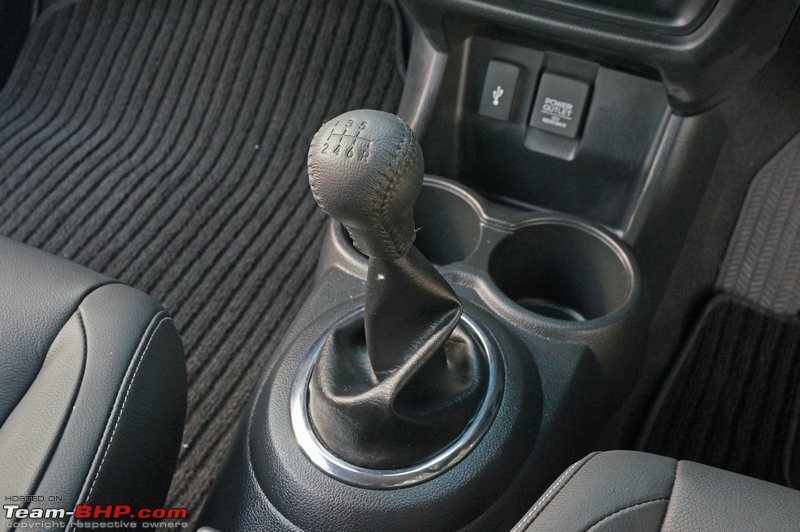 I guess Honda has done something to the gearbox in 2016, cause the one in my 2015 City is really horrible and positively the worst aspect of the car. Thanks for a great review. Loved it, has all the minute details prospective buyers would look for! Rating it a 5 star. 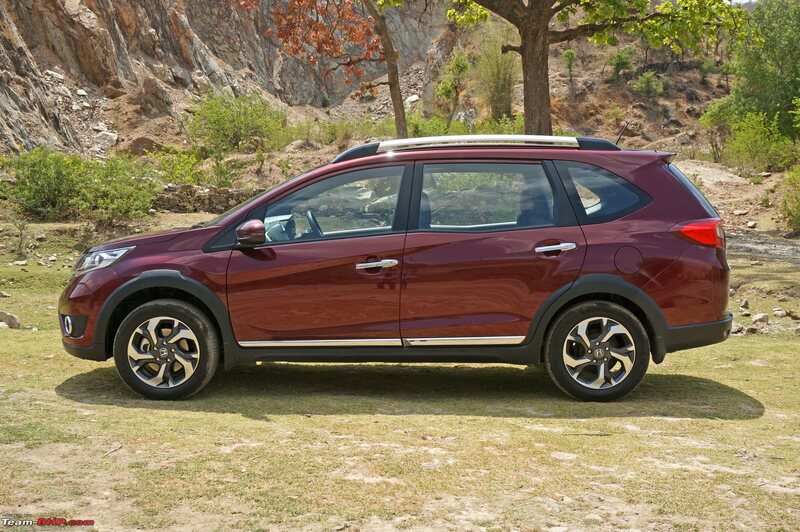 Coming to the car, I have seen a couple of BR-V on road and it has sort of exterior design from the front and back which grows on you with time (except for that pathetic HUGE Chrome Grill). 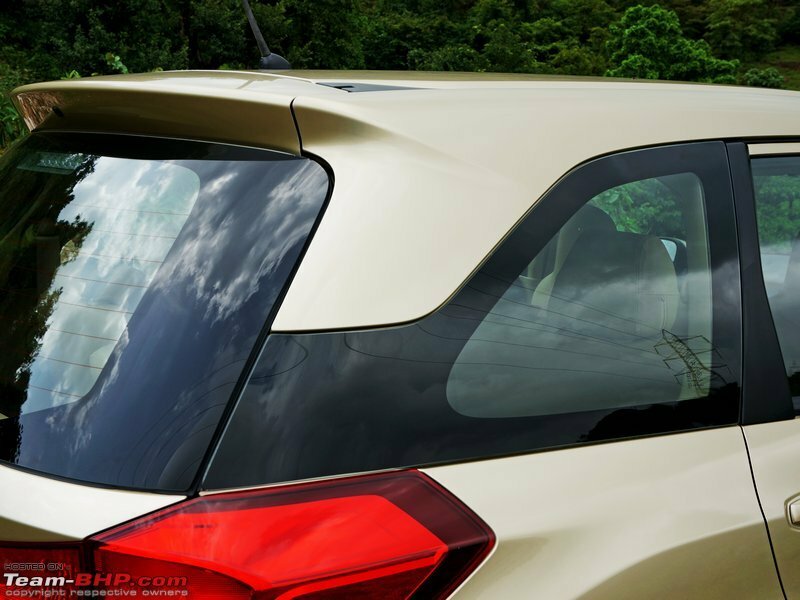 Side profile, there is no denying that this is an MPV, that too very similar to Mobilio! However, what baffle me is the strategy of Honda, Does it makes sense for Honda to have Mobilio and BR-V both in their portfolio? 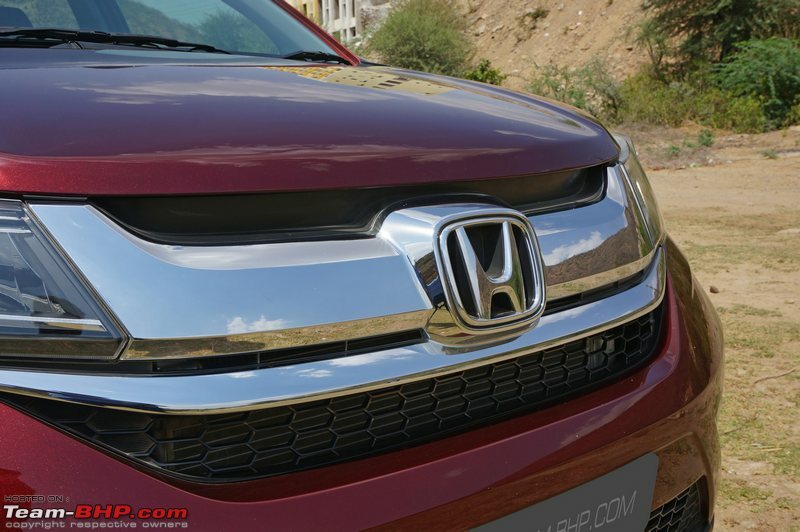 Indian market is heavily shifting towards Cross-Overs and SUVs and it would have been better to have cars like Odyssey and Pilot, which would have brought back buyer's confidence in Honda, of being a premium brand competing in upper segments. Civic and Accord are gone from their portfolio, CR-V barely moves off the shelf. I love Honda as a brand and their recent decision have left me all confused here. Great review Aditya!! 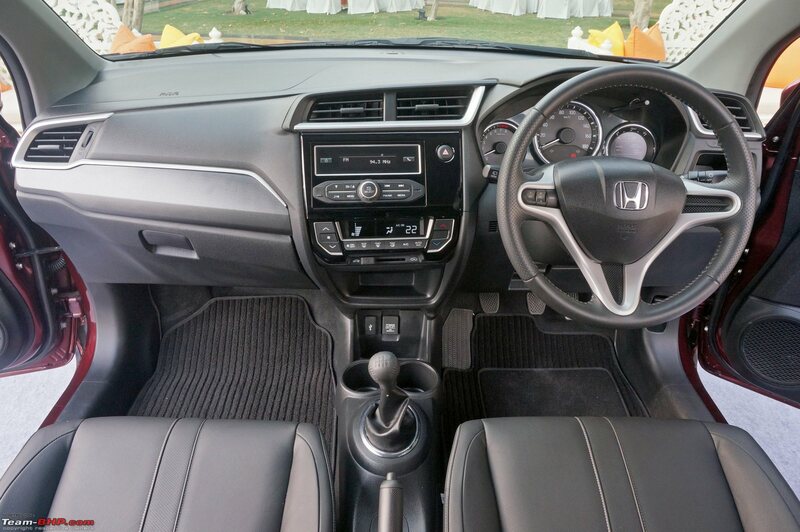 Wish Honda or others stop putting out sub standard interiors, I fail to understand, for a company who provide better interiors in their other car models, cannot accommodate similar quality work in a new launch? They order by the thousands, which works out a lot cheaper than projected. XUV for example, has all the bells and whistles, but all those bells and whistles are just above average at best. 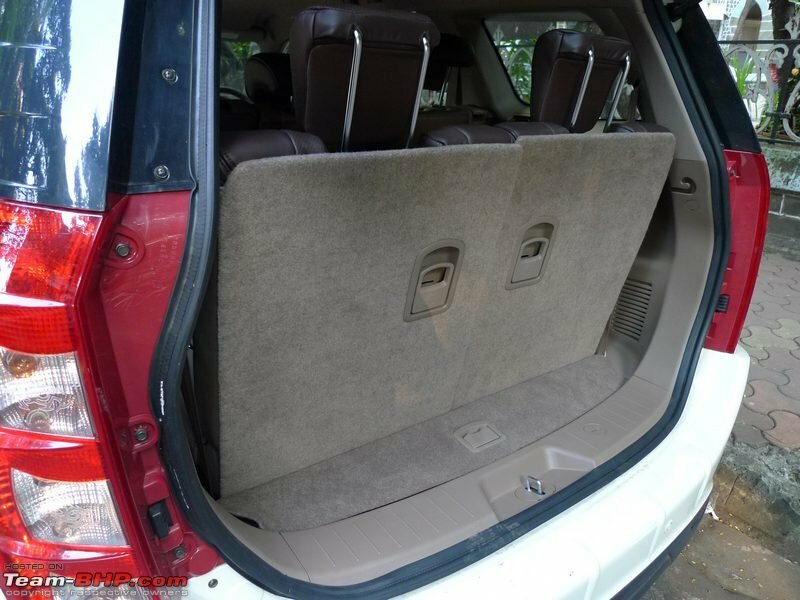 I read this since I am looking to buy myself a 7 seater, tried the Innova Crysta, and felt the interiors were really well built and designed. 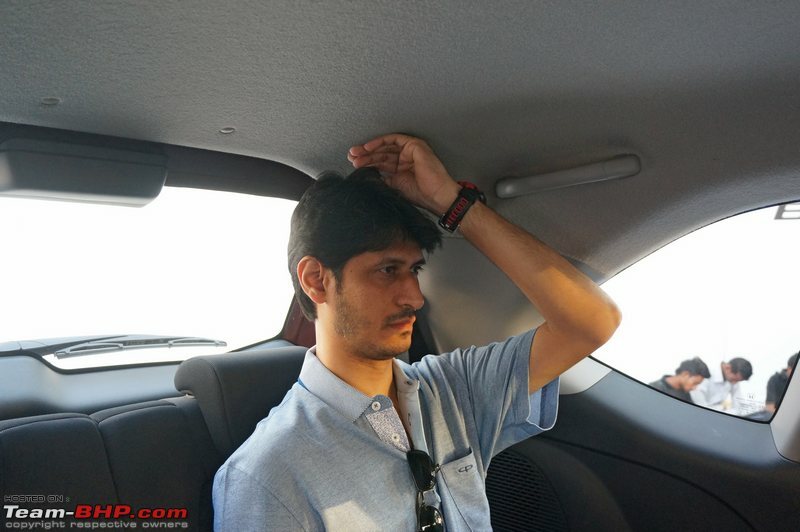 The most important thing for me is good head and shoulder room in the drivers seat (Crysta ticked these boxes instantly), I am 6'2", heavy built and that was relieving. Next was the middle row space, I had set the drivers' seat to my preferences and still could have a comfortable & upright seating position. Before visiting the showroom, I had seen some pictures of the wooden finish offered in some of the variants of Crysta, I was really turned off seeing that, knowing it is fake wooden finish. I was happy to see not all variants have the so called wooden finish, this looks great and felt great to the touch. I don't like the knobs though, feels like a mixer grinder control. 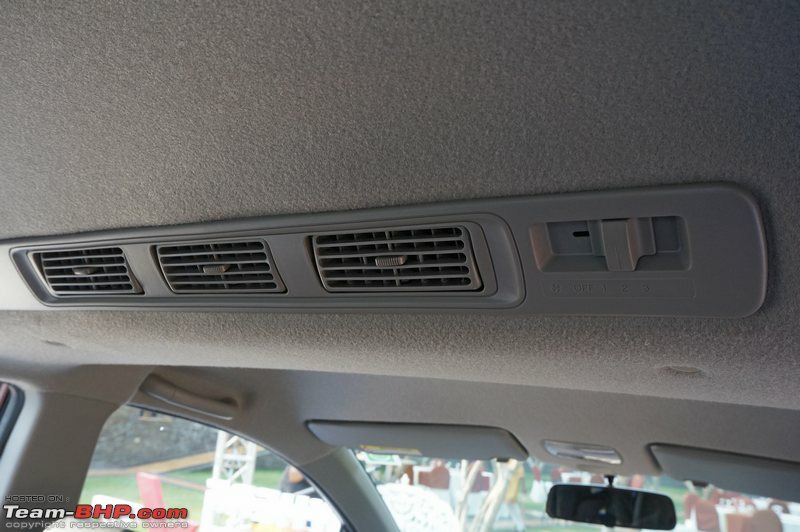 The AC vents are nice and wide and can be closed fully, I really liked the dash as a whole. Overall mid row legroom was really good, the mid hum though is a bit on the higher side, has to be I believe due to the rear wheel drive shaft running through. have to get to a Honda Showroom to try the BRV!! Last edited by gearbox : 25th May 2016 at 10:38. However, what baffle me is the strategy of Honda, Does it makes sense for Honda to have Mobilio and BR-V both in their portfolio? 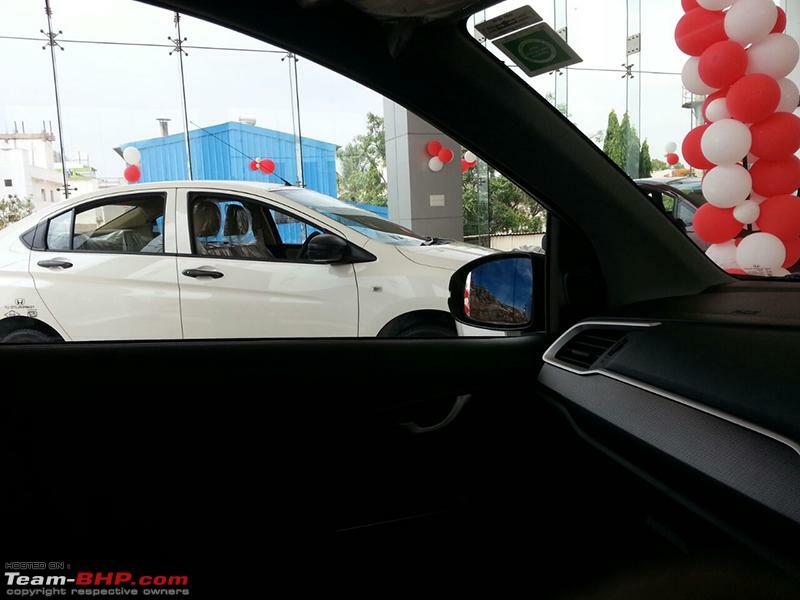 Mobilio will target commercial segment, while BRV will target the private buyers. Currently, Mobilio is not displayed in the showrooms even though it is still on sale, to prevent prospective customers from relating it to the BRV. 1. Do the seats have ISOFIX? 2. Does the CVT have Hill Hold control?